Rather than lumping all these pictures in with the Derelict London Sports Grounds here is a whole new section (of grounds that are beyond dereliction and mostly redeveloped) which I will expand over the coming months. 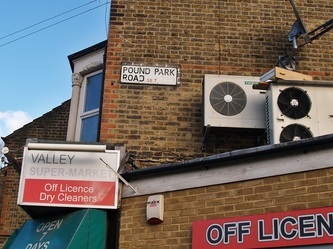 There are many pics floating around on the net of these grounds in their heyday but it often crops up in conversation what do the grounds look like now. 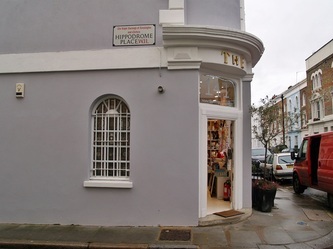 I have included some brief history but those wanting to dig deeper can find copious amounts of further information on web forums/sites and books on the subject matter (for example, books by Simon Inglis, Ed Glinert & Norman Jacobs). 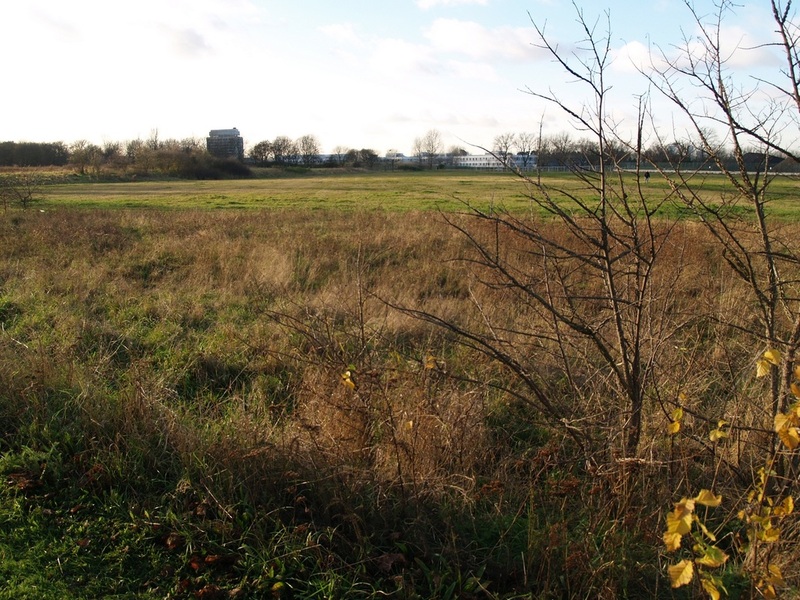 I am starting off with some football grounds but expect cricket grounds, dog tracks, speedway stadiums and so on as I keep adding to this. 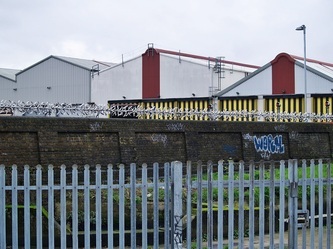 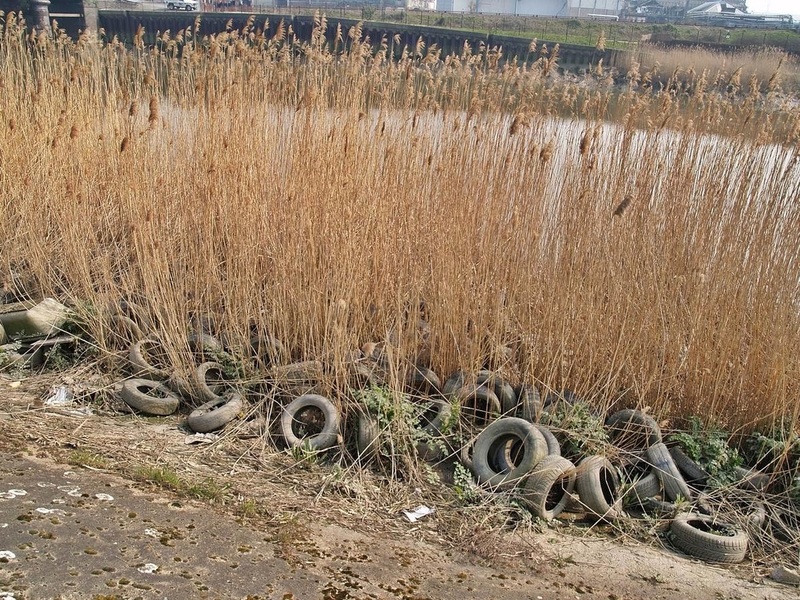 In 2013 I shall be giving a guided walking tour of the Isle of Dogs and will be covering the old Millwall grounds & Docklands Arena along with the old docks and canal, the mudchute, WW2 defences & the old ropeworks. 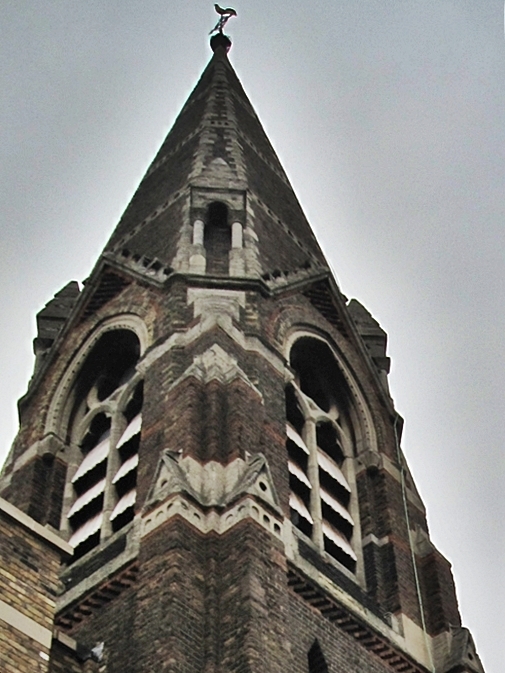 Join the mailing list to be kept updated. 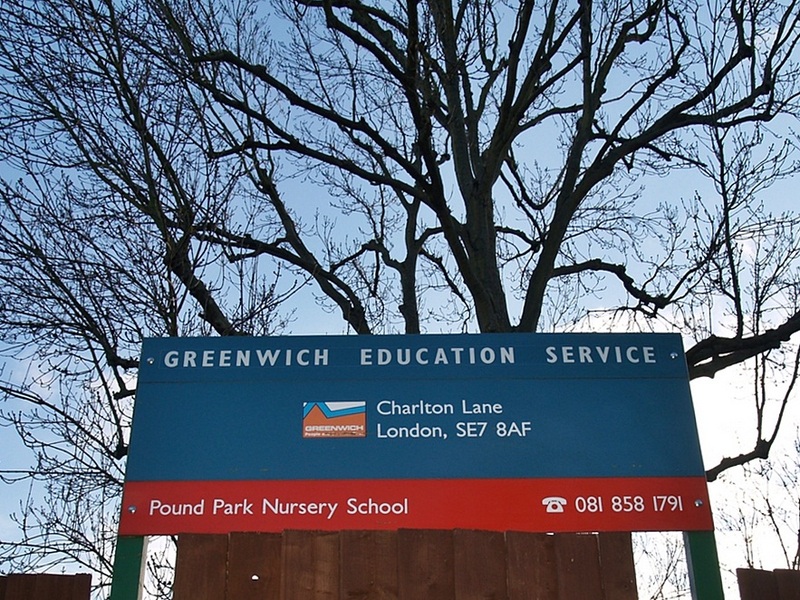 First off on this page we start with Charlton Athletic, a SE London team who still play close to where they originally started. 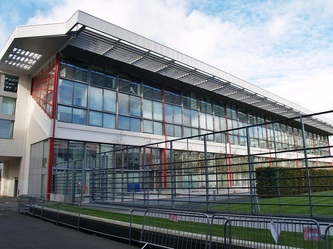 The club who currently play in the Football League Championship was founded in 1905 when some youth clubs in the SE London area combined to form Charlton Athletic. 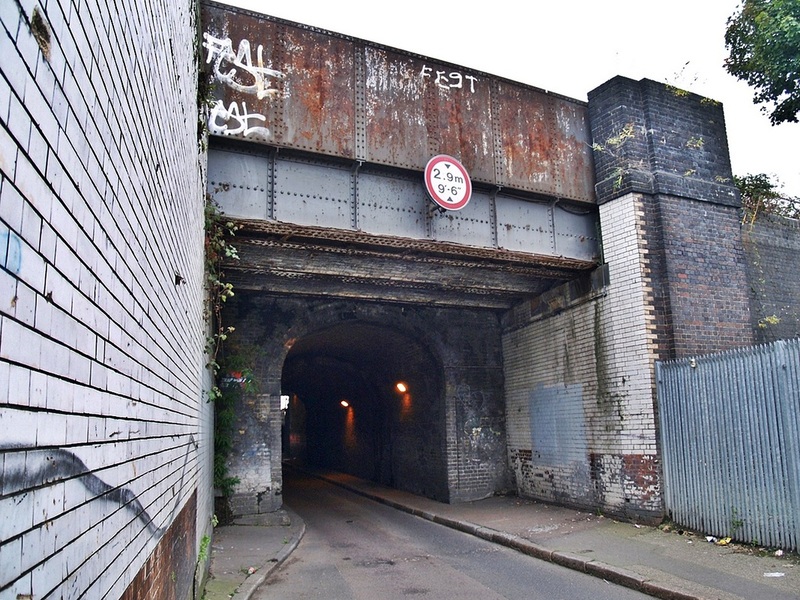 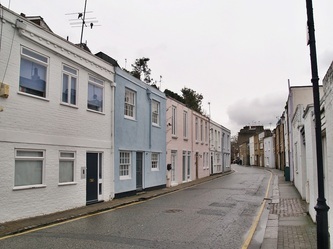 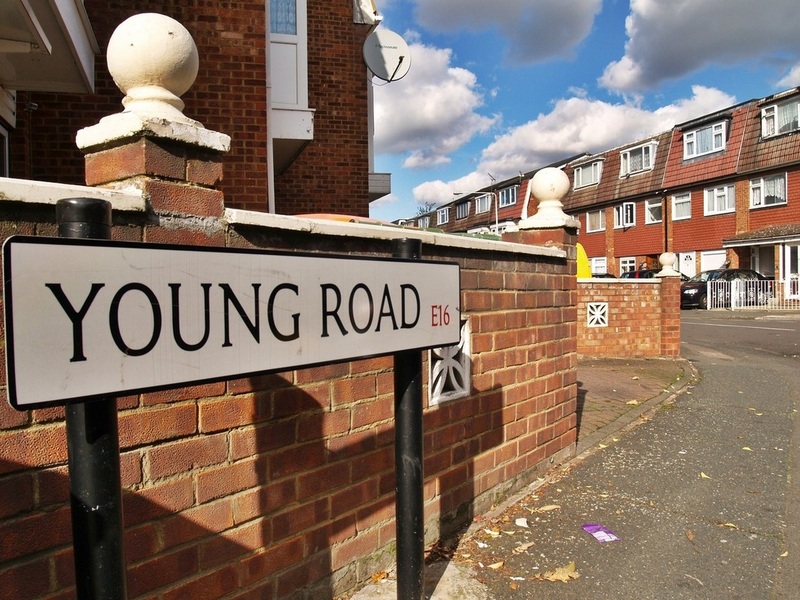 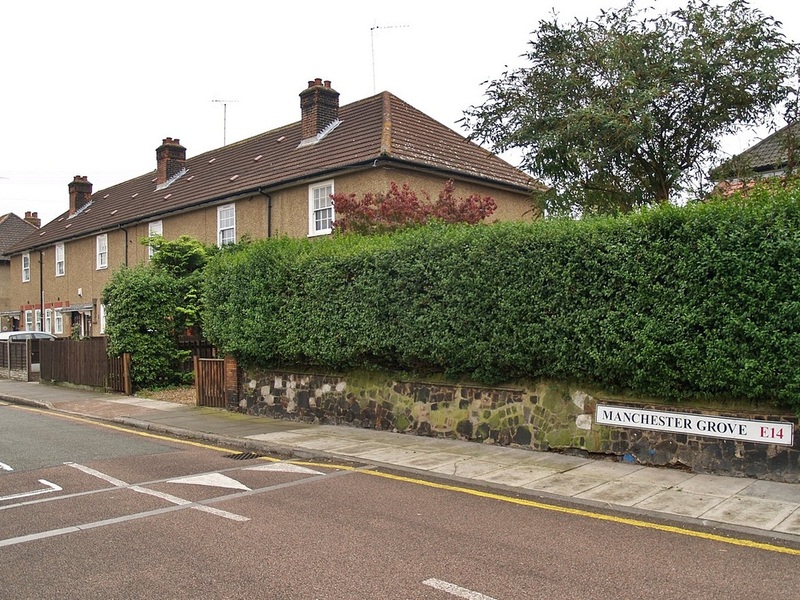 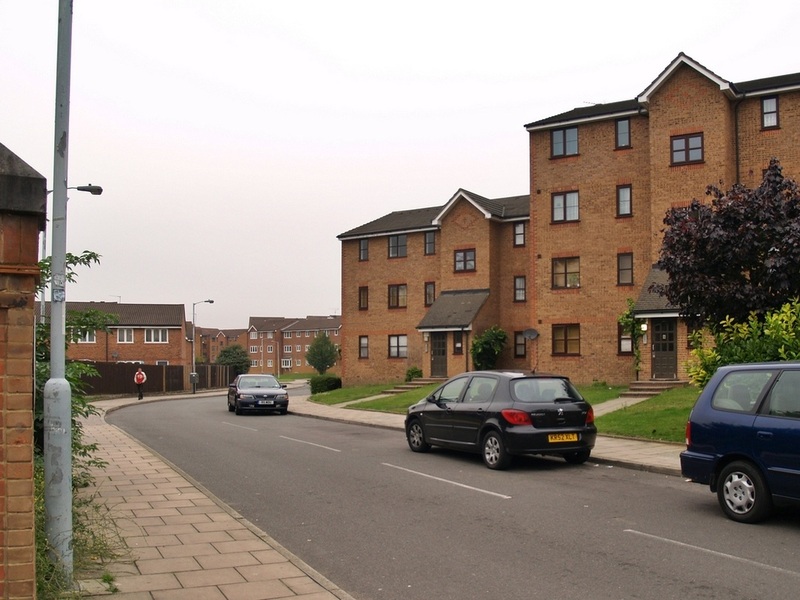 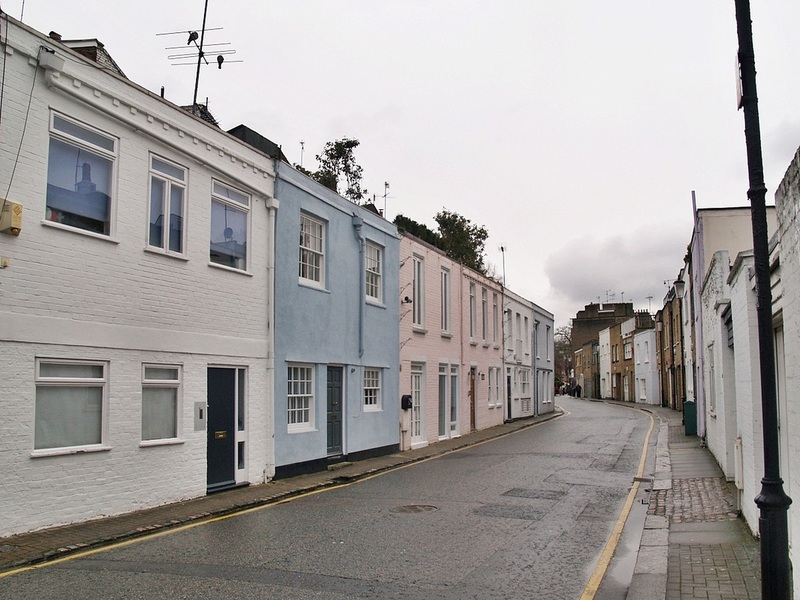 Many of the youths lived in what was then residential housing in East St, Charlton which is the modern day Eastmoor Street a run down light industrial estate and entrance road to the Thames Barrier. 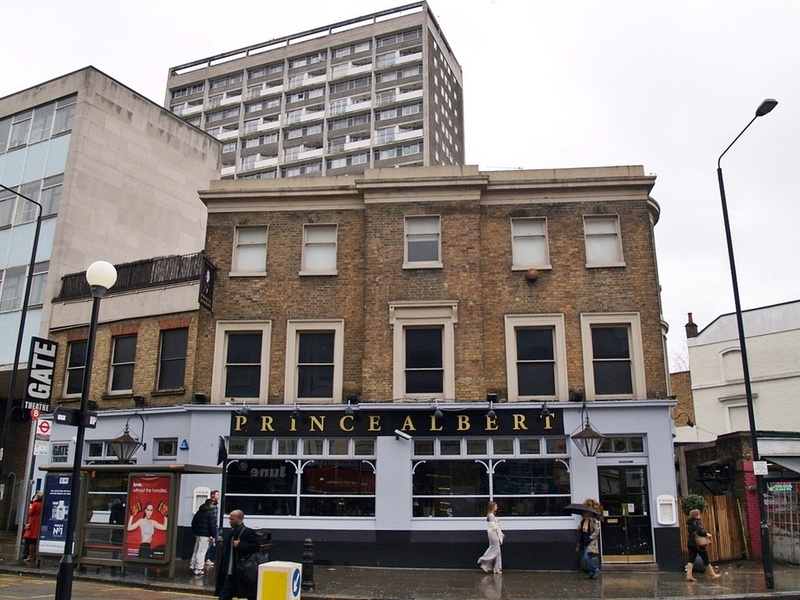 A committee was set up and the first HQ was in the now demolished public house called The Crown. 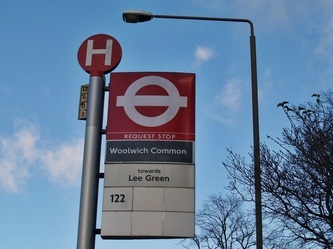 Greenwich who made fire engines and tram engines). 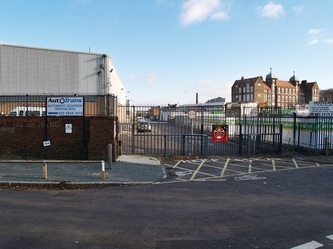 A local fishmonger Arthur Bryan was also involved with the committee.Arthur supplied haddock to the players for after-match suppers. 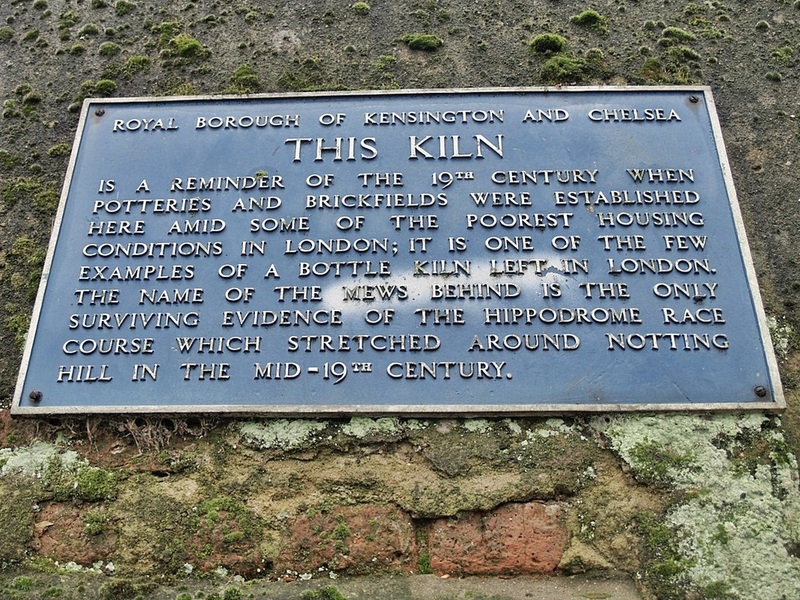 This is confirmed by cartoons from the local papers of the day, and is the origin of the club nickname 'The Addicks'. 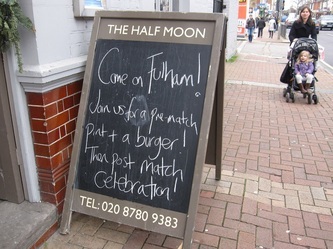 Joe Merryweather, kept the name going by parading around the pitch holding up a board with a picture of a haddock on it. 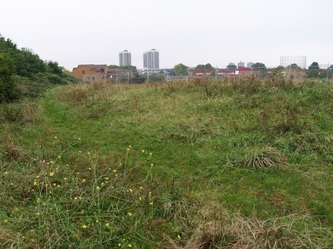 The club's first ground was Siemens Meadow , a patch of rough ground by the River Thames near to the present-day site of the Thames Barrier. 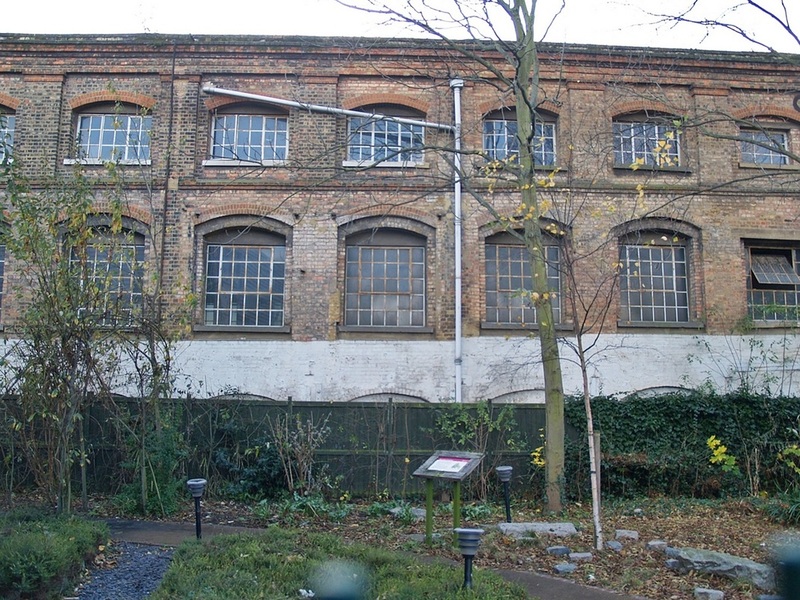 This was over-shadowed by the now demolished Siemens Telegraph Works. 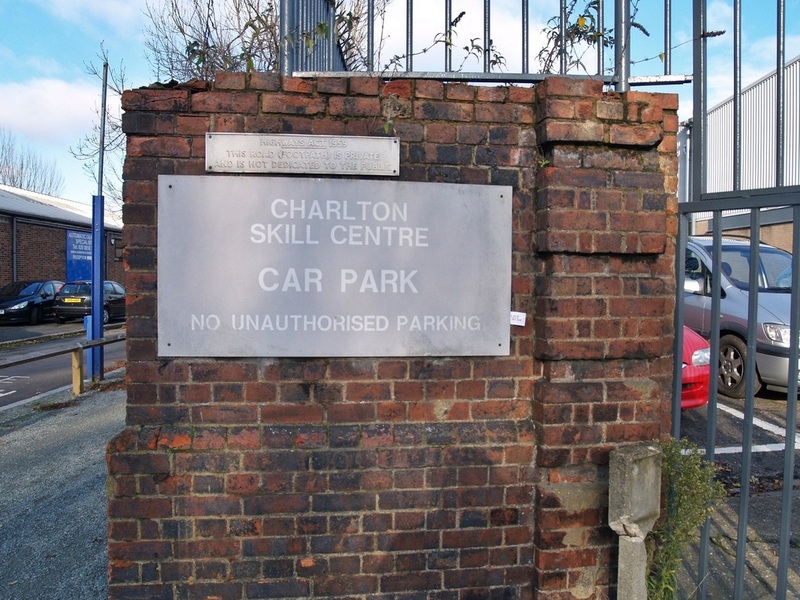 22 December 1905 is the first time a Charlton match is mentioned - a friendly between Charlton and Silvertown Wesley ended with a 6-0 Charlton win according to a report by the Kentish Independent. 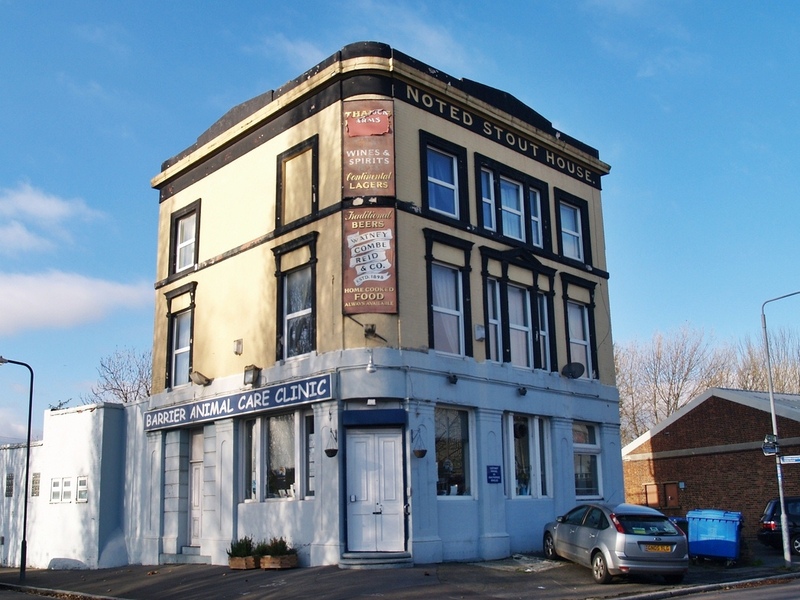 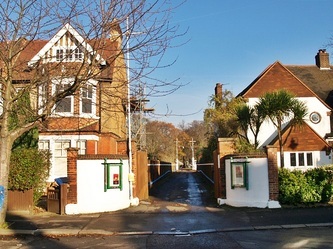 The Barrier Animal Care Clinic was originally built as a public house in 1880 and called The Lads of The Village but was later renamed to 'Thames Barrier Arms', when the nearby flood barrier was built in 1982. 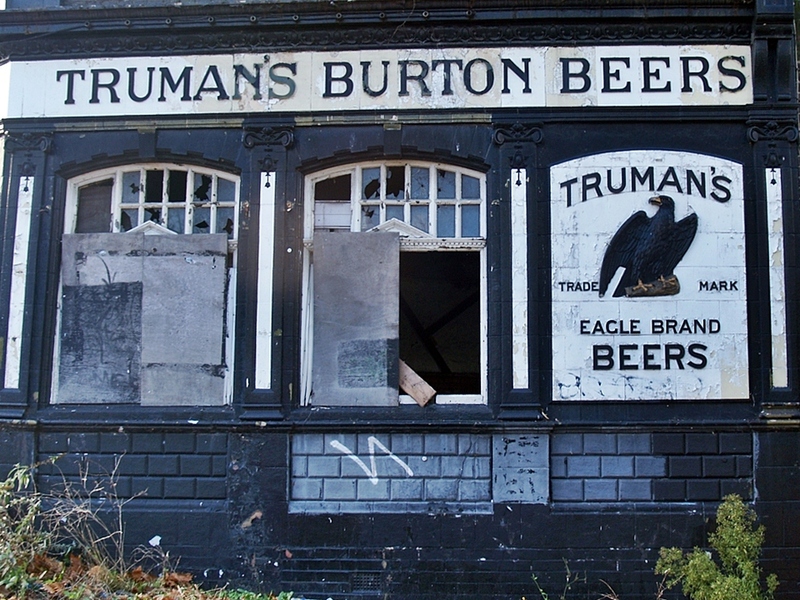 It closed as a pub in 1997. 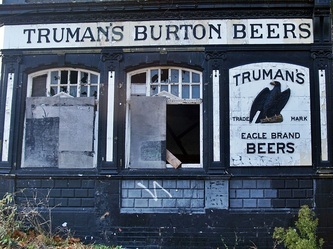 A decaying sign on the corner edge says "Roebuck Arms" but Derelict London reader Bev Smith explains that the the sign is just an abandoned prop after the building was used in filming for an episode of the TV series "Londons Burning". 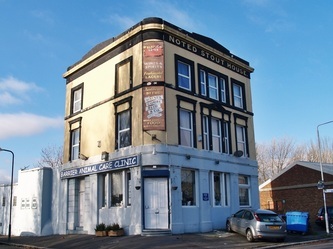 This pub was adjacent to Siemens Meadow and is one of the only original buildings in the vicinity of the old ground. 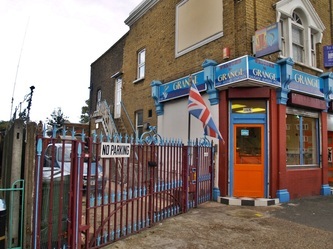 In the late 1970s Charlton fan & journalist Gary Bushell played at this pub with his legendary oi!/punk band The Gonads. 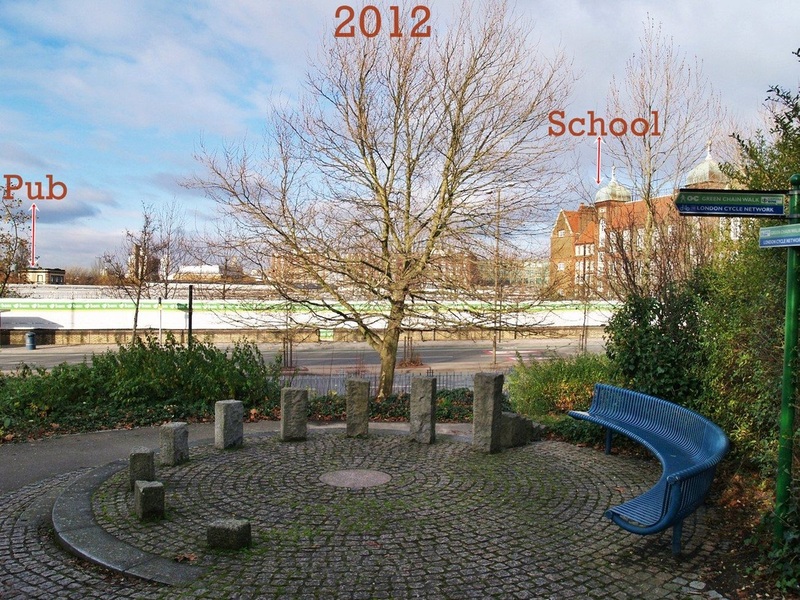 Siemens Meadow - Below is a "then and now" shot of sorts. 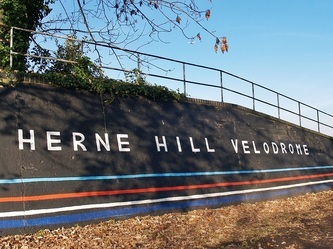 The 1905 pic was one that I found on Wikipedia and for the 2012 shot it was impossible to get a clear shot from the hill on Maryon Park due to thicker vegetation than there was in 1905 so I had to move down the hill and this is the best that I could get... but you get the idea. Charlton played on the grass on the common for a year. 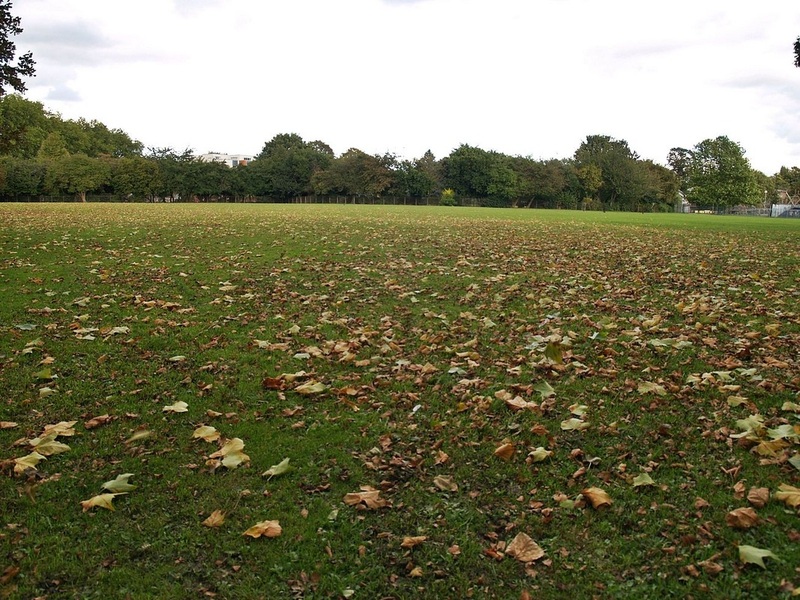 There was no stadium here and the team may have played on various parts of the common. 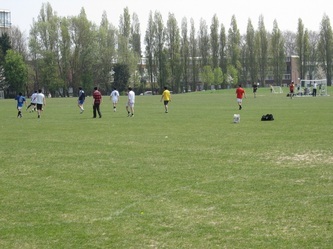 The players even had to carry the goaplposts themselves for over a mile as part of the pre match warm-up. 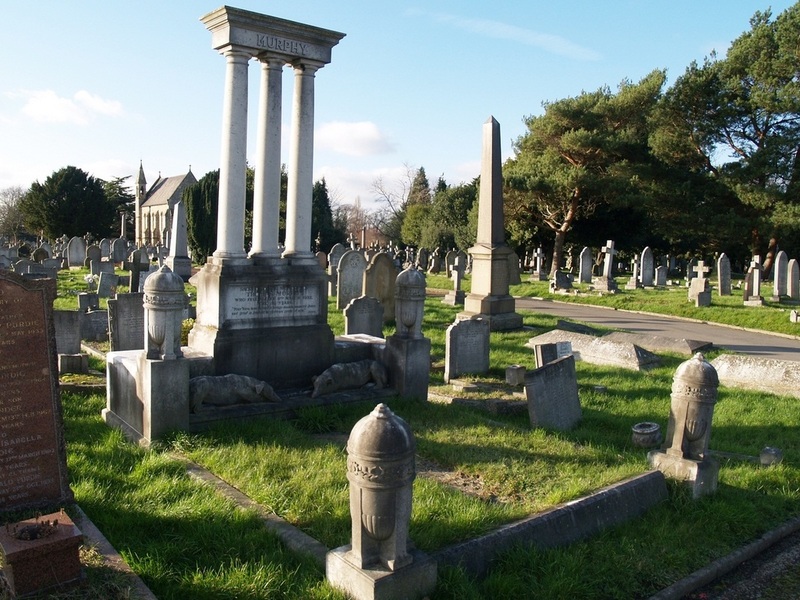 In 1908 Charlton player Bill Pirie sadly drowned after a boating incident in the Thames. 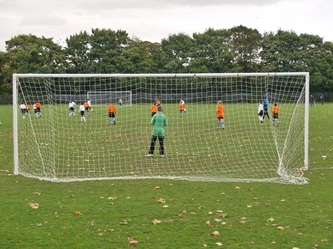 The Easter Monday game was called off and a benefit game was played on April 30th against Bostall Heath Athletic, which ended in a 4-0 Charlton victory. 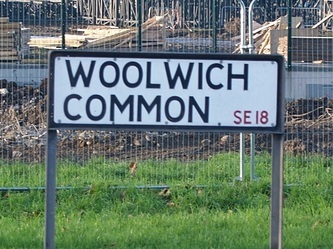 This site is not to be confused with Woolwich Stadium which was not built on the common until 1920 by which time Charlton were at The Valley. 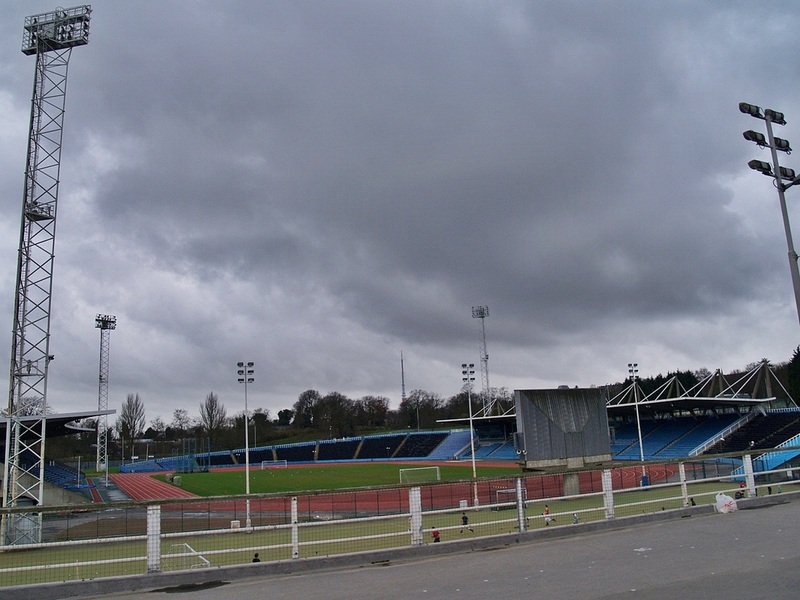 However, Charlton reserves did play at Woolwich Stadium in the 1950s.The stadium which housed 20,000 seated or 45,000 standing was mainly used for rugby, athletics, horse trials & horse jumping and most famously military tattoos. The stadium has been demolished though you can see traces of its outline on Google maps. 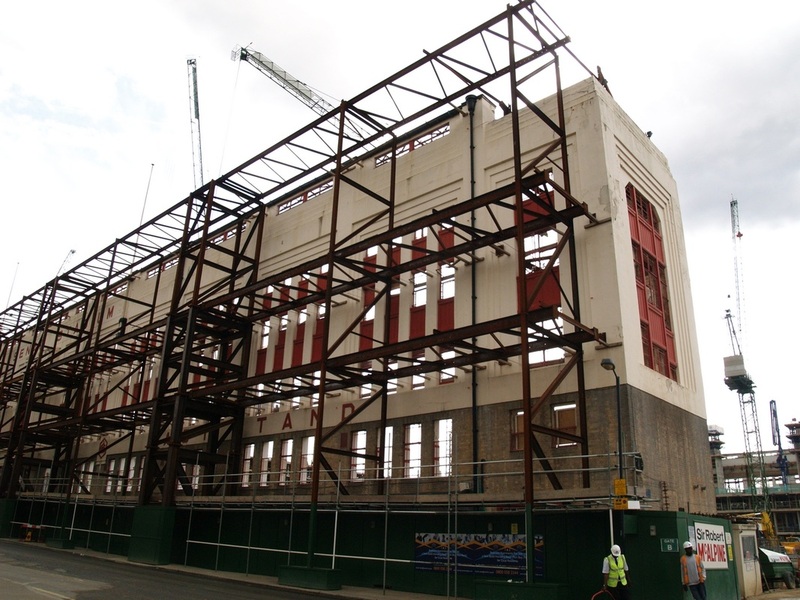 I will cover more on Woolwich Stadium in the future. 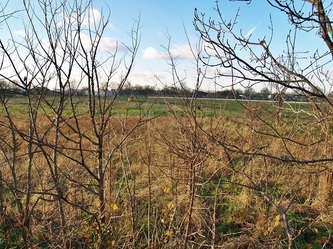 This is an area that was once Charlton’s first public park. 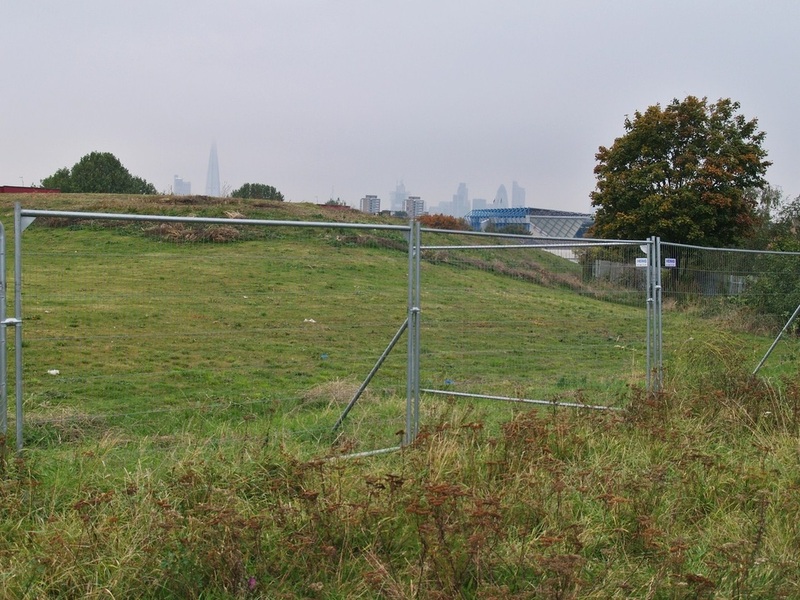 Pound Field was originally used as an overnight enclosure for animals waiting to pass through a toll gate at the junction of Charlton Lane and Lower Woolwich Road. 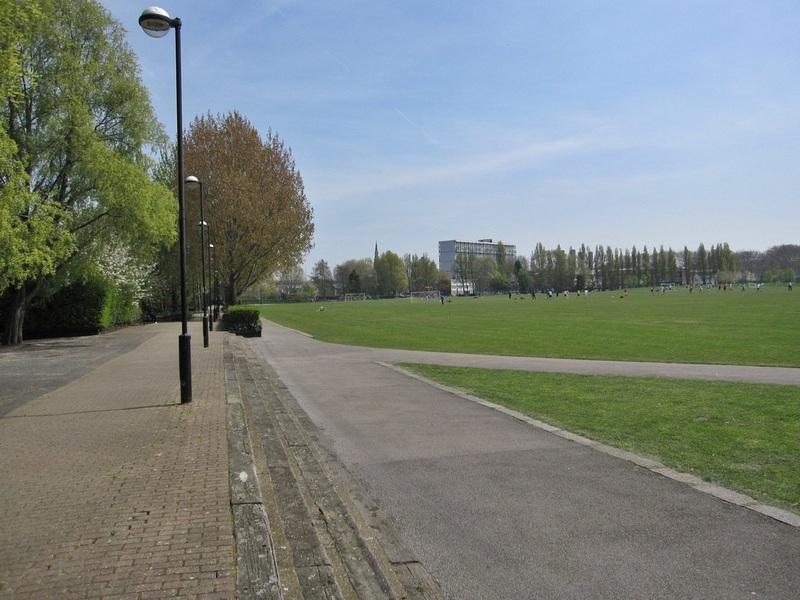 but was opened as a Recreation Ground in 1889 and renamed Pound Park. Charlton Athletic played here for 5 years. 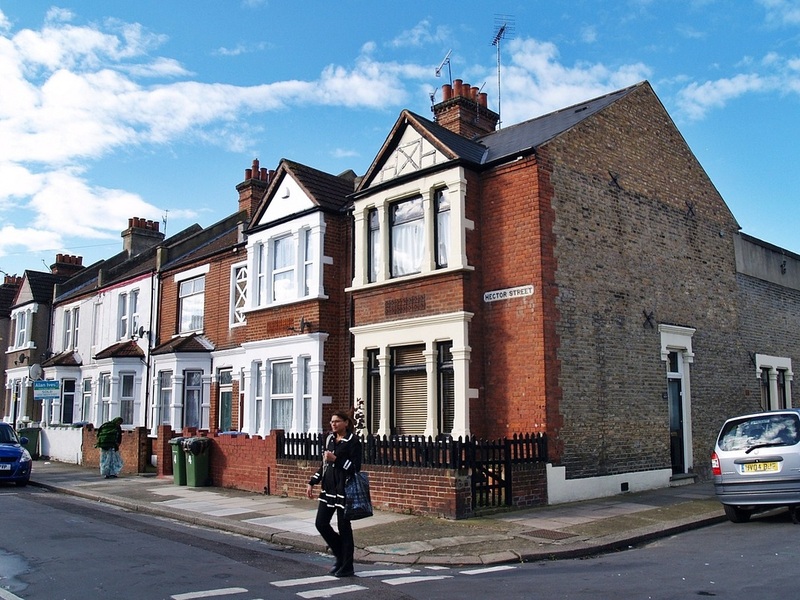 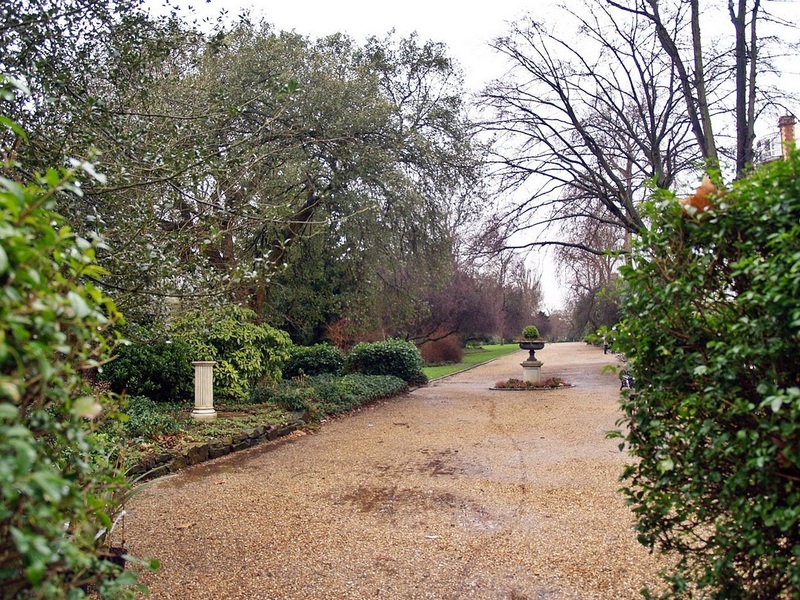 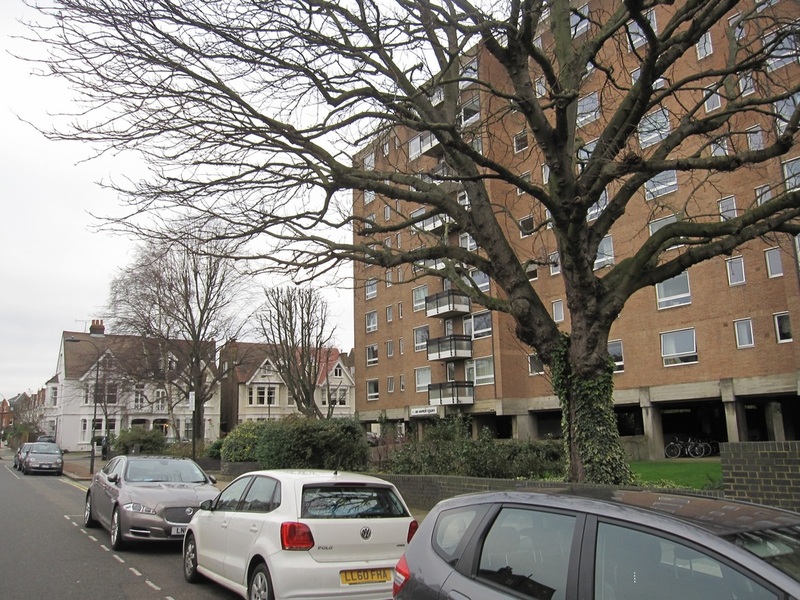 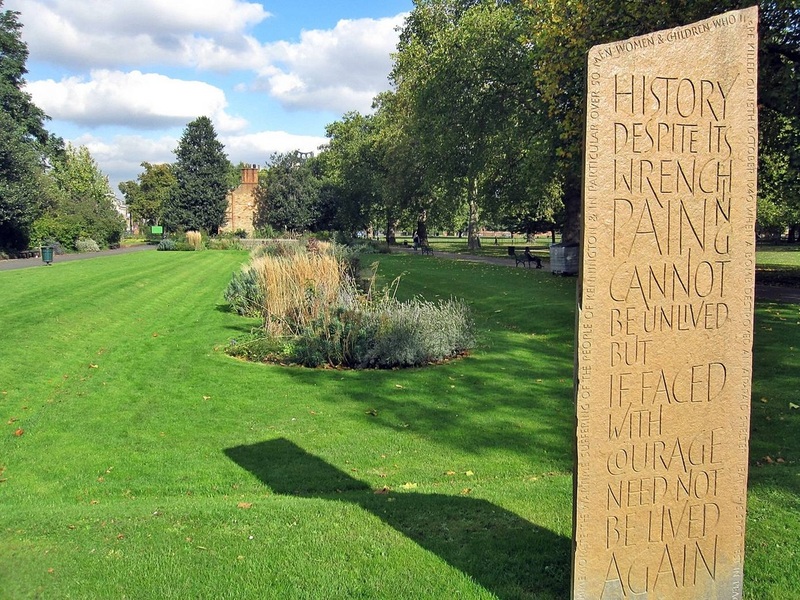 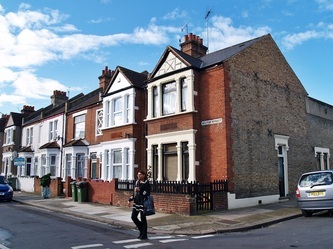 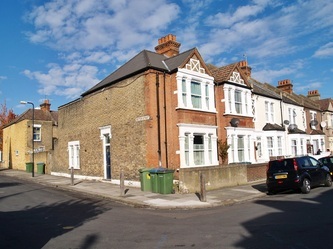 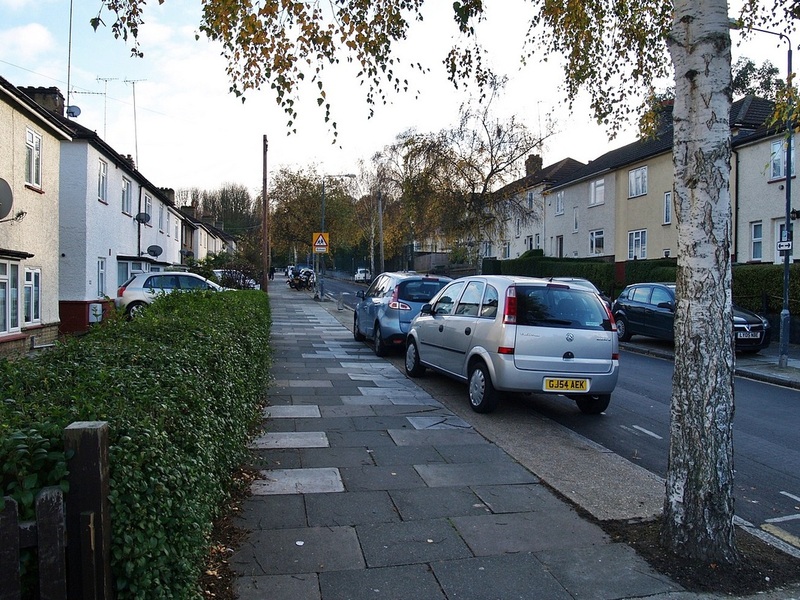 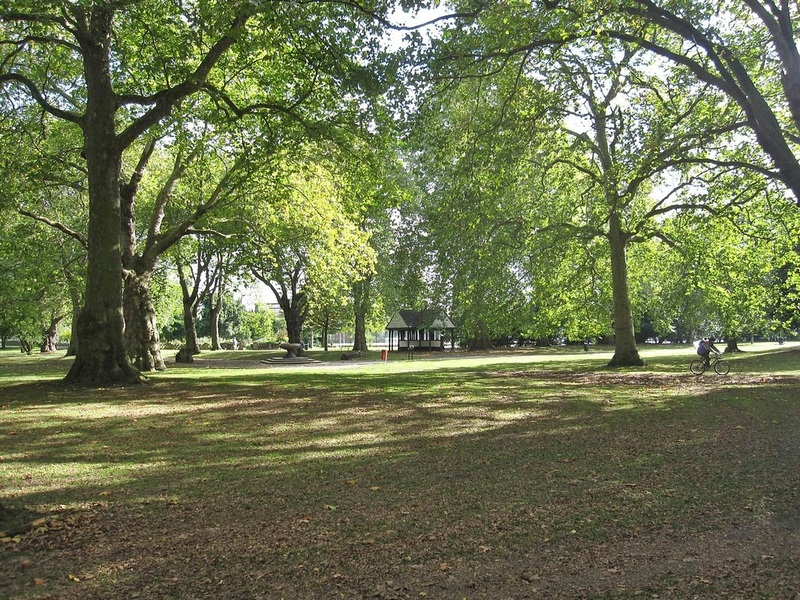 In 1920 the Park was transferred to the Greenwich Borough’s housing department and became the site of Charlton’s first council homes, built as family houses with three bedrooms and gardens. 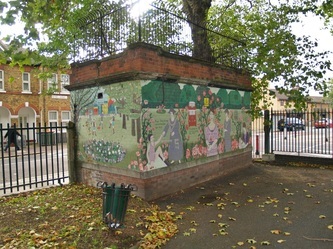 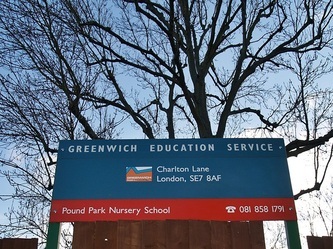 Although Charlton lost Pound Park with the growing population it gained two schools. 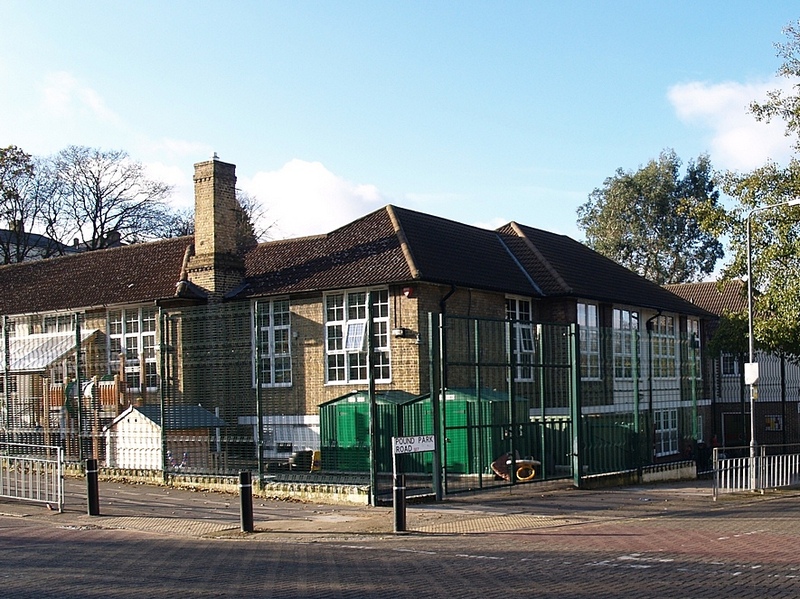 Thorntree Junior School was opened in 1927 and Pound Park Nursery was opened in 1944 both on the site of Pound Park. 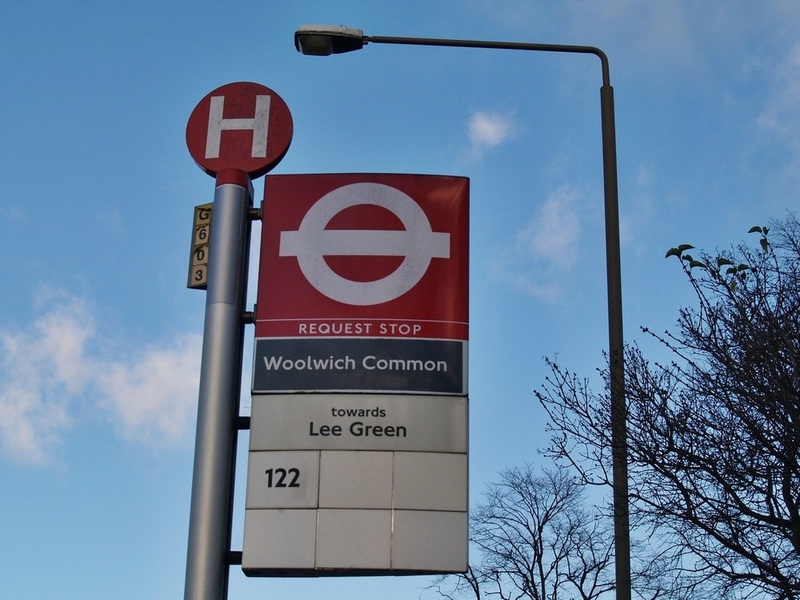 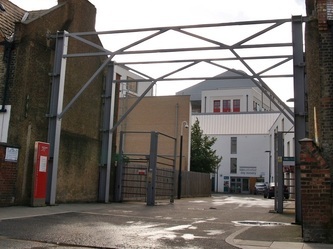 In the club's early years its progress was hampered by the nearby presence of Woolwich Arsenal F.C., and Charlton spent the years before the First World War playing in local leagues. 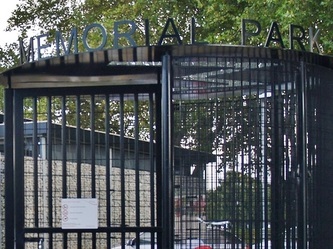 Woolwich Arsenal's move to North London in 1913 gave Charlton an opportunity to develop, and they became a senior side and progressed through the Lewisham League. 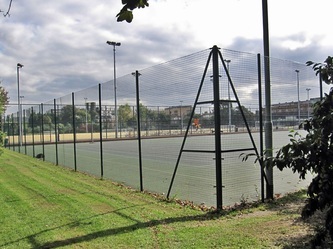 The 4000 capacity Angerstein Athletic Ground could be described as Charlton Athletic's first "proper ground" although this was a ground share with Deptford Invicta FC. 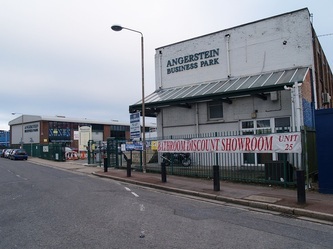 As the First World War progressed football appeared to have been abandoned and by the time the war had ended the Angerstein was used as a petrol storage facility. 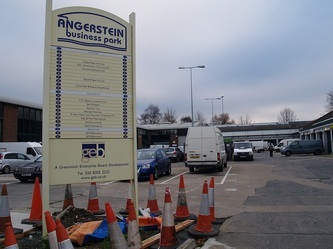 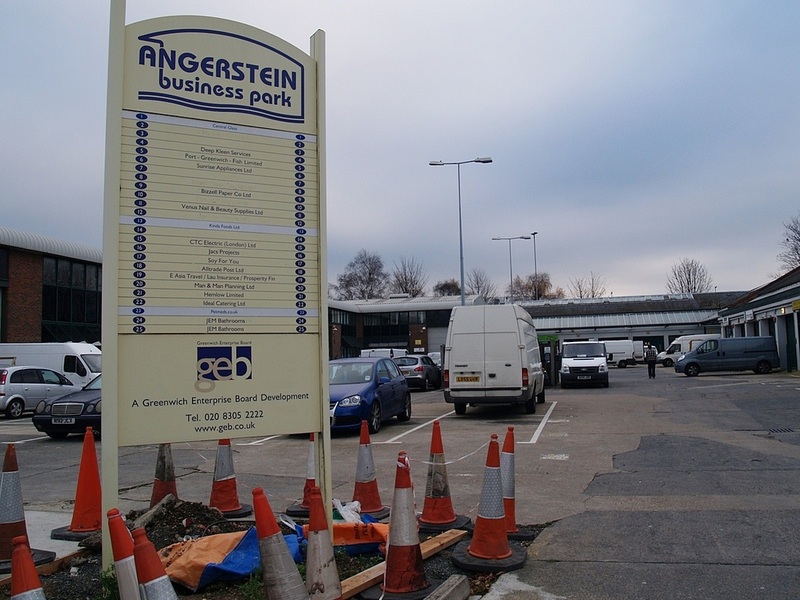 These days the site is now the Angerstein Business Park with no clues as to the existence of the stadium. The name originates from the nearby Angerstein Wharf named after John Julius Angerstein (1732-1823) a businessman & fine art collector who lived for some years in the Greenwich area. 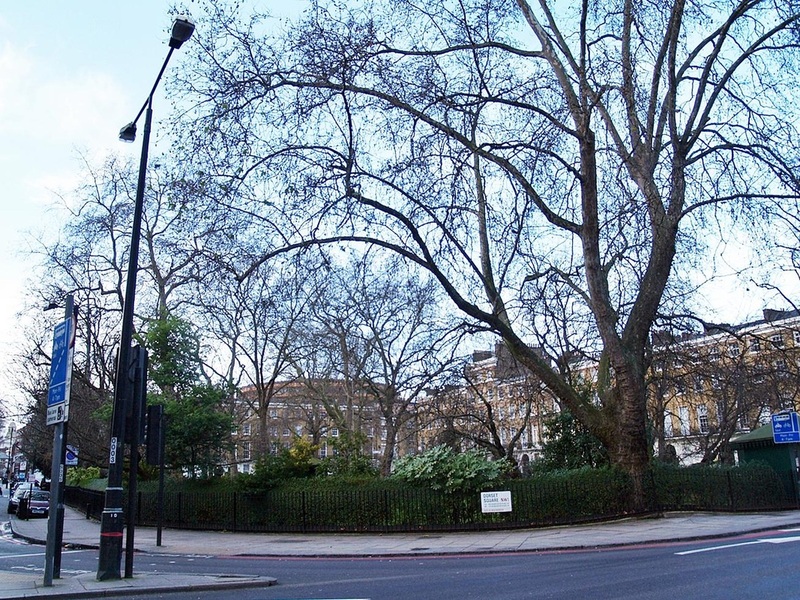 Upon his death his collection galvanised the founding of the National Gallery. 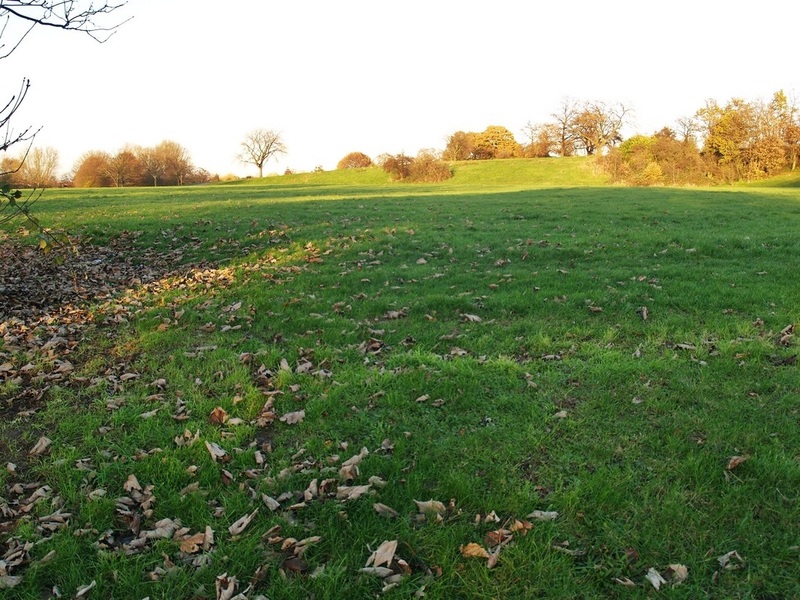 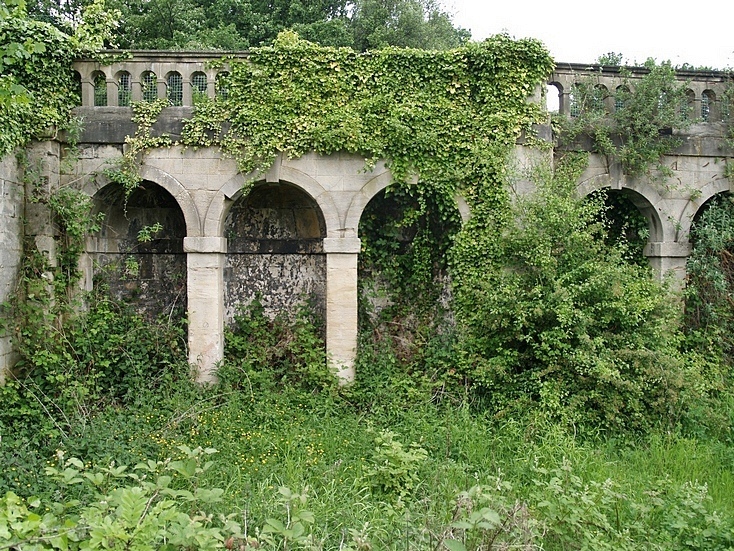 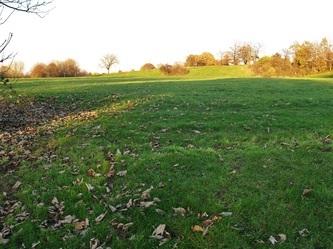 After the end of the First World War, a chalk quarry known as the Swamps was identified as Charlton's new ground, and in the summer of 1919 work began to create the level playing area and remove debris from the site. 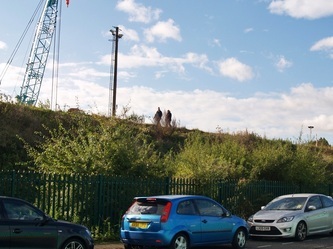 The first match at this site, now known as the club's current ground The Valley, was in September 1919. 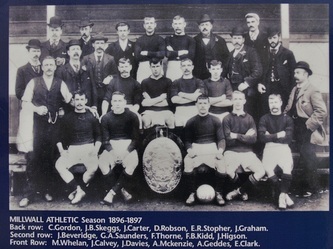 The club progressed through the leagues, joining the Football League in 1921. 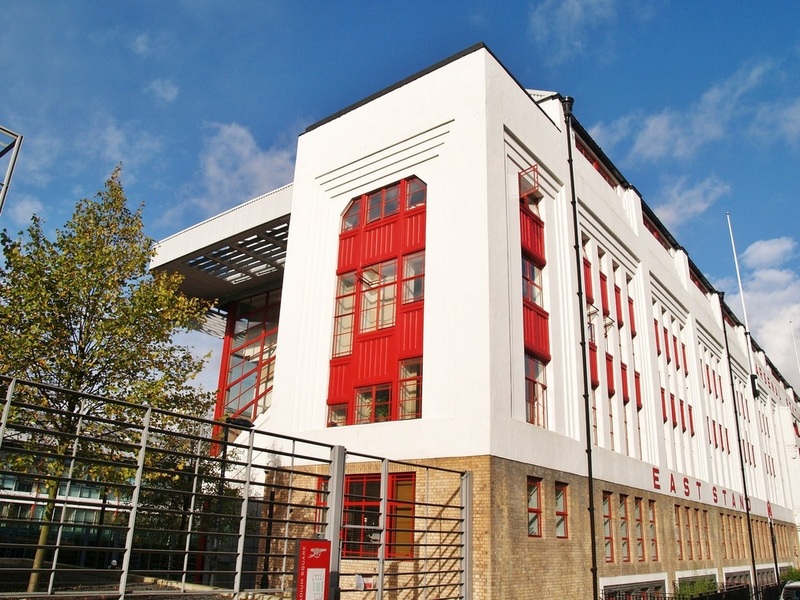 Charlton stayed at The Valley until 1923, when the club moved to The Mount stadium in Catford as part of a proposed merger with Catford Southend Football Club to create a larger team with bigger support. 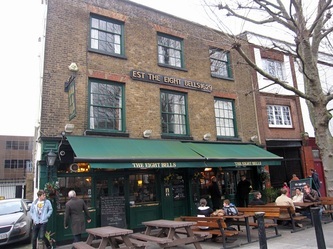 The team wore the colours of "The Enders", light and dark blue vertical stripes. 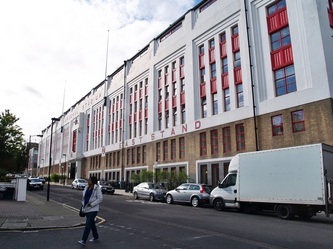 However, the move fell through and the Addicks returned to the Charlton area in 1924, returning to the traditional red and white colours in the process. 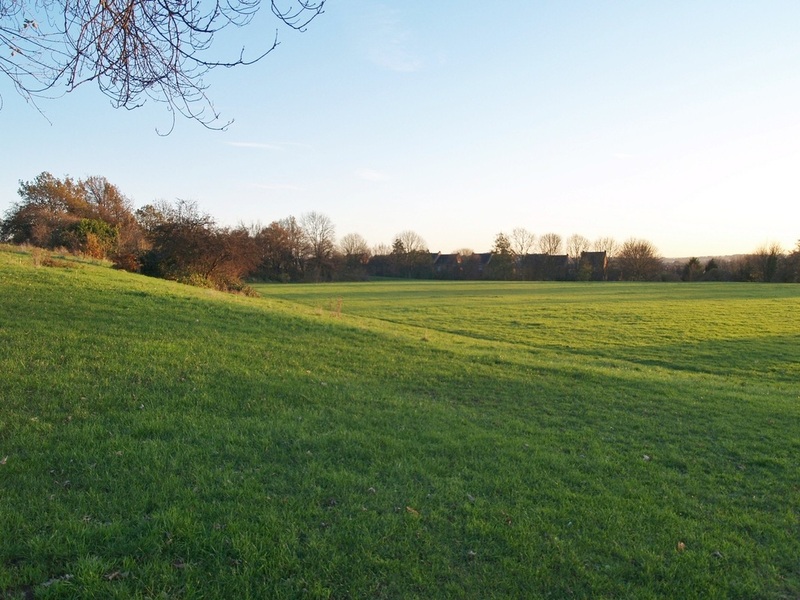 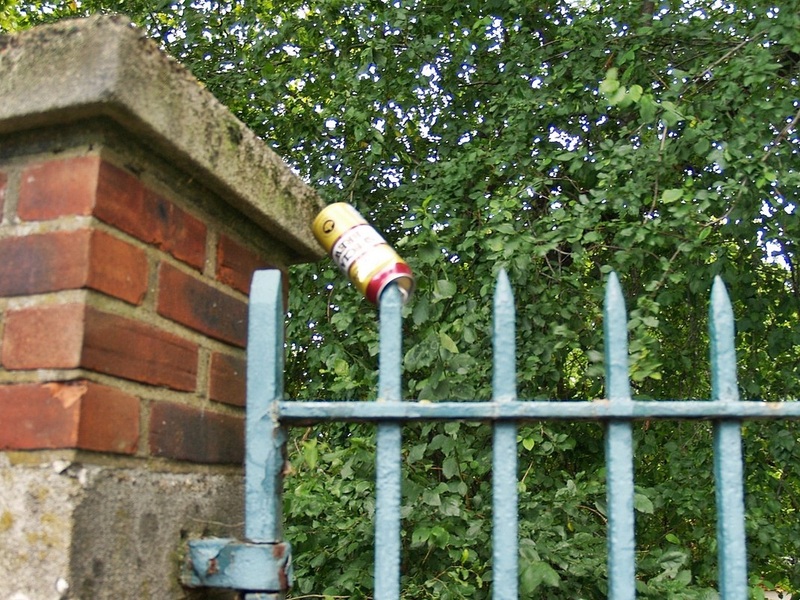 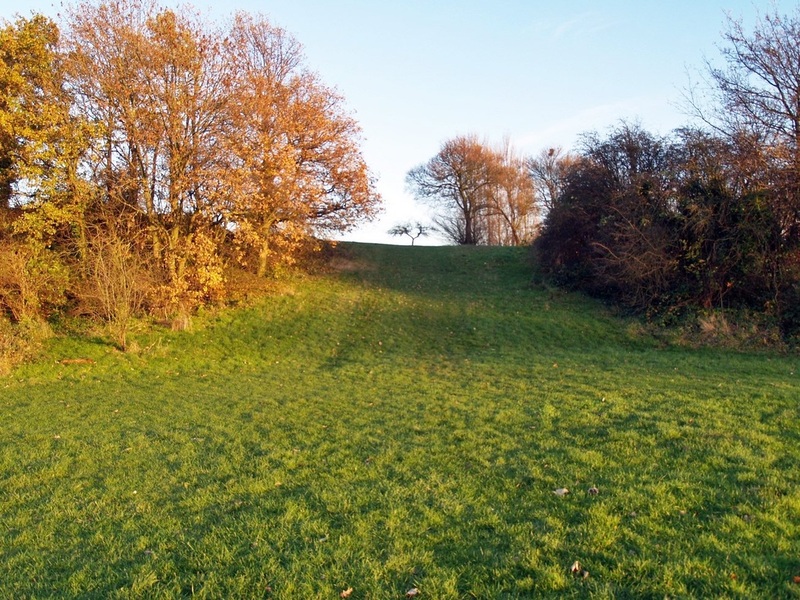 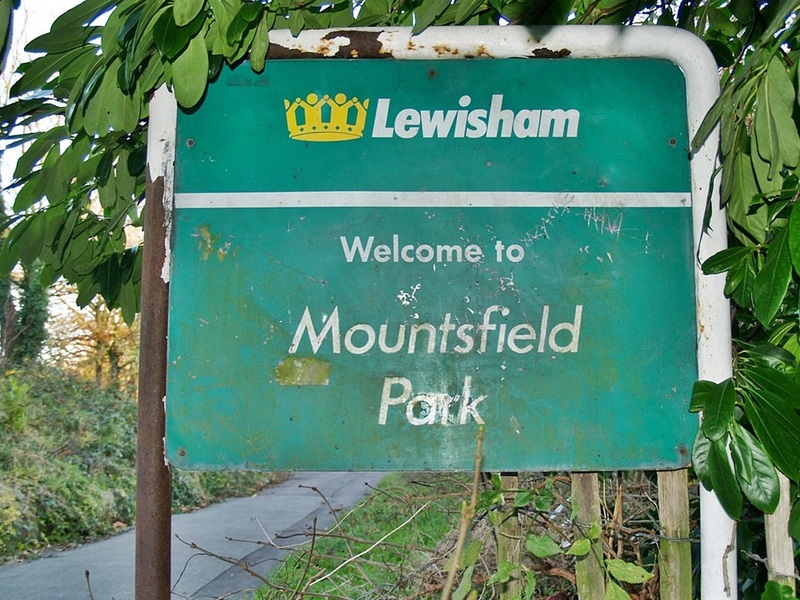 The Mount was a football stadium in Catford, (but not to be confused with Catford Stadium which you will find elsewhere on this website) located in the SW corner of Mountsfield Park. Catford South End F.C. 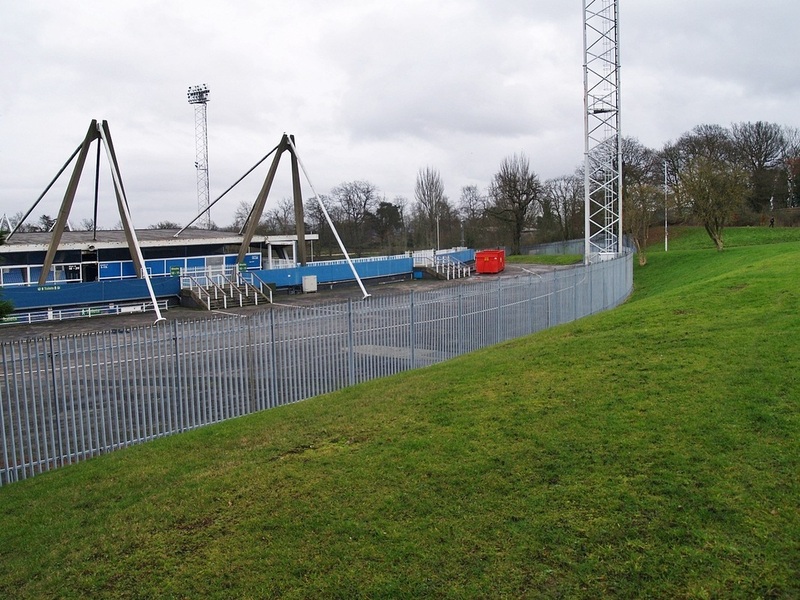 (founded before 1914) developed the part of the park into a proper stadium with terracing. 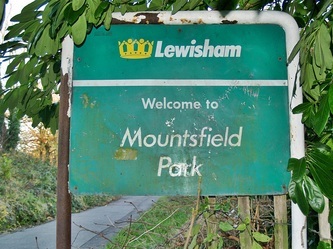 The Mount was unusual as it was elevated above the surrounding area and the reason for its name. 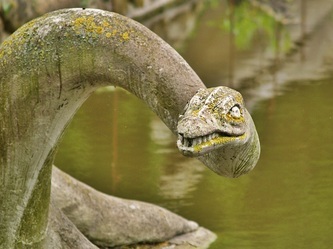 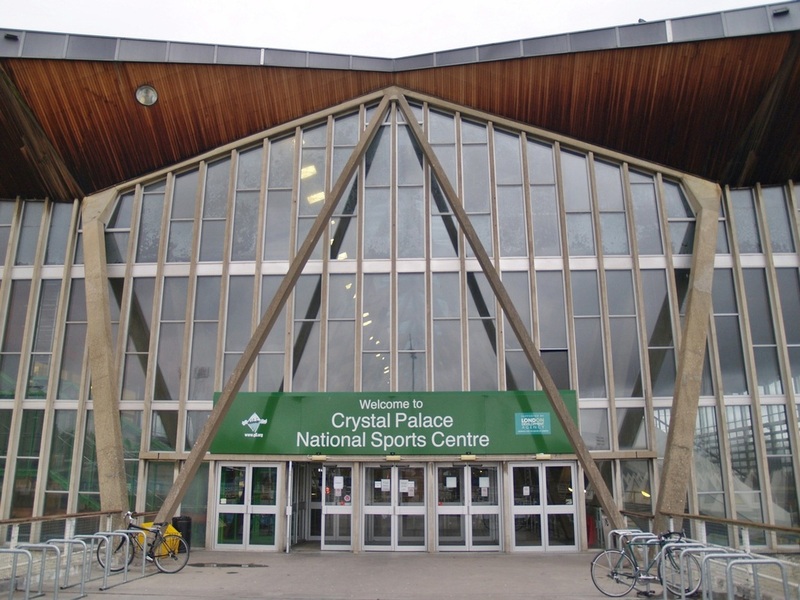 First off the Crystal Palace itself originated north of the River.... 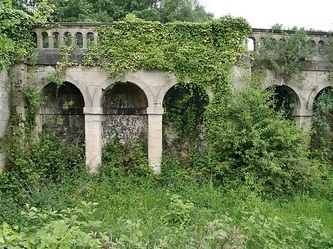 The Crystal Palace had been the centrepiece of the Great Exhibition of 1851 in Hyde Park: an international wonder and a triumph of technology and the ingenuity of its designer, Joseph Paxton. 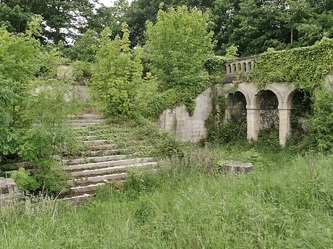 However, in 1936, most of the Crystal Palace was destroyed in the country’s biggest peacetime fire of the 20th century. During World War II the 20-acre hilltop site was used as a dump for bombsite rubble. 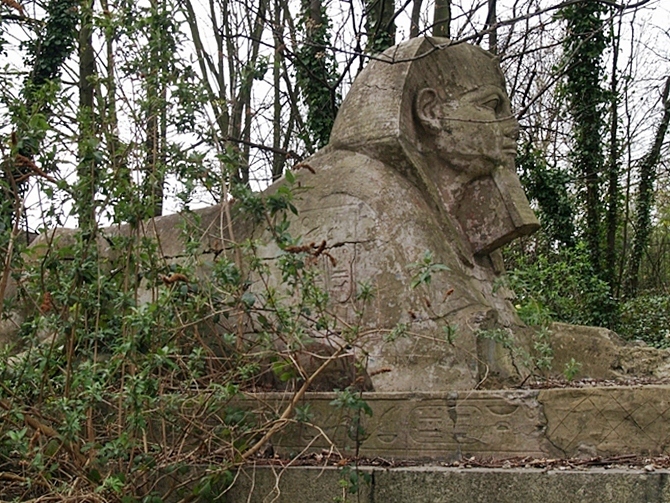 The Crystal Palace’s slow decay is evident everywhere in the park. 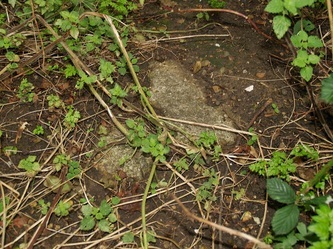 Surviving remnants of the building are now disappearing in the undergrowth. 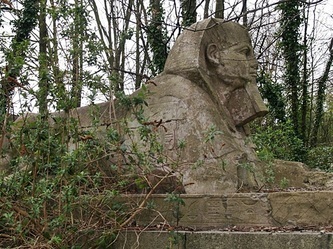 Only the terraces with their crumbling sphinxes are there to remind visitors of former glories. 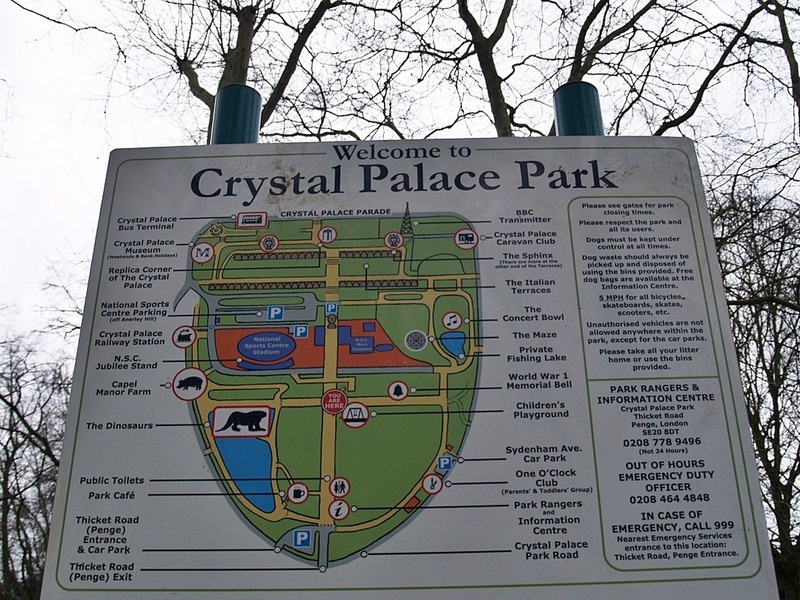 The first Crystal Palace FC was founded in 1861 by workers at the Crystal Palace itself. 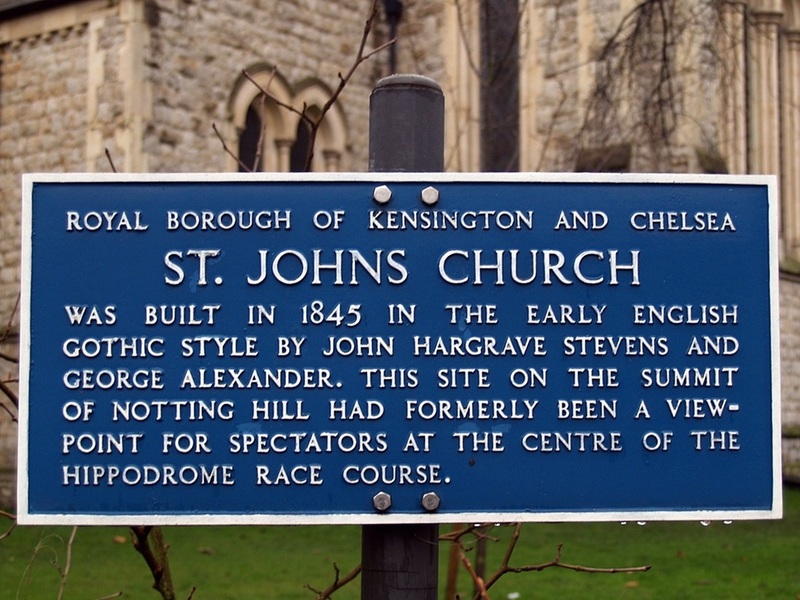 They reached the semi finals of the FA Cup in 1872 but were wound up in 1876. 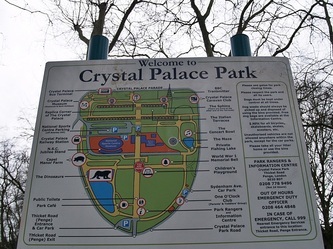 In 1905, the owners of Crystal Palace stadium (a venue that was already hosting FA Cup finals from 1895) wanted a professional home club to use the venue, so a new Crystal Palace FC, was formed. "The Glaziers" (as they were nicknamed at the time) started play in the Southern League Division Two. 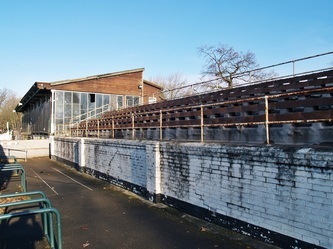 The ground sometimes had FA Cup attendances in excess of 100,000 though the average Crystal Palace attendances in 1905 were between 2,000 and 3,000 . 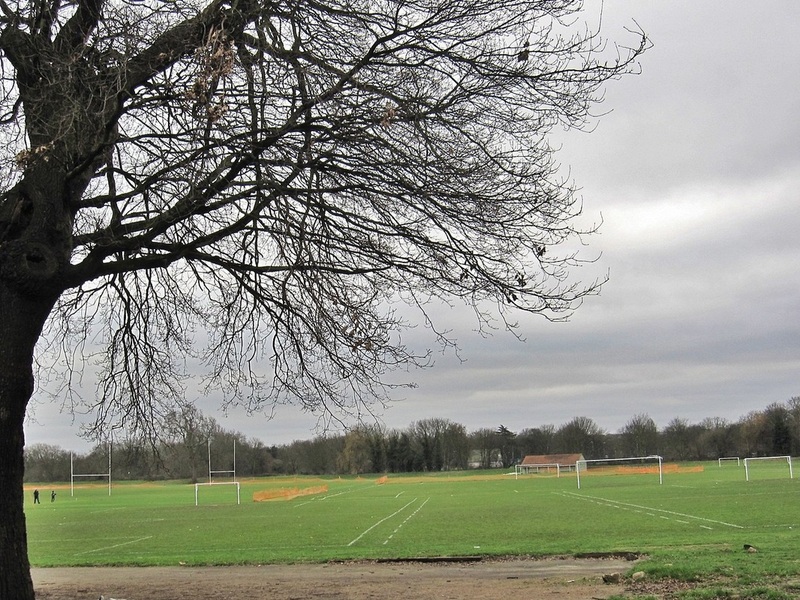 In these years there was great rivalry between Crystal Palace and their neighbours Croydon Common FC. 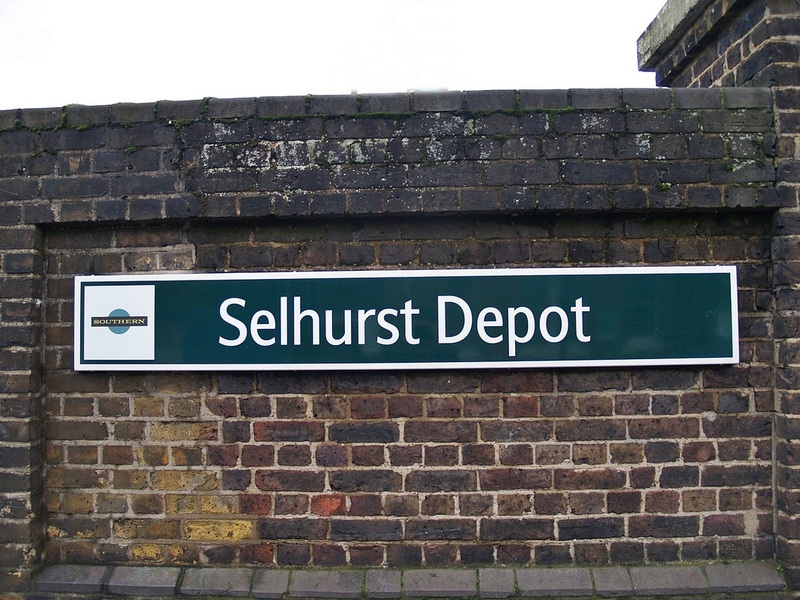 In 1909 Croydon were promoted to the First Division of the Southern League which set up a local derby clash. 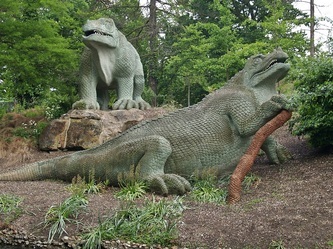 The game was keenly anticipated and 12,000 came to Crystal Palace to see it. 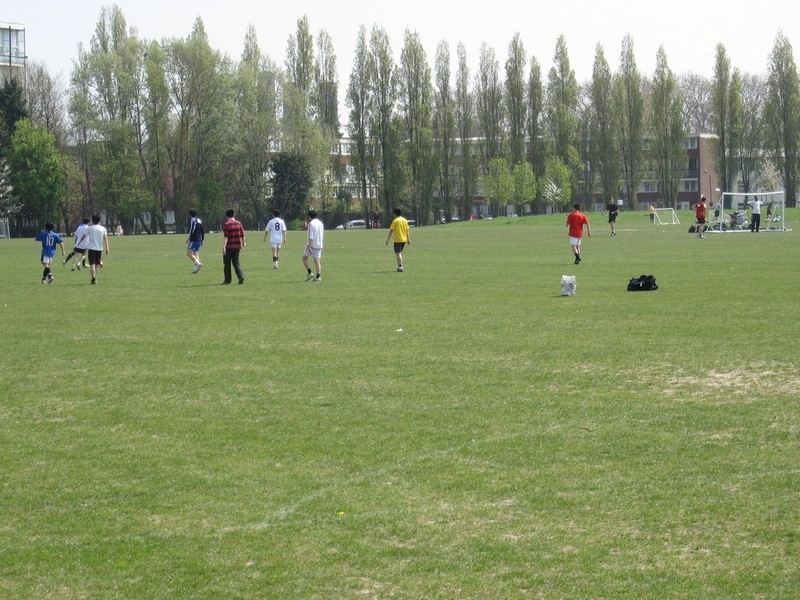 However, the game itself turned out to be a very ill-tempered affair with players accused of kicking and tripping their opponents. Even the crowd became aggressive and abusive. Palace won the game. 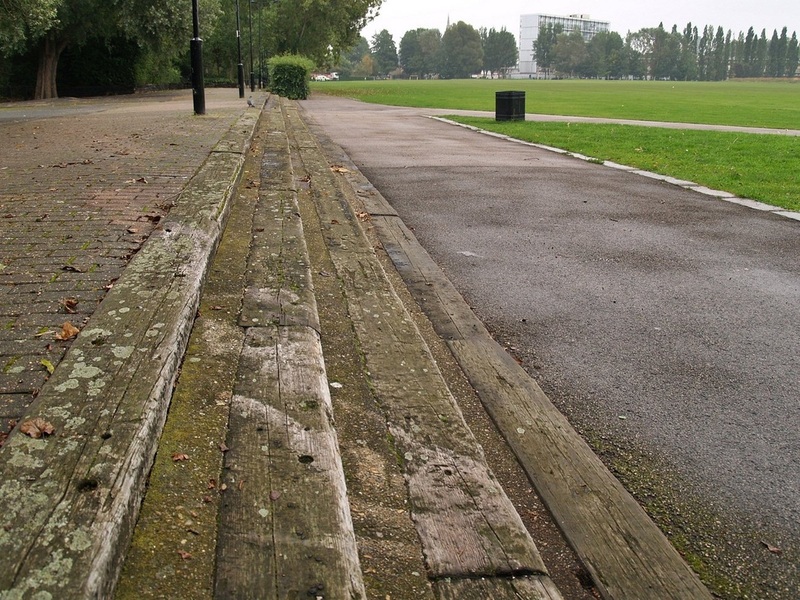 In 1915 the Admiralty took over the ground to use as a training camp in the First World War and ordered the football club to leave. This left the pitch in such poor condition that the FA Cup finals were staged elsewhere and never to return and neither were Palace...Legendary amateur side Corintians used it a home ground for a while in or around 1922. 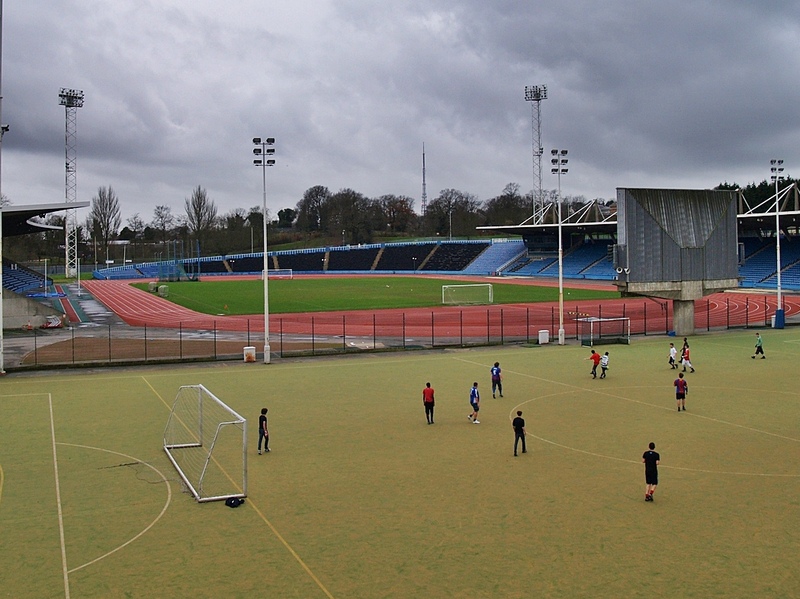 The current 15,500 seater athletics stadium was built on the site of the old football ground and opened in 1964. 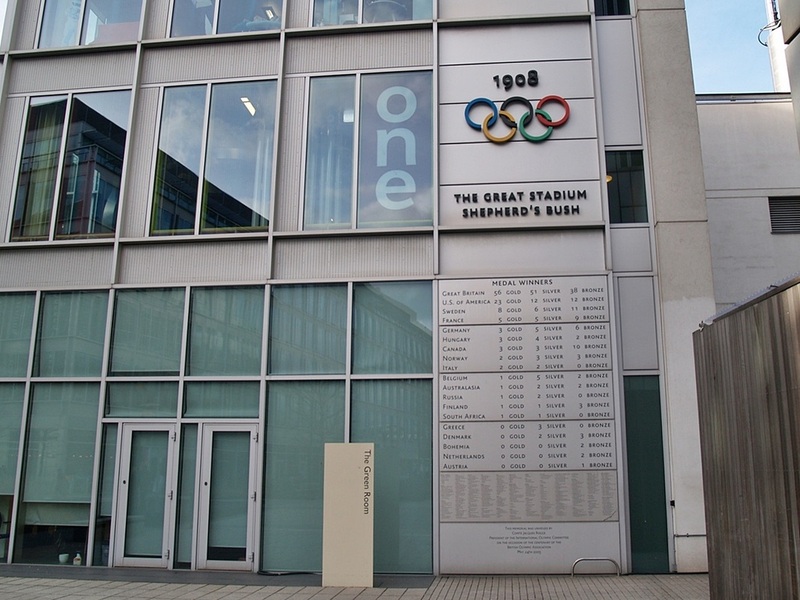 Since 1999 it has hosted the British Athletics London Grand Prix. 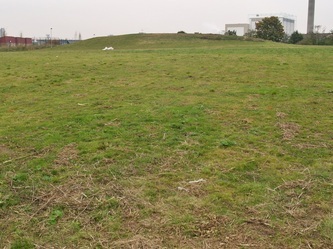 There are no remnants of the original stadium left although round the exterior of the "new" stadium the grassy banks give clues to the bowl of the old, much larger stadium that once stood there. 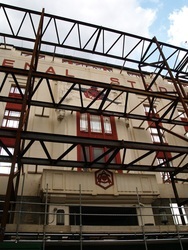 There have been hopeful plans by Crystal Palace FC in recent years to return and build a new stadium on the site. Joe Neanor writes to Derelict London: "I enjoyed reading about the homes of Crystal Palace FC. 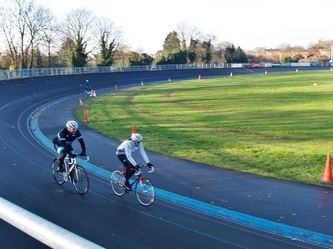 Did you know that Crystal Palace reserves did play at the Crystal Palace park athletics stadium in the late 1990s? 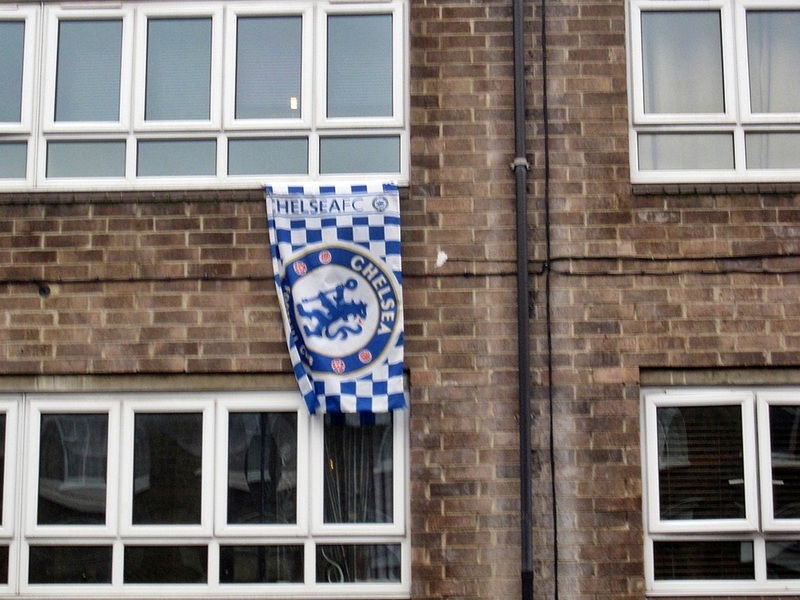 I was 4th official on their Res Premier Division match v Derby in 1999 (or something like)." 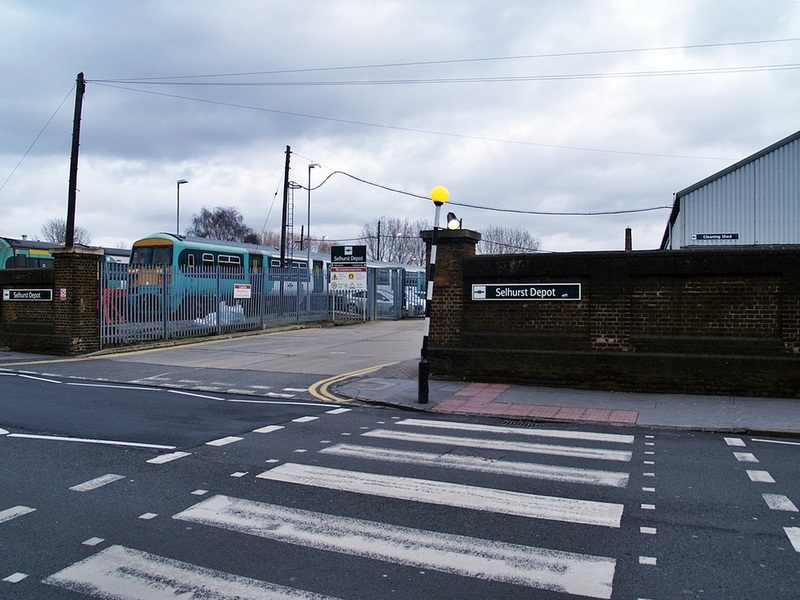 Croydon Common FC ('The Robins') - rivals to Crystal Palace - were the first professional football club in Croydon, but after they had gone into liquidation, Crystal Palace moved to their ground called The Nest which was located directly opposite Selhurst Station. 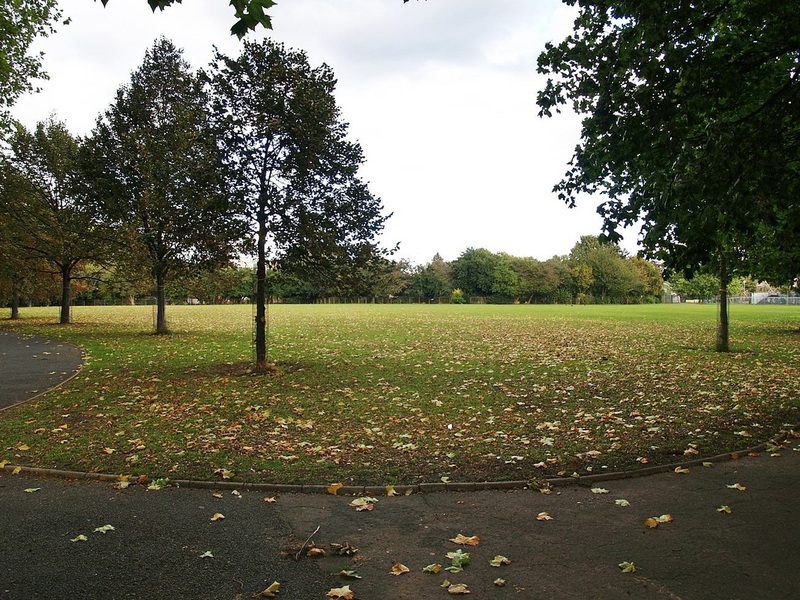 This move made absolutely sure that Croydon Common could not be revived.Croydon Common (whose first grounds were at Whitehorse Road Recreational Ground, from formation in 1897 and then at The Crescent from 1906) played at The Nest from 1908 until 1917 when they were wound up. 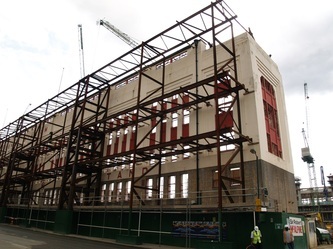 The first game at the new home saw Palace beat QPR 4-2. Railway sheds now occupy the former ground though some people say that the old main stand at The Nest is still standing albeit with some alterations plus the addition of a chimney at one end! 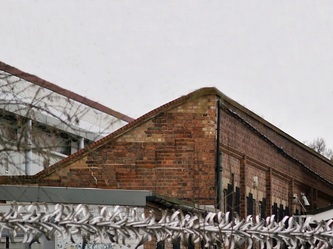 Others dispute the claim that these buildings were part of the Nest. 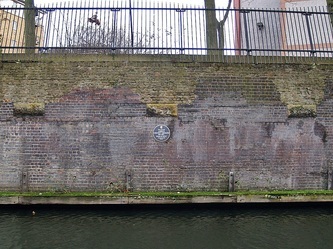 The original wall to the stadium also still stands. 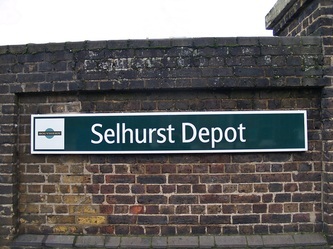 In 1924 Crystal Palace vacated The Nest in favour of Selhurst Park - the site of a brickfield belonging to the London, Brighton and South Coast Railway Company. 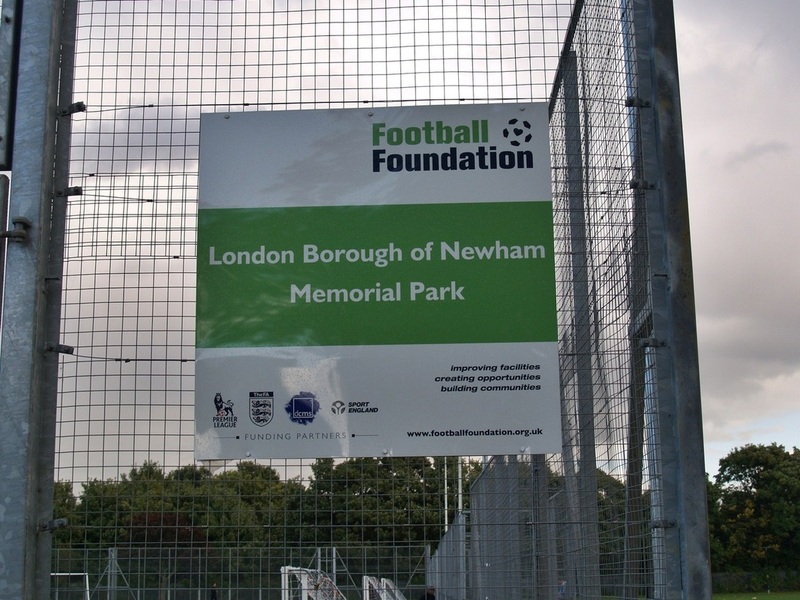 A team closely associated with South London these days though originally they hail from north of the river in East London. In fact they had 4 different homes on the Isle of Dogs before moving south to the London Borough of Lewisham. 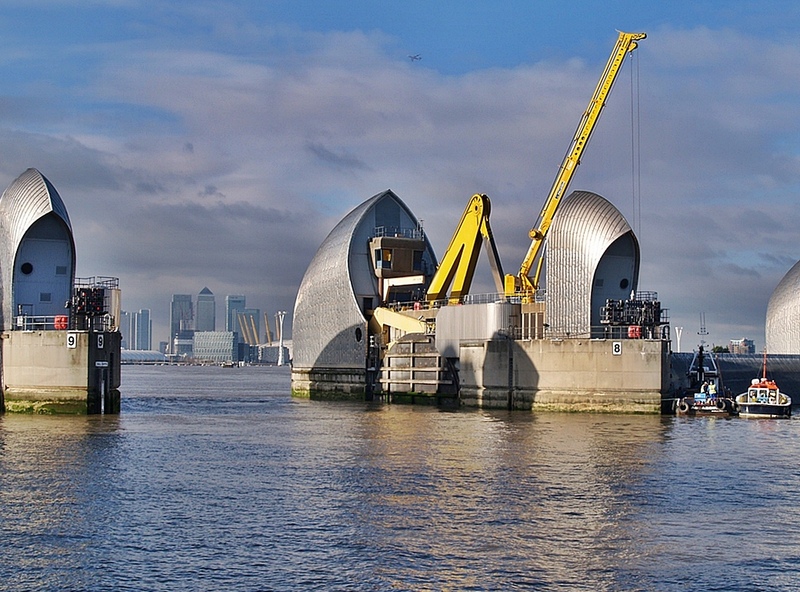 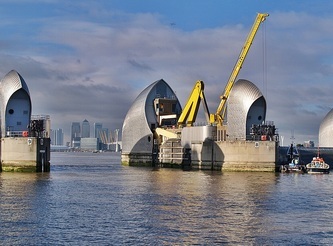 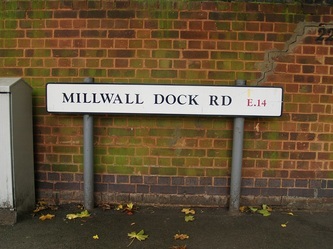 Millwall got its name from the wall that bordered the Thames attempting to minimize flood damage. 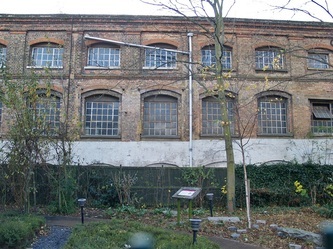 In the 18th century there were at least seven windmills along this stretch. 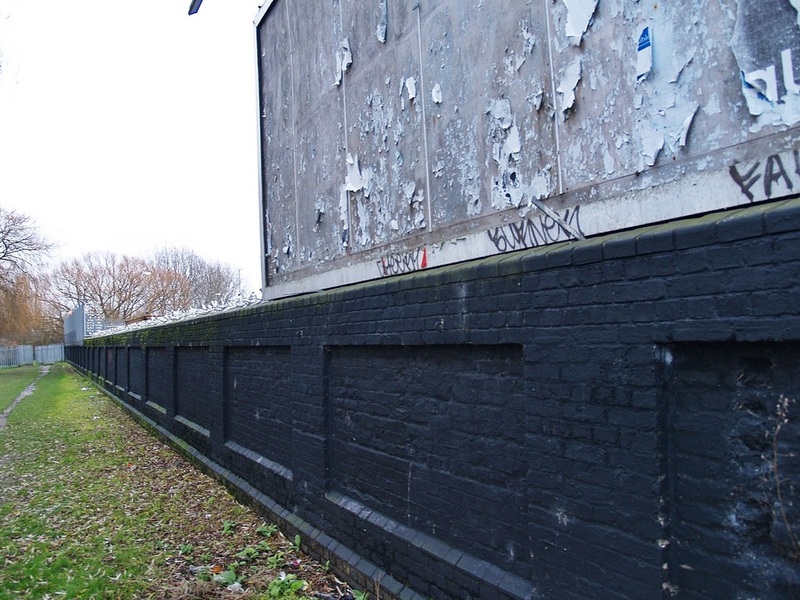 While on the other side of the Isle the wall was black giving rise to the name Blackwall. 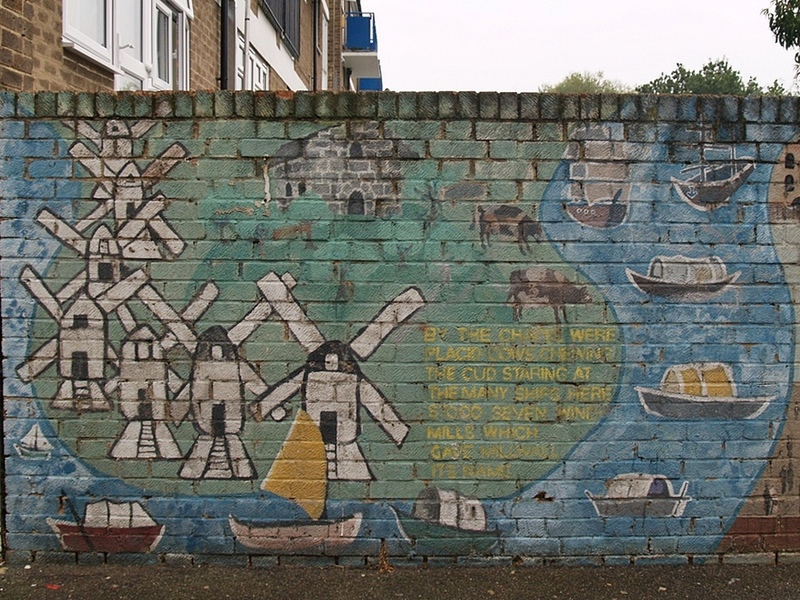 Here just off East Ferry Road a modern wall mural depicts the seven windmills. 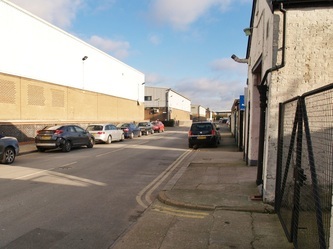 Millwall's first ground was on Glengall Road near West Ferry Road & is quite hard to pinpoint these days as Glengall Road no longer exists due to heavy wartime bombing and redevelopment. 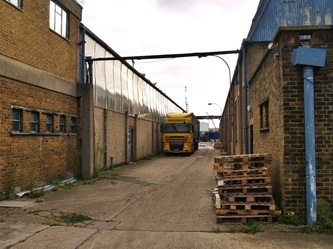 The team's nickname was initially "The Dockers" after the occupation of their majority fanbase. 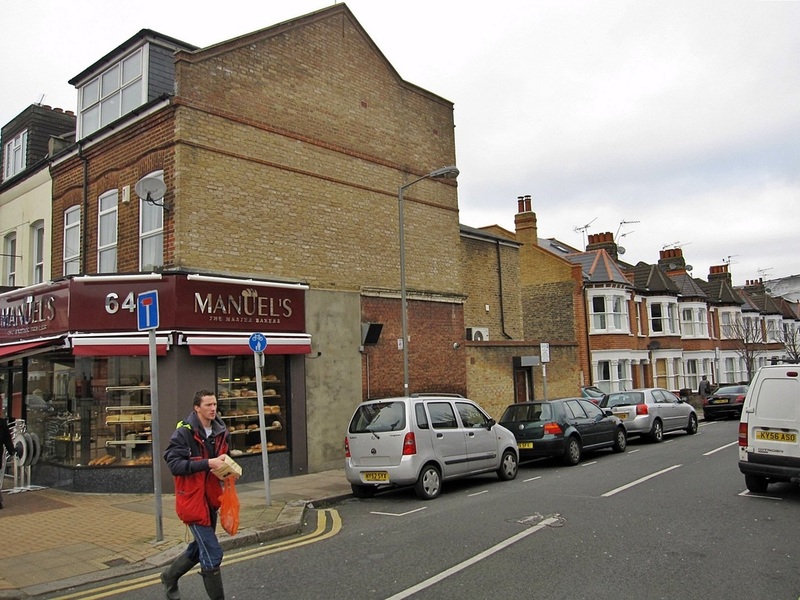 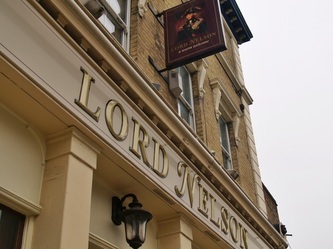 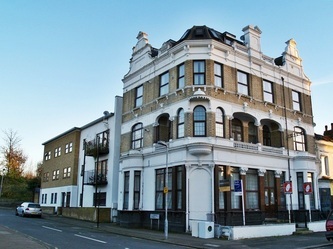 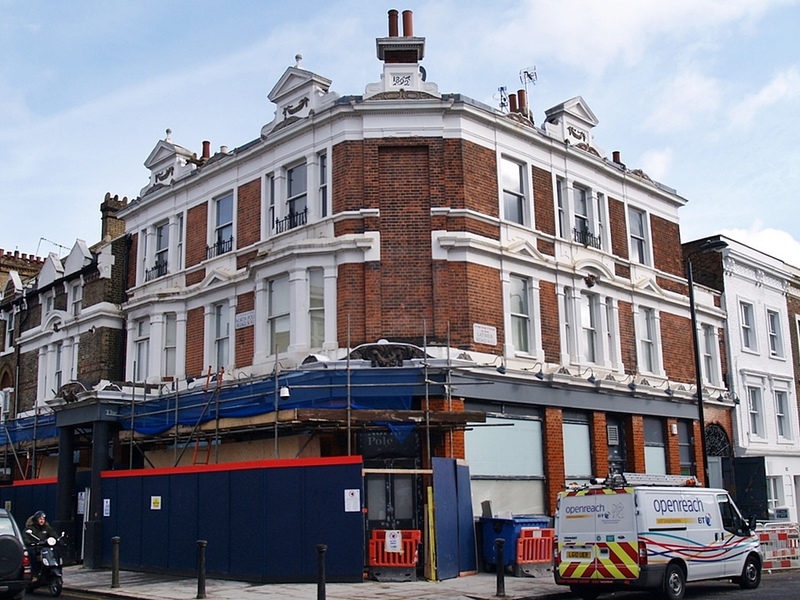 The team played behind The Lord Nelson pub on East Ferry Road, before being forced to leave by the landlady, who (apparently) received a better offer for its use. 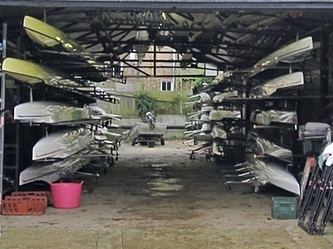 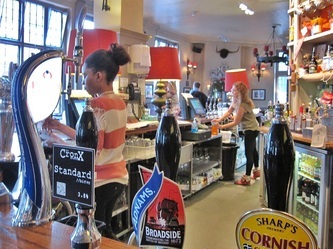 The team used the pub as a HQ and changing room. 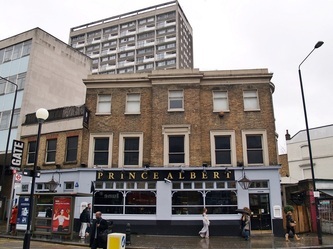 The pub still exists though the area where the pitch would have been is now housing. 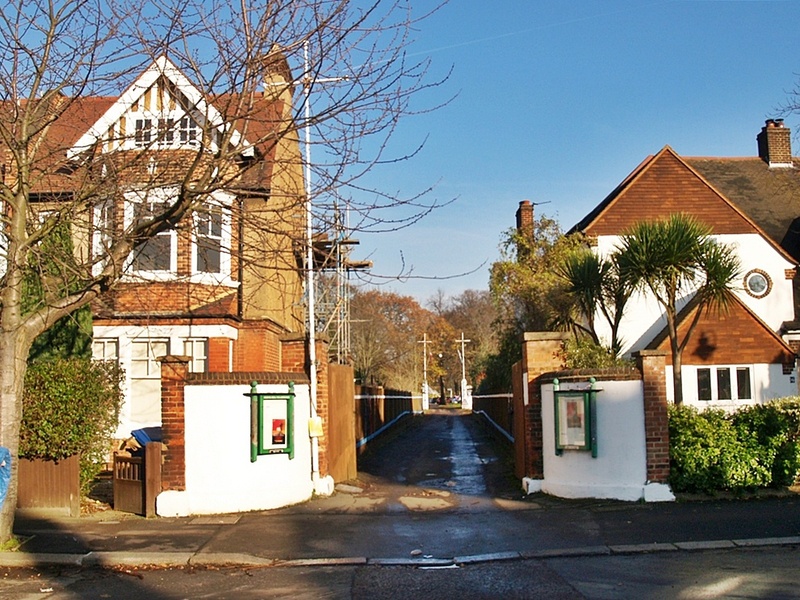 They moved to their third home, The Athletic Ground, East Ferry Rd, in 1890. 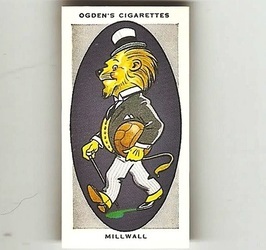 The club planned to convert their new ground to a major sports complex with running track & tennis courts and ambitiously changed their name from Millwall Rovers to Millwall Athletic in 1889. The ground had a grandstand that seated 600 people and an overall capacity of between 10,000 and 15,000. 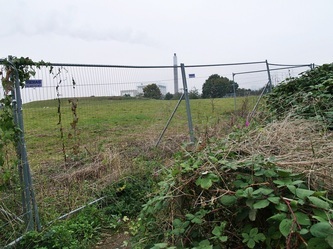 In Ed Glinert's London Football Companion it states that the new stadium was one of the best in southern England but the smell of reclaimed Thames mud (from adjacent Mudchute) was nauseous. 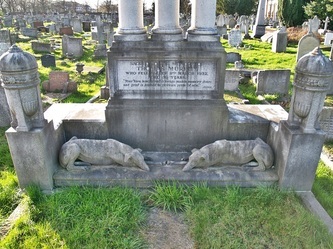 England International Fred Pelly, after playing here for Corinthians, remarked: " I don't mind taking a tumble or two there, but when I fell to the ground I couldn't get rid of the smell for weeks"
In 1900 the club made it to the FA Cup semi-final and the press headline was 'Lions of the South'. The Lions nickname is used to this day. The club was forced to move on again though, this time by the Millwall Dock Company who wanted to use it as a timber yard. 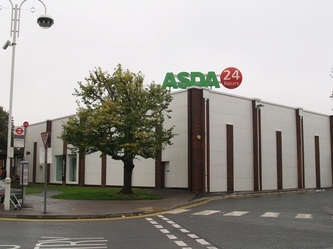 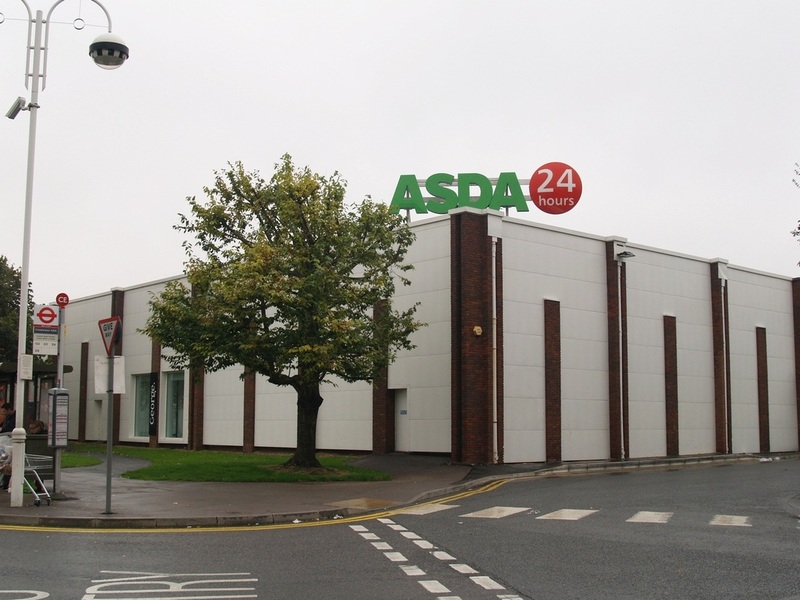 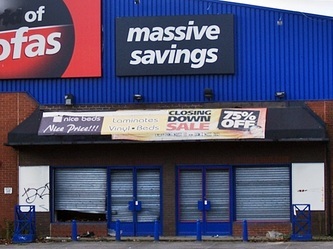 The site is now a large Asda Supermarket. 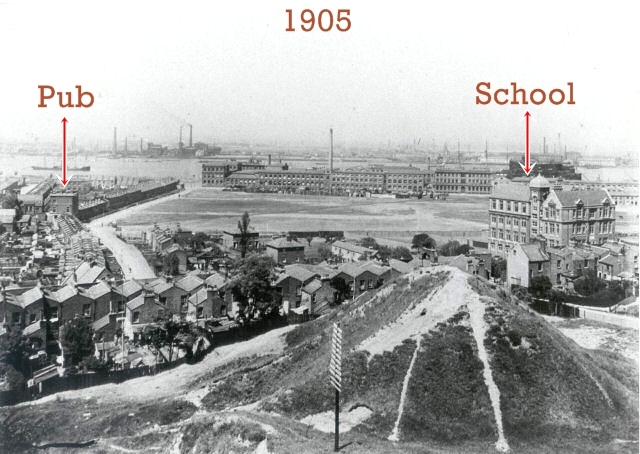 They relocated in 1901 to a location near their second home, which became known as North Greenwich.Confusingly though these days its known as Millwall Park and the name North Greenwich is given to the peninusular housing the 02 Arena (Millenium Dome)south of the river. 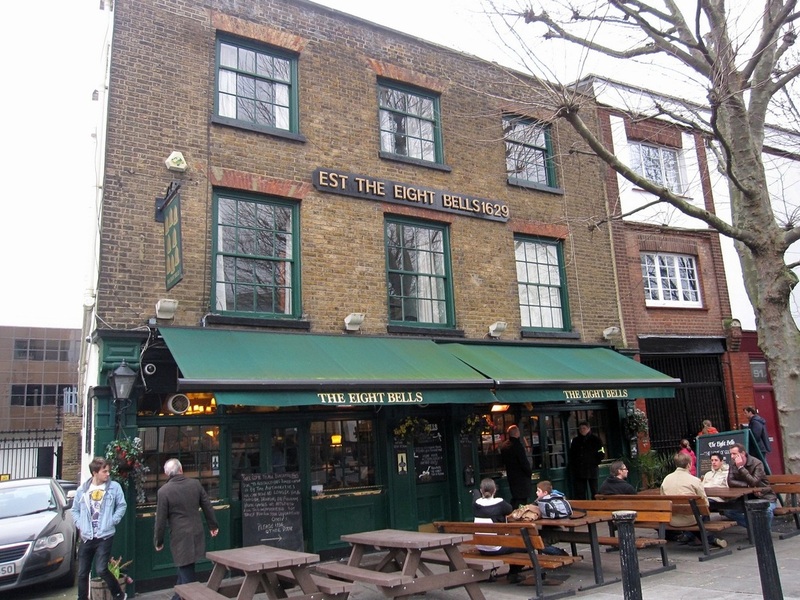 They remained an east London club for a further nine years, with the last game played on the Isle of Dogs on 8 October 1910 against Portsmouth, which Millwall won 3–1. 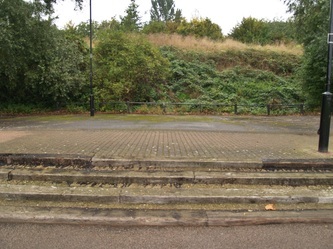 The ground is now a public park - the steps are could be clues to old terracing that once stood on this spot. The Den was a move to south of the river. 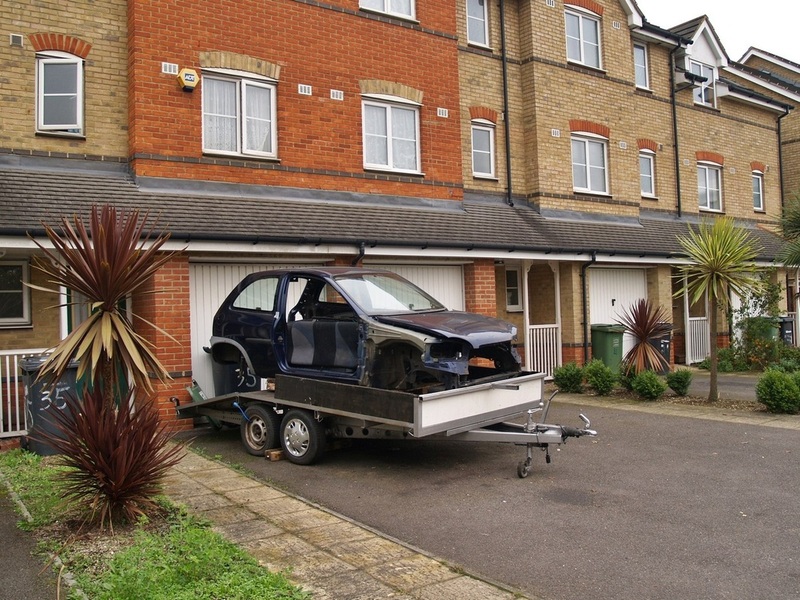 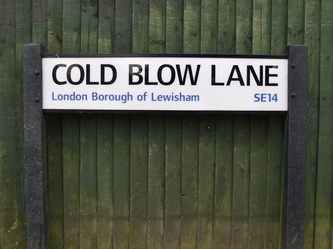 Situated in Cold Blow Lane, New Cross. The ground opened in 1910 and was the home of Millwall for 83 years. 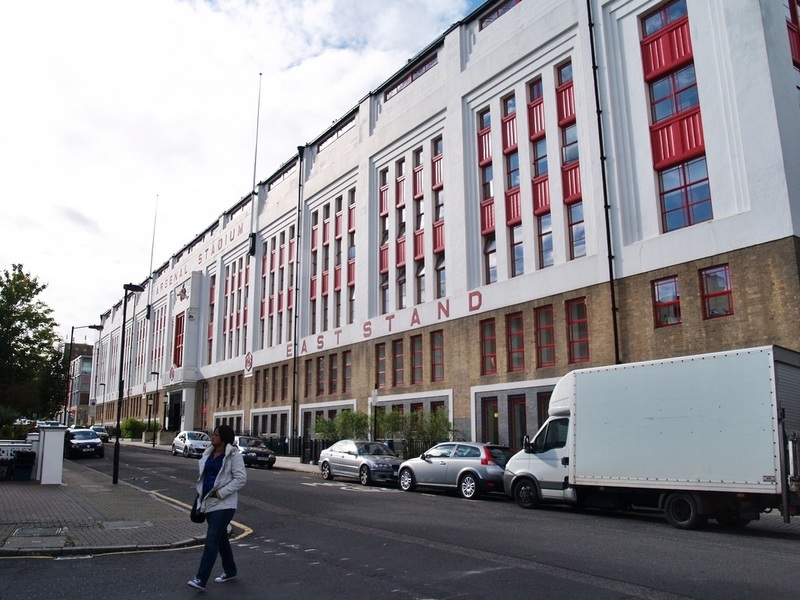 It boasted a record attendance of 48,672 (v Derby County in 1937). 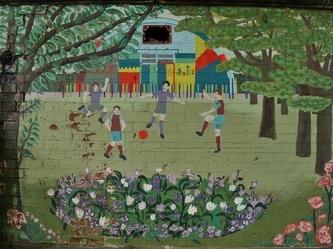 By the late 1970s, The Den had fallen into disrepair and there was proposals to build a "Super-Den" on the existing sites of The Den and the adjacent New Cross Stadium, with an anticipated all-seater capacity between 25,000 and 30,000. However, the club could not raise sufficient funds to pay for the ambitious project and it eventually fell through. 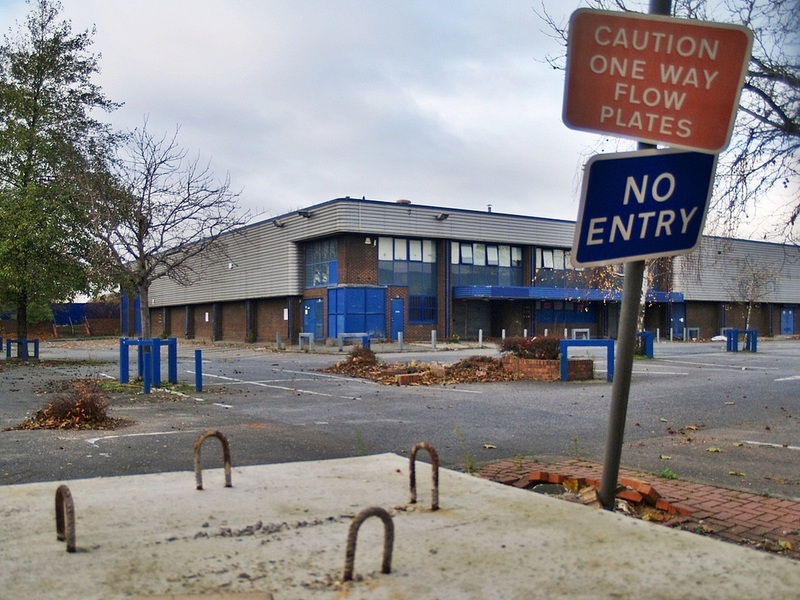 The club eventually relocated in 1993 to a new 20,000+ all seater stadium (The New Den) at the nearby Senegal Fields.Fairview Homes purchased The Den at a cost of £6.5million & promptly demolished the stadium. 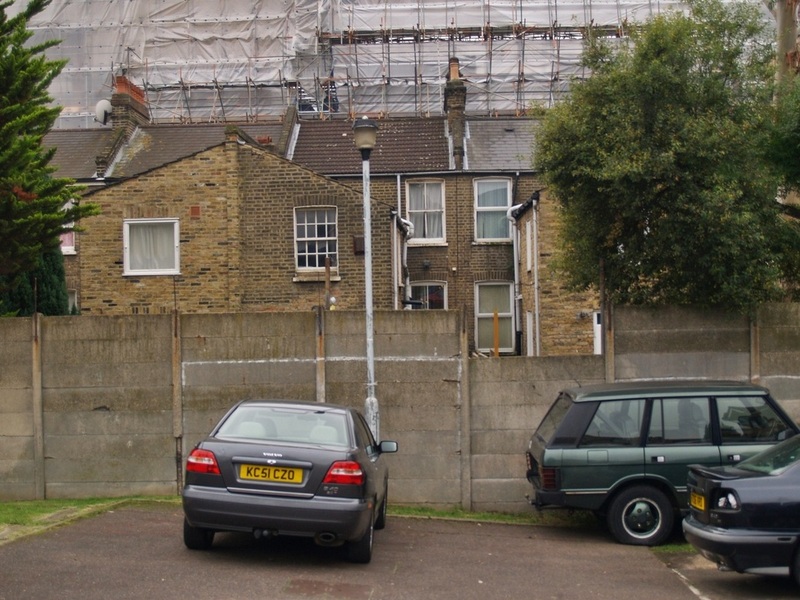 The site is now occupied by new houses and flats however the site and surrounding area are now known to locals as "Little Millwall". 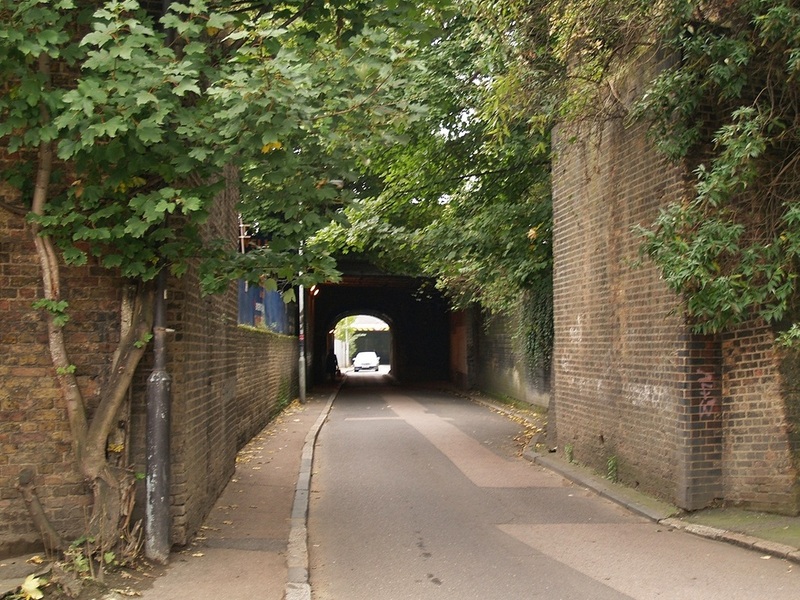 No team liked to play at The Den because the crowd and the place itself created such an intimidating atmosphere.The Den was considered one of the most hostile grounds in the whole of Britain for visiting teams and was closed a record 5 times by the FA. 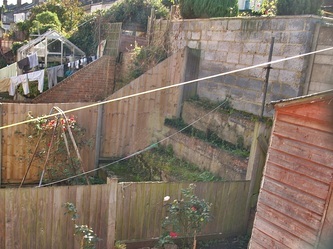 "I remember running on to the pitch at The Den when I was a youngster with Leicester in the fifth round of the FA Cup. 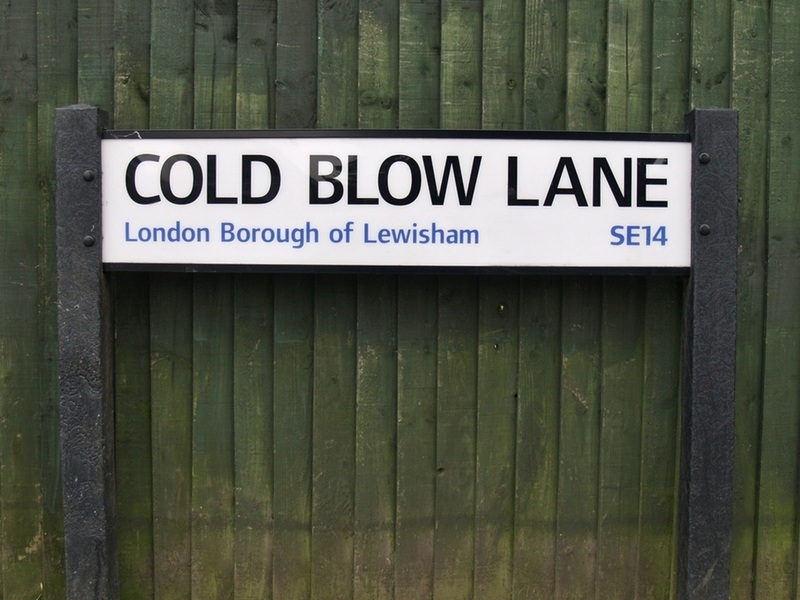 The place resembled a huge trap, and the venom that hit us from the Millwall fans was unbelievable. I remember thinking to myself, maybe it would be a good idea not to score at this place!" 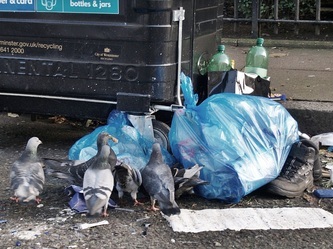 Gary Lineker. 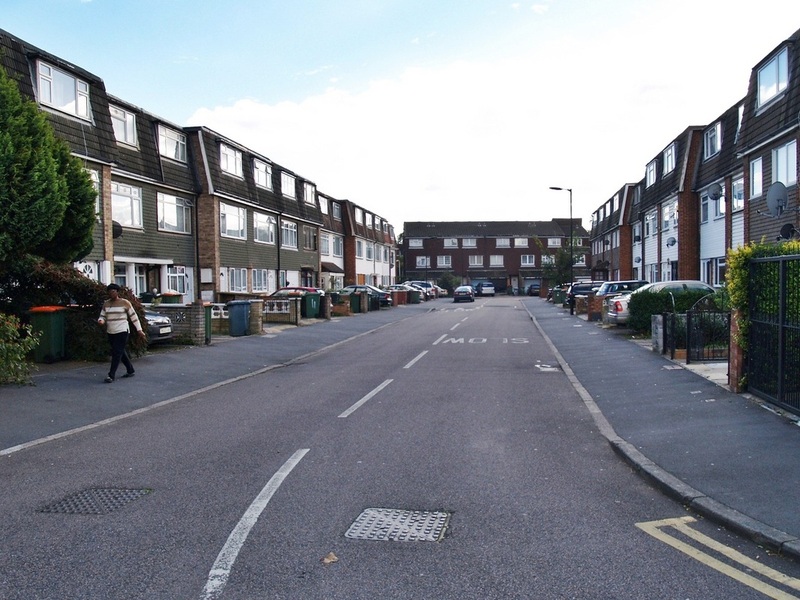 These days the modern housing development may come across somewhat calmer than its predecessor but not so. 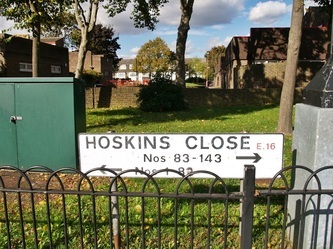 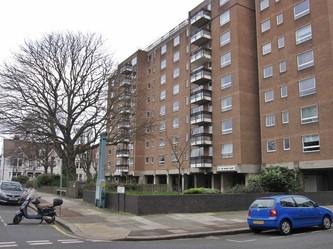 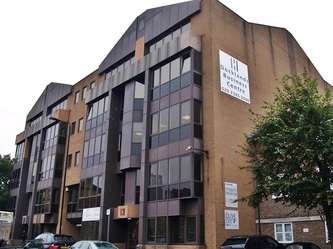 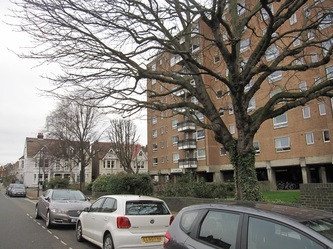 In 2007 a care assistant at an old people's home within the development was killed when she was caught in the crossfire of a gun battle between gangs. 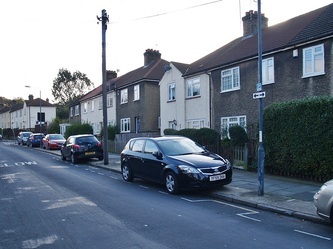 The young Polish woman was hit in the head by a stray bullet as two 17 year olds exchanged shots across a car bonnet. 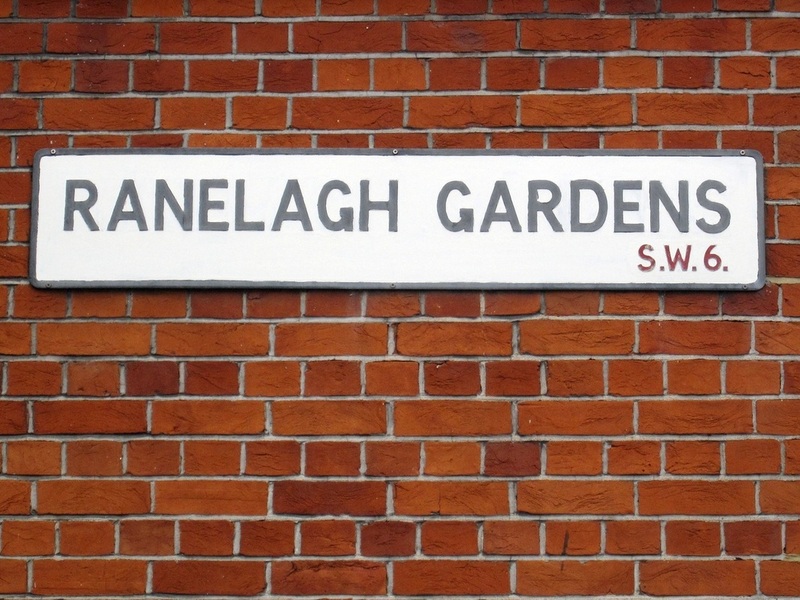 One of the youths, Armel Gnango, received a life sentence as a result. 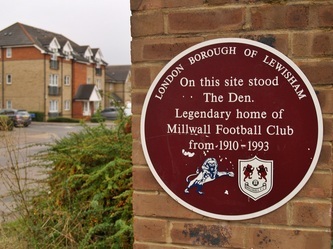 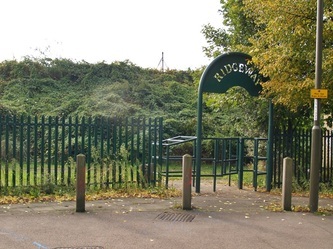 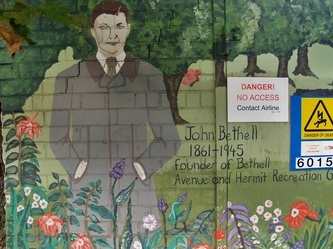 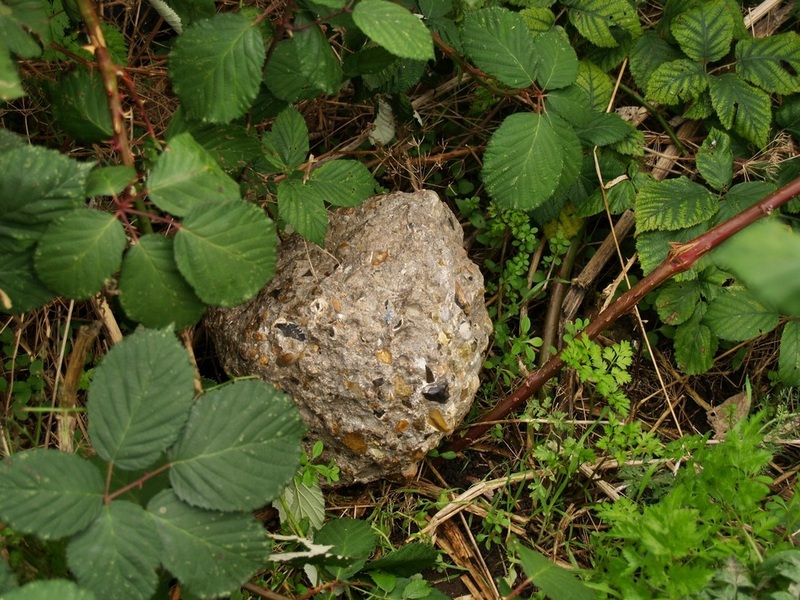 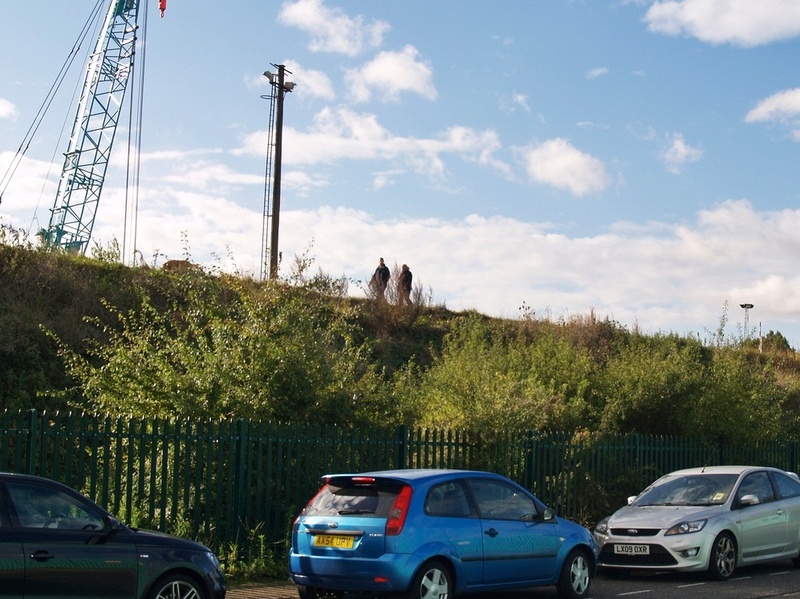 A plaque on the site remembers The Den, some old concrete fencing remains as does some loose lumps of concrete in the undergrowth on the overgrown banks of the development which could be remains of old terracing of The Den (or that of the demolished New Cross Stadium which was adjacent). 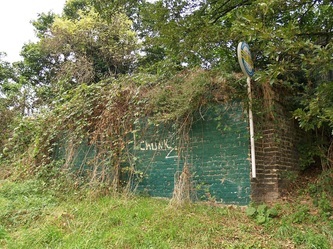 A mystery old brick structure with a "To Let" sign also sits on this bank. 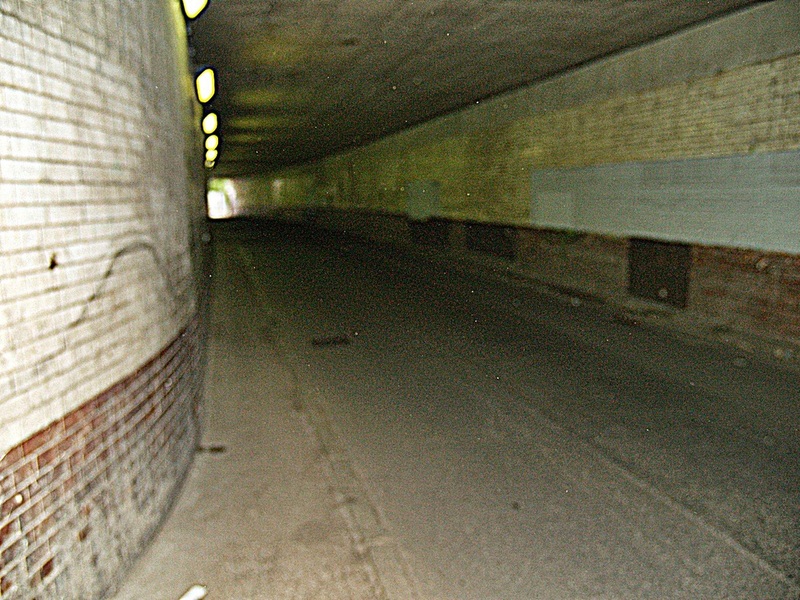 Just outside of the new development are the tunnels along Cold Blow Lane and walking through these give you a feel of what is was like walking to The Den in what some say was a hostile environment. 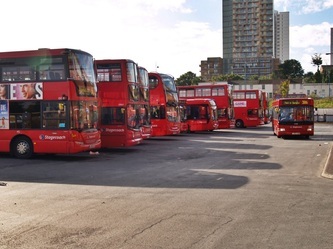 Sometimes nicknamed the Pride of North London this is a team that has its origins in South London. The workers of Dial Square , the name of the Woolwich ammunition workshops at the heart of the Royal Arsenal formed Dial Square FC in 1886 which played on nearby marshes. 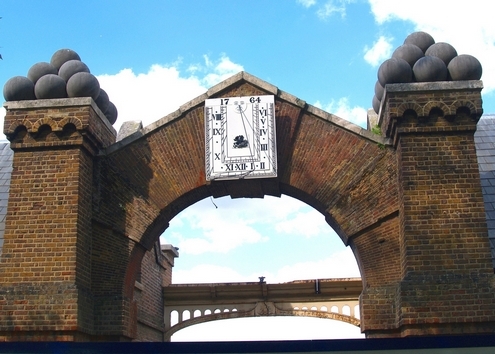 Dial Square is named after the 1764 sundial on the entrance gateway. 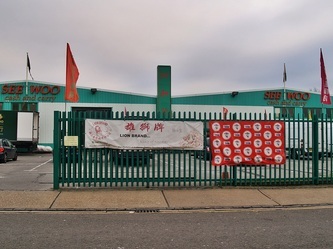 Included in the founding group were two Nottingham Forest players, who wrote to their old club to ask if it would be prepared to let them have some kit. 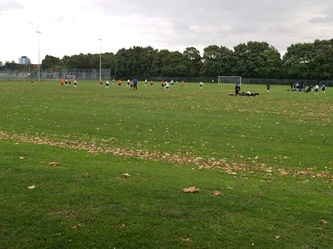 Forest responded with a full set of red jerseys and a ball. 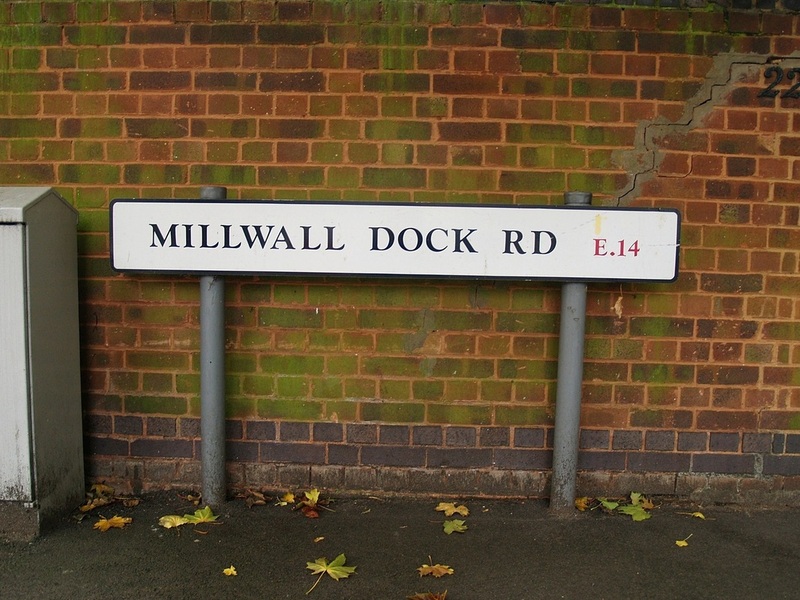 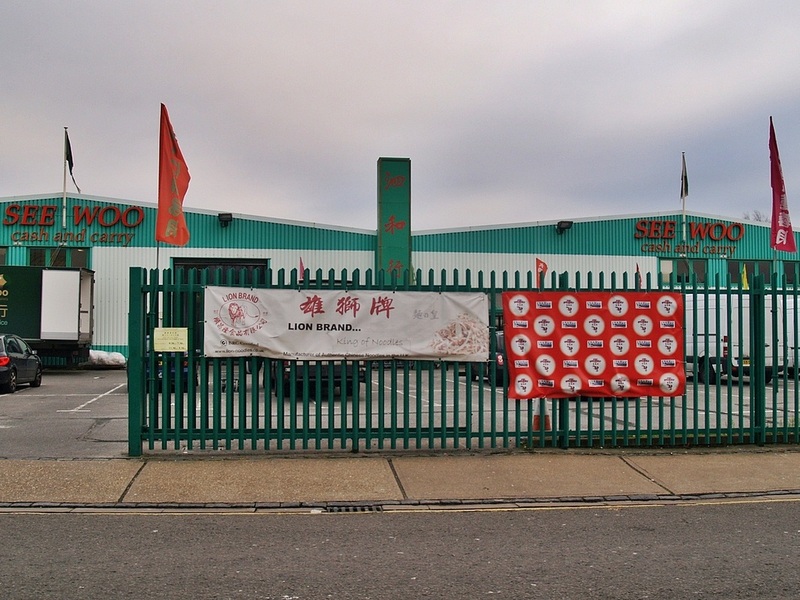 Their first game was widely reported to have been over on the Isle of Dogs against Eastern Wanderers possibly on the site of the first Millwall ground although this is disputed in some quarters. Within months after forming and possibly after their first ever match the decision was made to rename the club to Royal Arsenal FC and use Plumstead Common as a home ground. In their first match here they beat Erith 6-1. 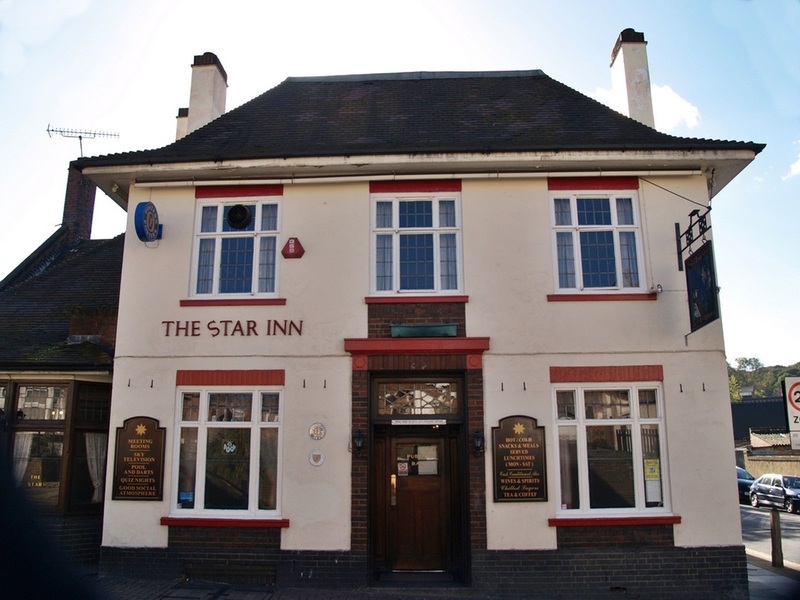 Players used The Star Inn public house as a dressing room. 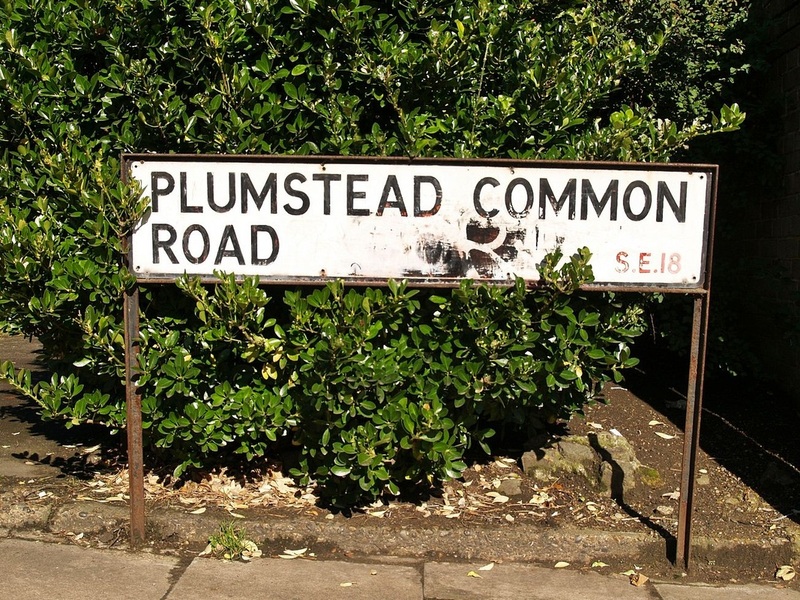 They moved in September 1887 to a pig field on Plumstead Marshes, which was renamed the Sportsman Ground after the Sportsman pub nearby. 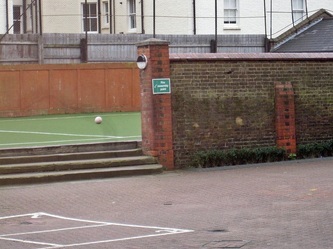 They continued to play there for the next six months. 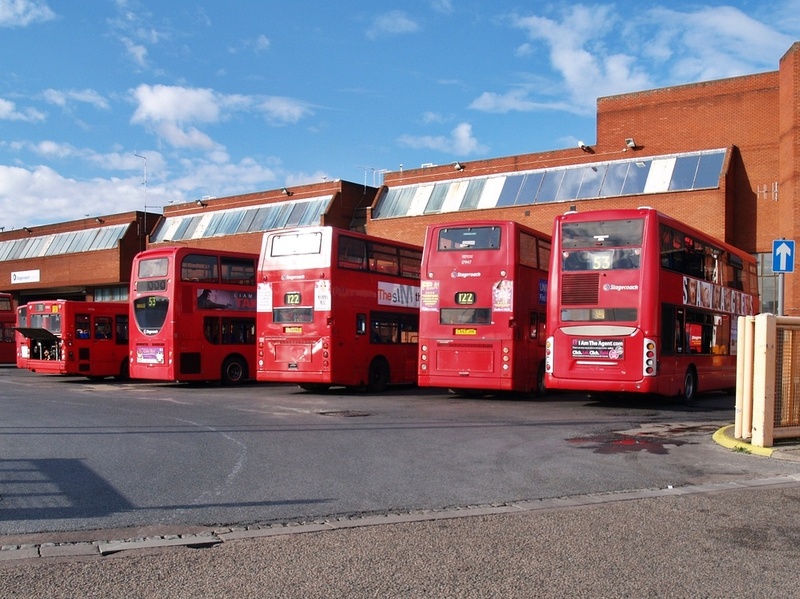 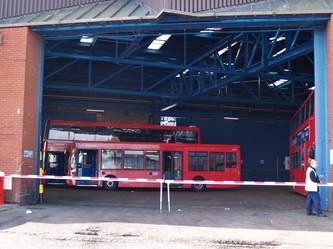 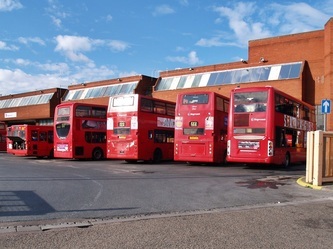 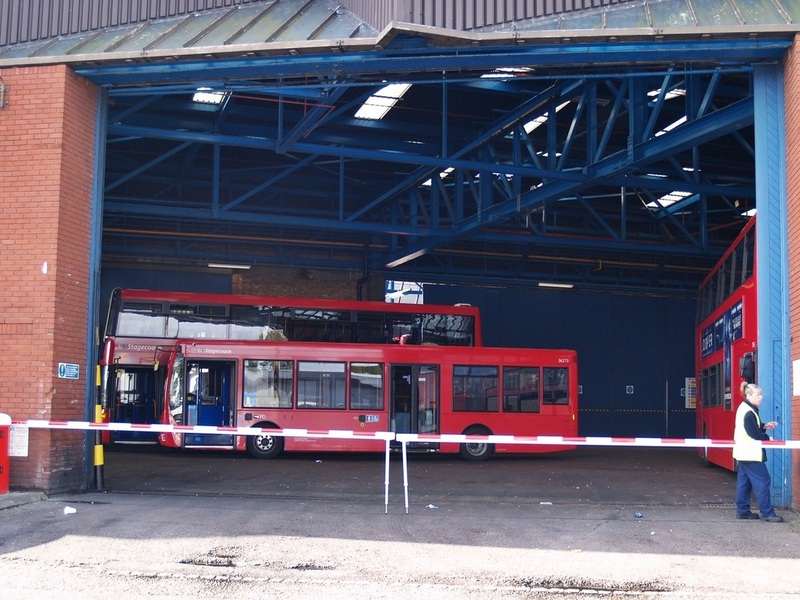 This is roughly the site of the modern day bus depot in Plumstead.The pub is long gone. 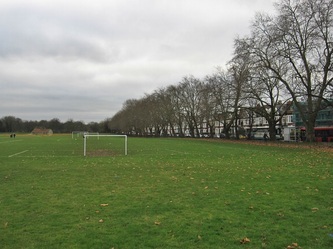 In 1888, after the Sportsman Ground had flooded, the club moved to the adjoining Manor Field (as it was originally known), which was soon renamed Manor Ground. The pitch was notoriously muddy and on its southern side ran a large open sewer. 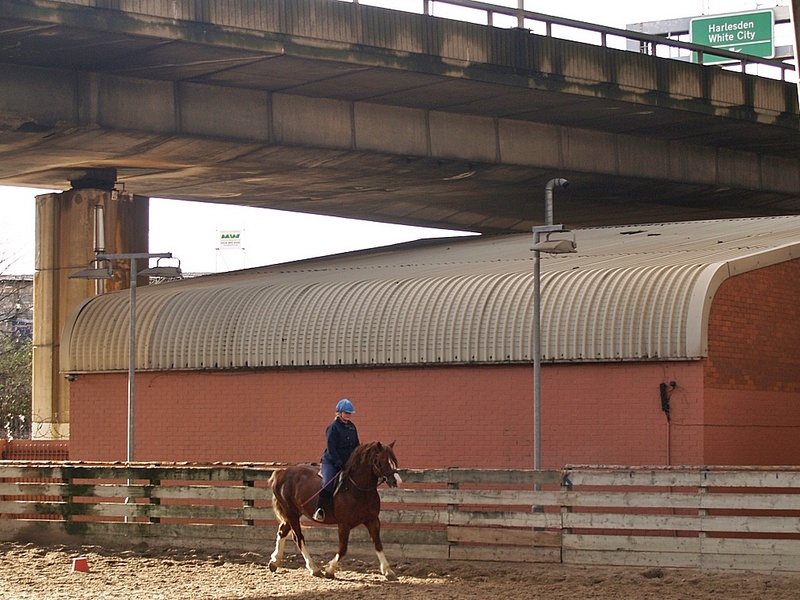 There were no stands as such; the club used wagons borrowed from nearby Army bases to house spectators. The club's first match there was against Millwall Rovers, in 1888; it finished 3-0 to Arsenal. 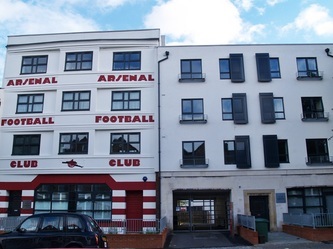 After a move to the Invicta Ground for 3 years, Arsenal returned to the Manor Ground and bought it with money raised from a share issue, erected a single main stand and banks of terracing, and moved back there before the start of the 1893-94 season, in time for the club's Football League debut. 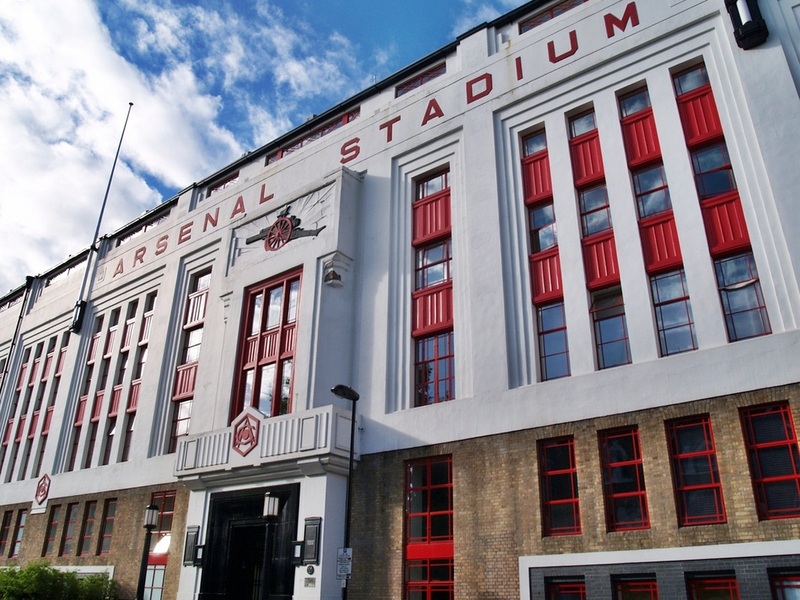 The stadium averaged a gate of 6,000 that season. 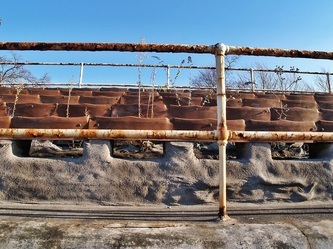 In 1904 a second stand was added (this was the first terrace in the country to be nicknamed Spion Kop,although many other clubs, such as Liverpool, also built "Kop" stands that were better known). 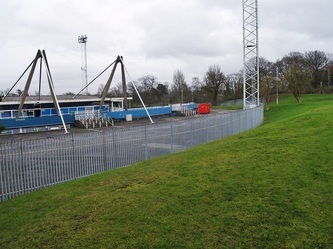 With the club having achieved promotion to the First Division that year, with the additional capacity attendances reached over 20,000 for some matches. 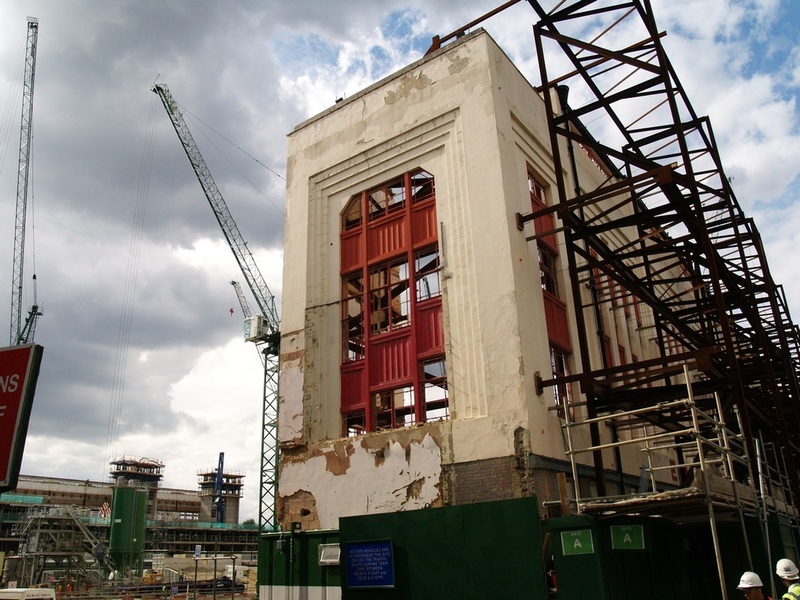 However, in 1910 Woolwich Arsenal faced bankruptcy, with an average crowd dwindling to 11,000. 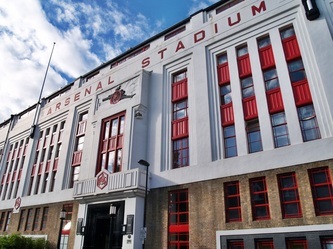 London property magnate and Fulham chairman Sir Henry Norris bought Arsenal out, rescuing the club, and proceeded to move them all the way across London to the new Arsenal Stadium in Highbury three years later, after an attempt to merge Fulham and Arsenal failed. 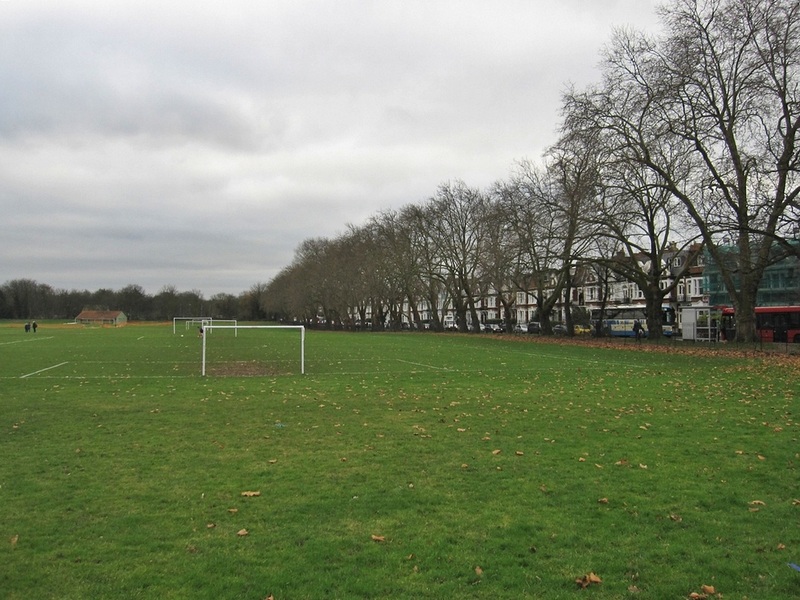 Woolwich Arsenal played their last match at the Manor Ground (against Middlesbrough in front of 3,000 people) in 1913. 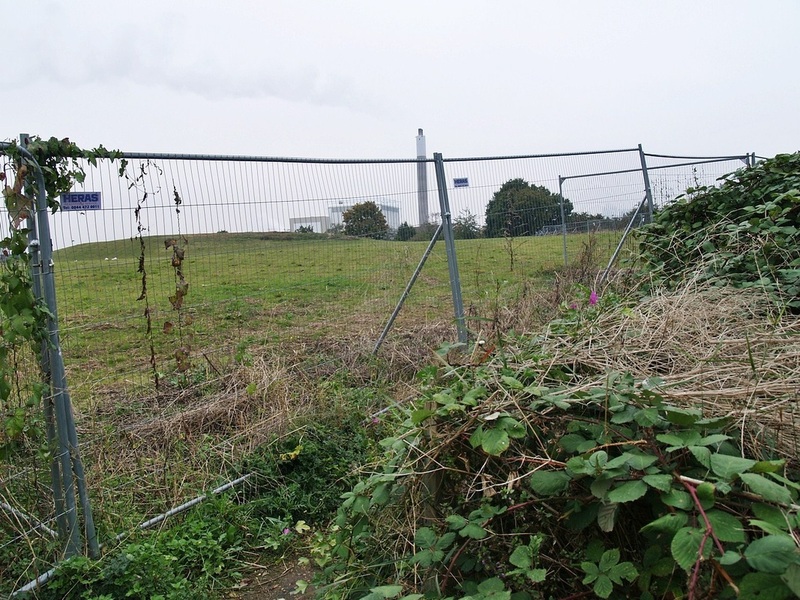 After they left, the ground soon fell derelict, and was eventually demolished and the land redeveloped. 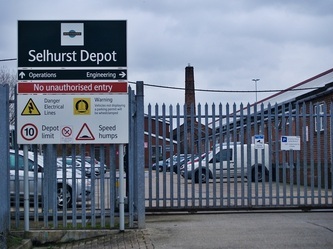 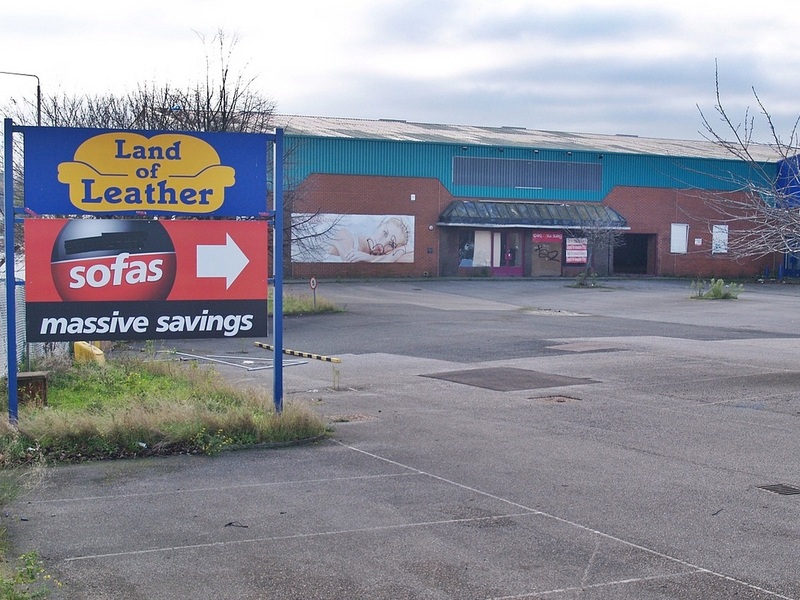 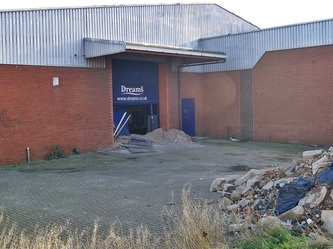 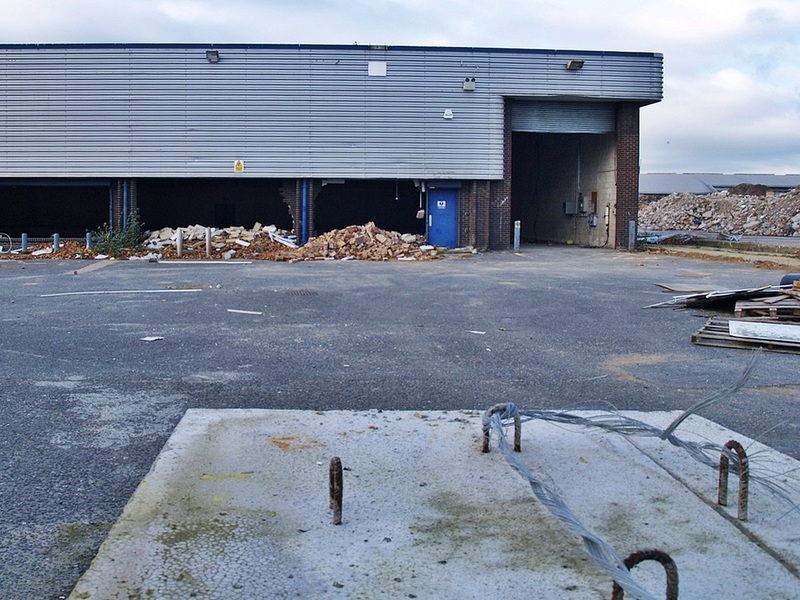 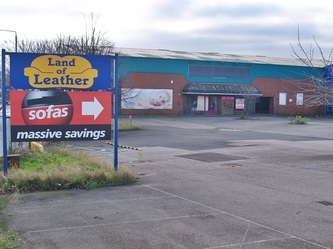 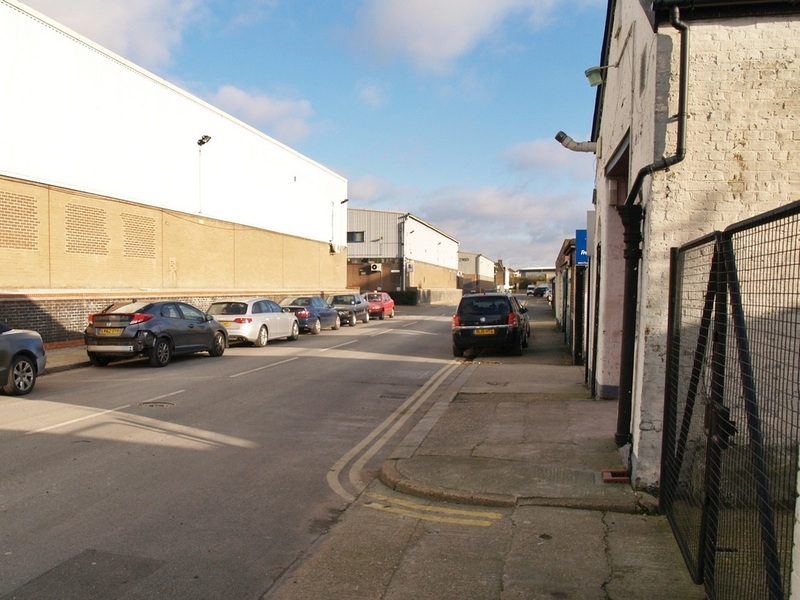 Today it is home to a run down industrial estate which itself is due to be redeveloped next year. 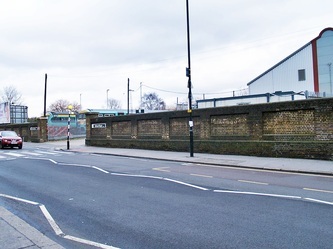 In 1890, Royal Arsenal decided to move from The Manor Ground to the much more suitable Invicta Ground (which possessed a stand, terracing and changing rooms), on the south side of Plumstead High Street. 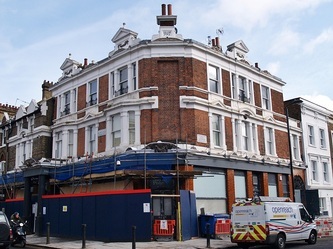 They stayed there for three years and in the meantime changing their name to Woolwich Arsenal , and turning professional, before leaving after the owner of the Invicta raised the rent on the ground. They went back to their previous Manor Ground and an amateur side, Royal Ordnance Factories FC played some home games at the Invicta but they left a year later and the ground was redeveloped into the Victorian housing that is on the site now. 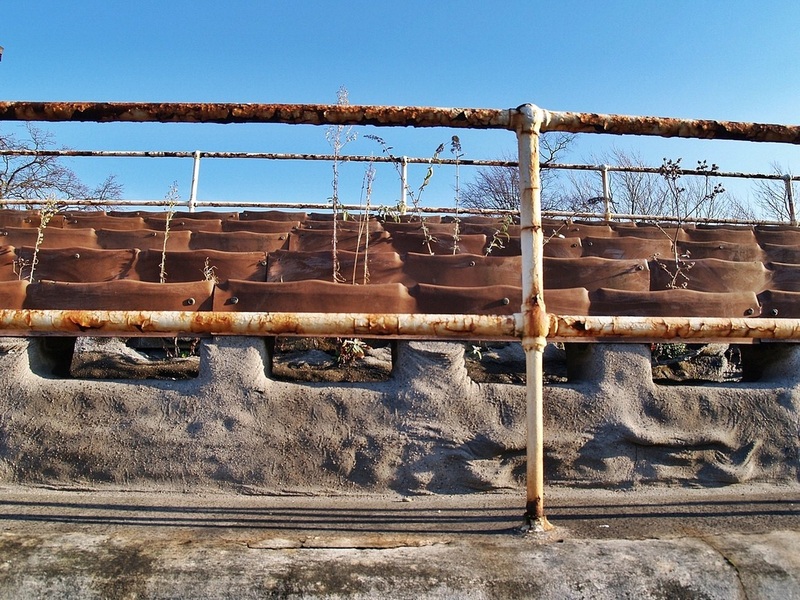 Some of the stadium's terracing still survives in the back gardens of houses in Hector Street though this is quite difficult to spot by the casual passer by. Arsenal Stadium, known almost universally by its original name of Highbury was the home to Arsenal for the longest period. 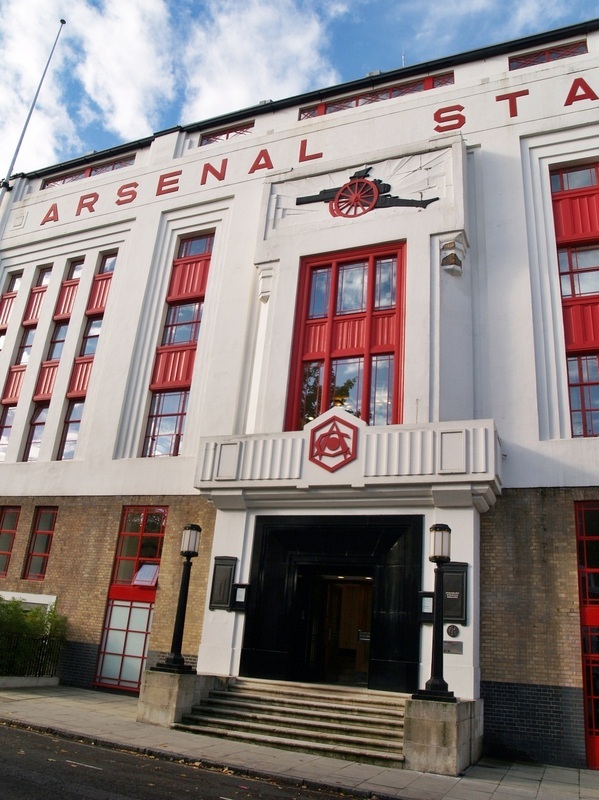 The presence of the stadium led to the local Gillespie Road station being renamed Arsenal in 1932, making it the only London Underground station to be named after a football club. 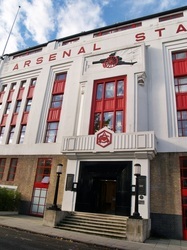 The need for a higher crowd capacity led to Arsenal building the Emirates Stadium nearby, which they moved to in 2006. 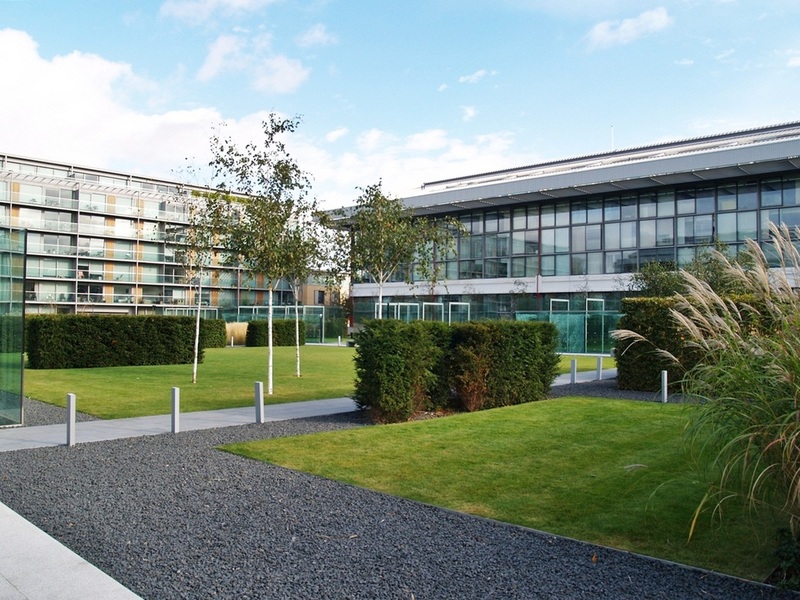 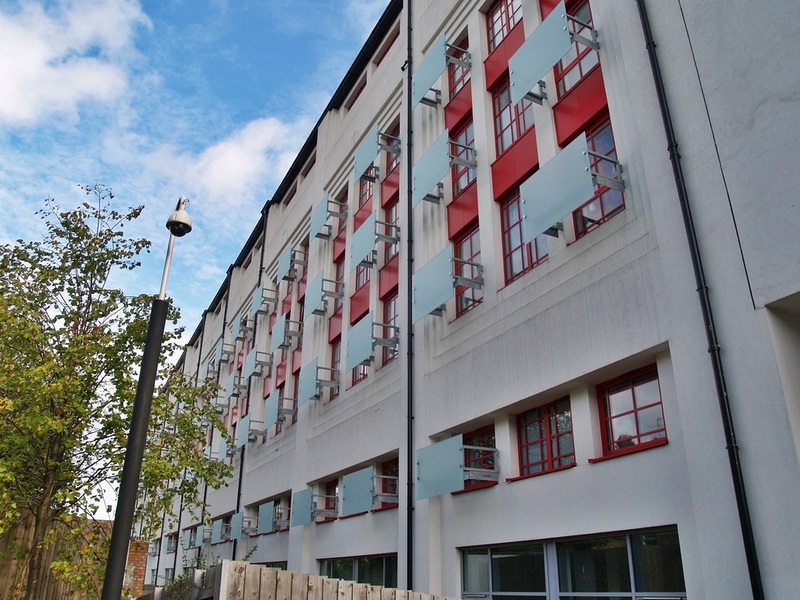 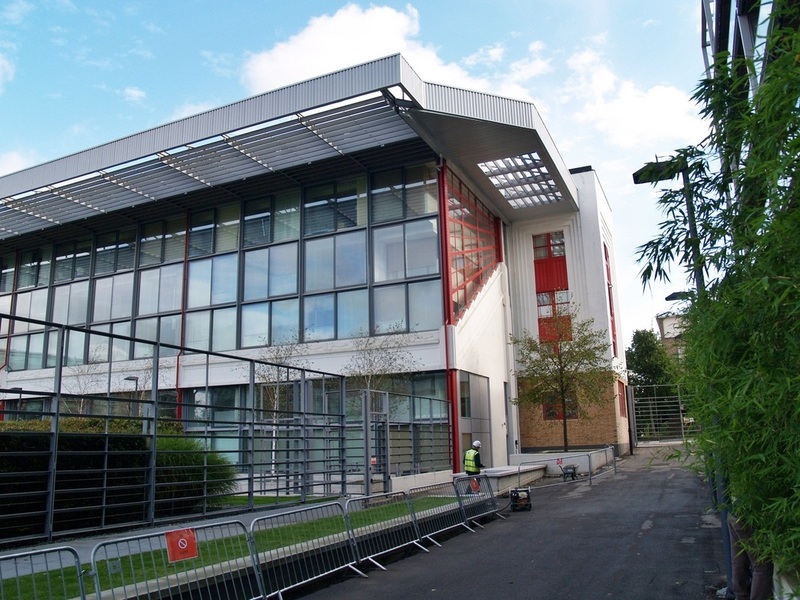 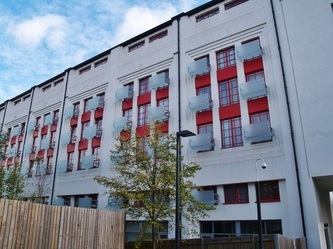 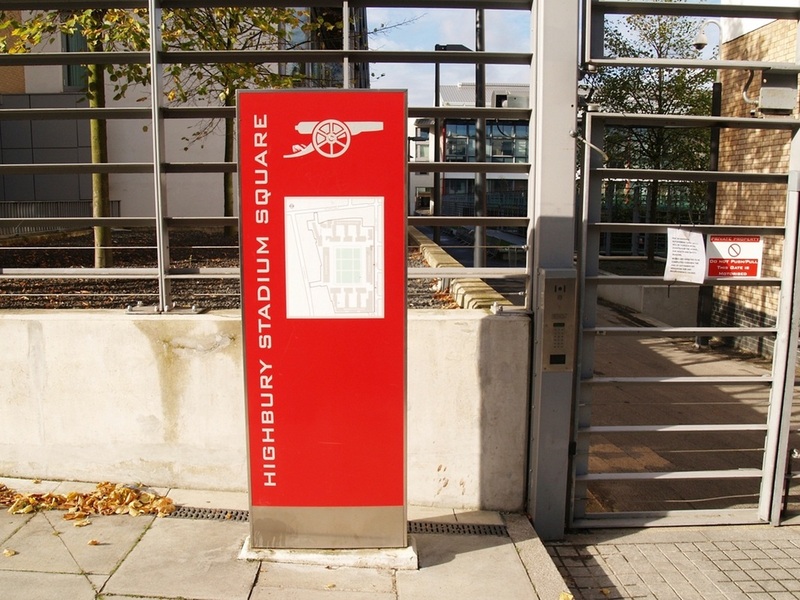 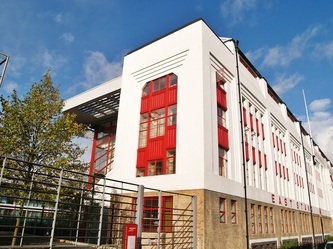 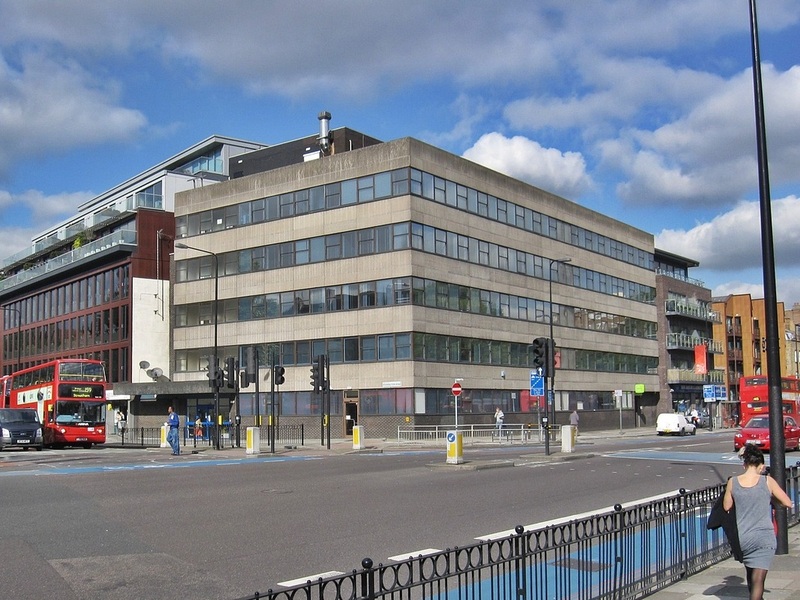 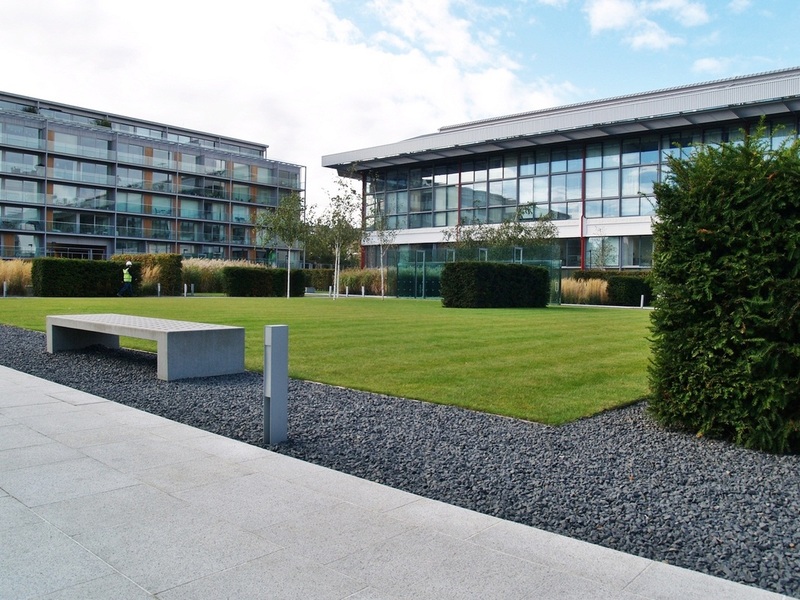 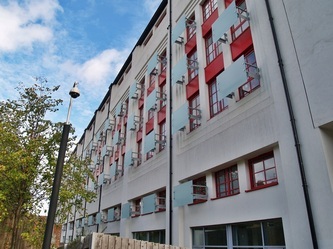 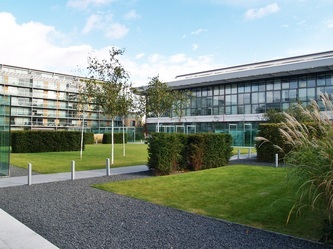 The stadium has been redeveloped into an apartment complex, known as Highbury Square, with much of the stadium having been demolished; the exteriors of the listed Art Deco East Stand and the matching West Stand have been preserved and incorporated into the new developments where flats could cost you anything from £350-950k each. 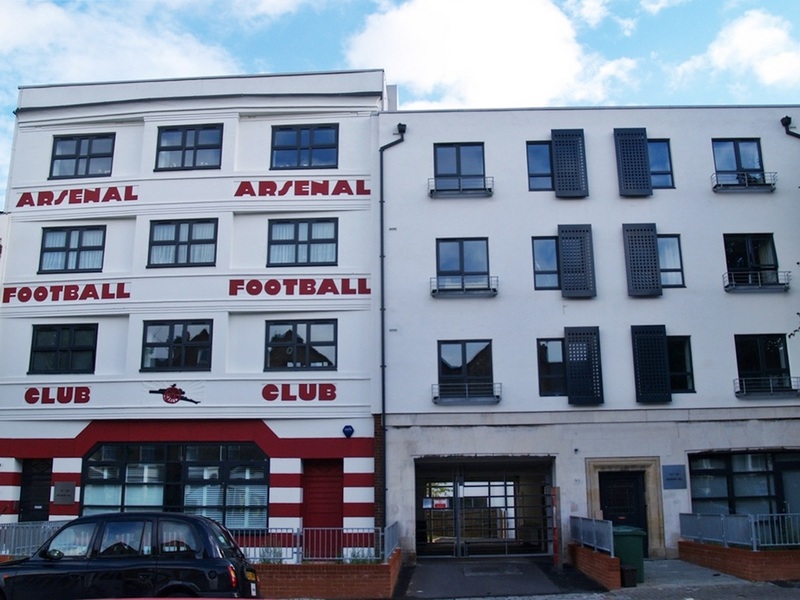 Former Arsenal player Robert Pirès owns one of the apartments. 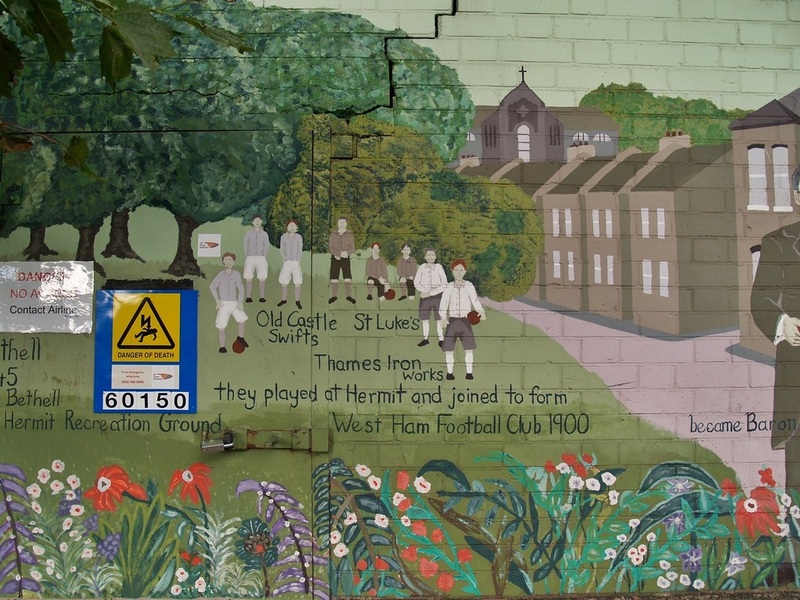 The earliest incarnation of West Ham United was in 1895 as the Thames Ironworks team. 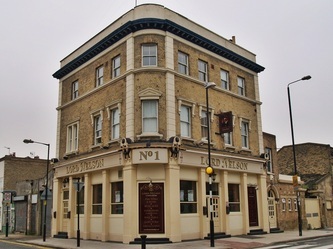 The team played on a strictly amateur basis until 1898, with a team featuring a number of works employees including the ships fireman, a clerk, boilermakers and an apprentice riveter. 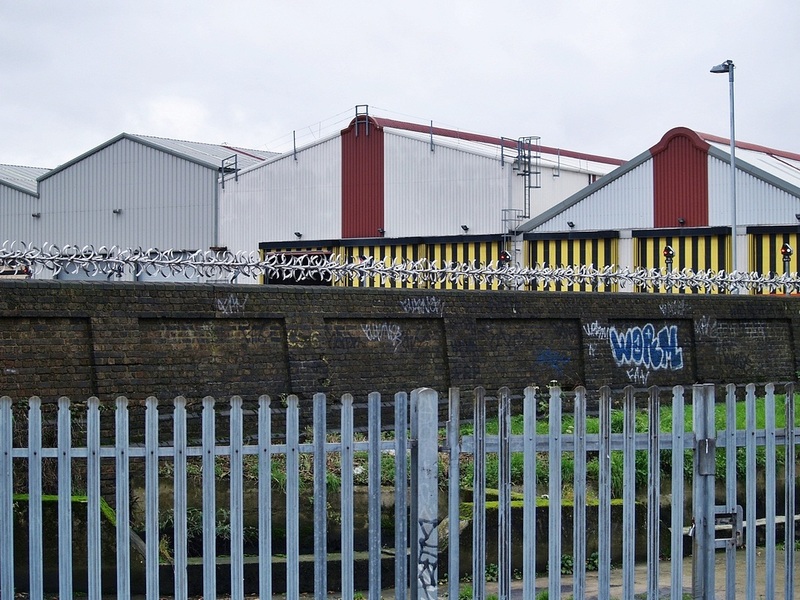 During the 1800’s the Thames Ironworks and Shipbuilding Company built & launched around 900 vessels into the River Thames from its Bow Creek shipyard. The memory of the company lives on in the badge and nickname of its works football team, West Ham United FC. 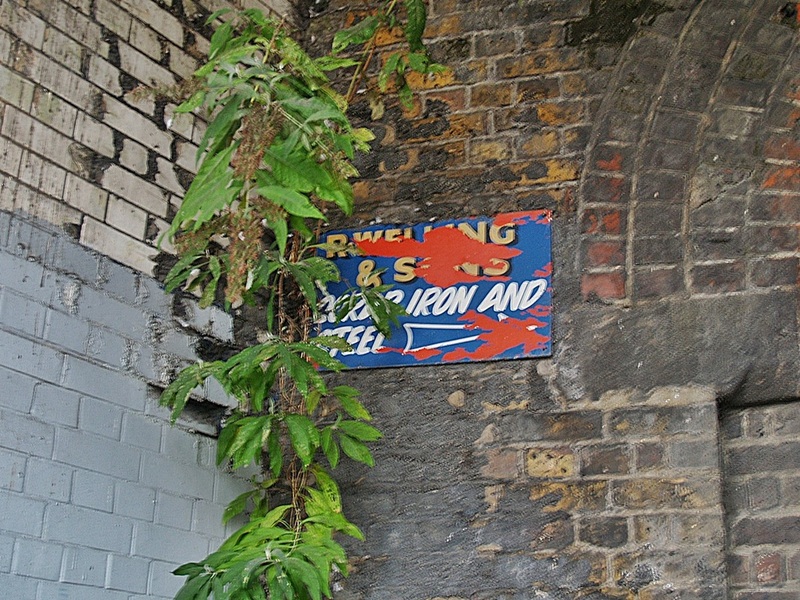 ‘Ironworks’ long ago became shortened to ‘Irons’ and ‘Hammers’ refers not to ‘West Ham’ but to the crossed tools on the club badge. Following growing disputes over the running and financing of the club in June 1900 Thames Ironworks F.C. 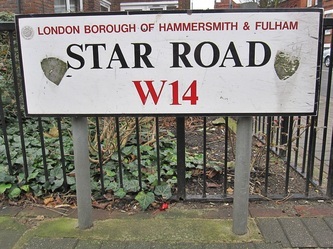 was disbanded, then immediately relaunched as West Ham United F.C. Thames Ironworks had taken over the tenancy of the ground in the summer of 1895 from Old Castle Swifts F.C., who were the first professional football club in Essex. 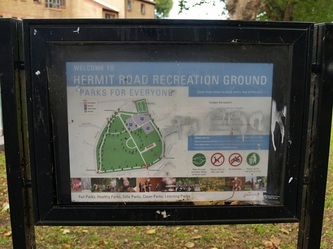 The Hermit Road ground had been described as a 'cinder' heap' and 'barren waste'. 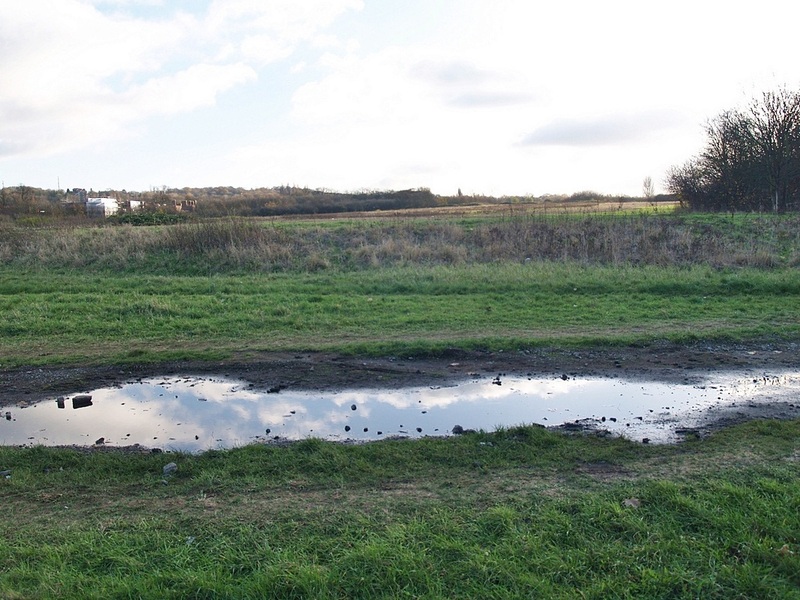 It was surrounded by a moat. 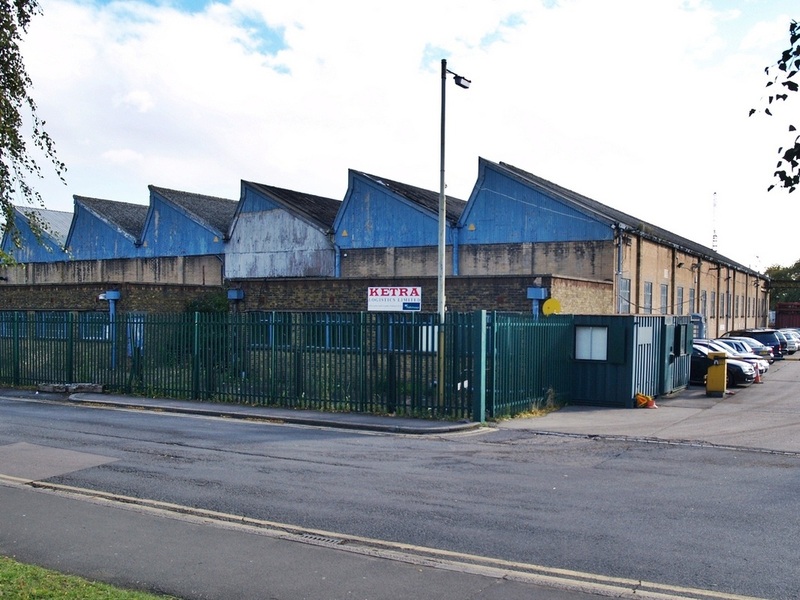 Thames Ironworks played their first ever fixture of the 1895-96 season against Royal Ordnance reserves in September 1895, the game ending 0-0. 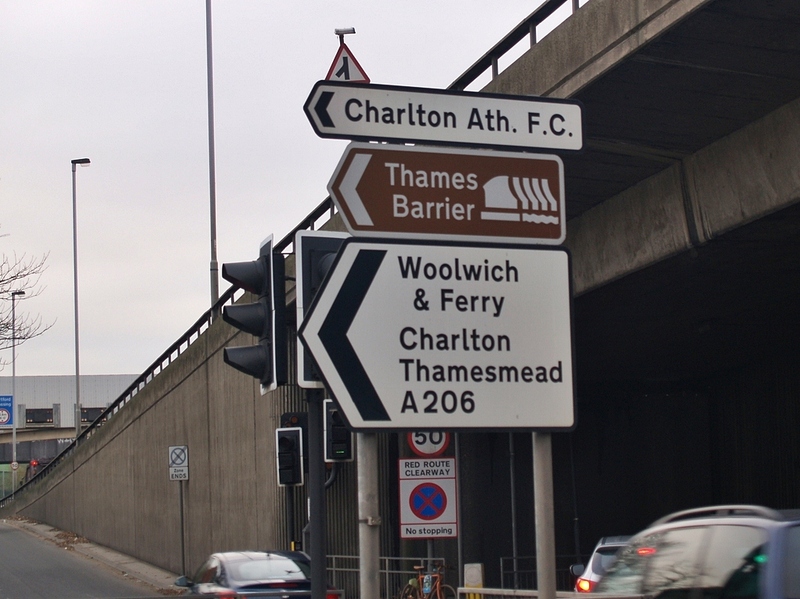 In Thames' first competitive game, they took on Chatham in a preliminary qualifying round of the FA Cup . 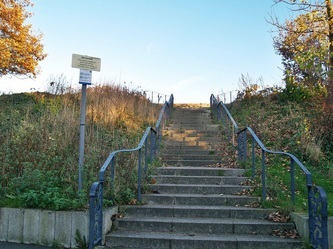 The match had to be played at Chatham's ground in Kent as they had rated the Irons' Hermit Road Ground as unsuitable. 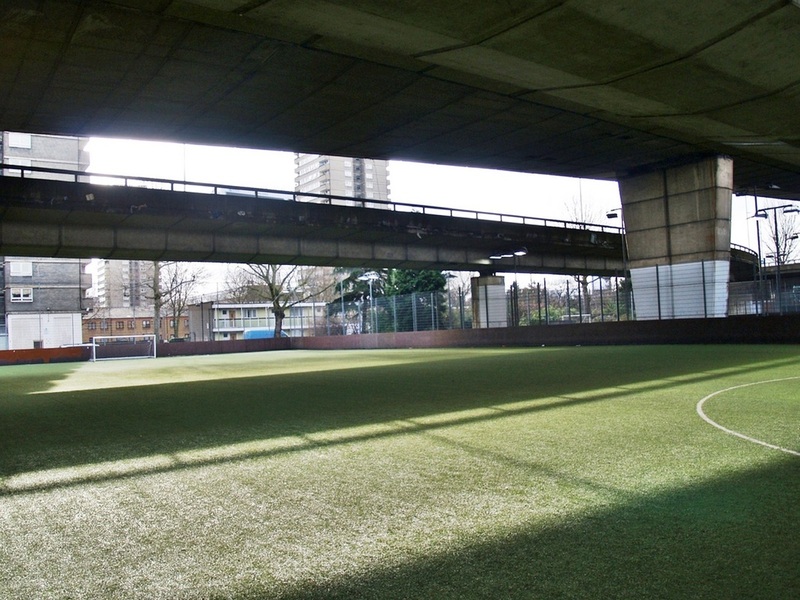 March 1896 saw an experimental 'floodlit friendly' in Thames' first encounter with Woolwich Arsenal. 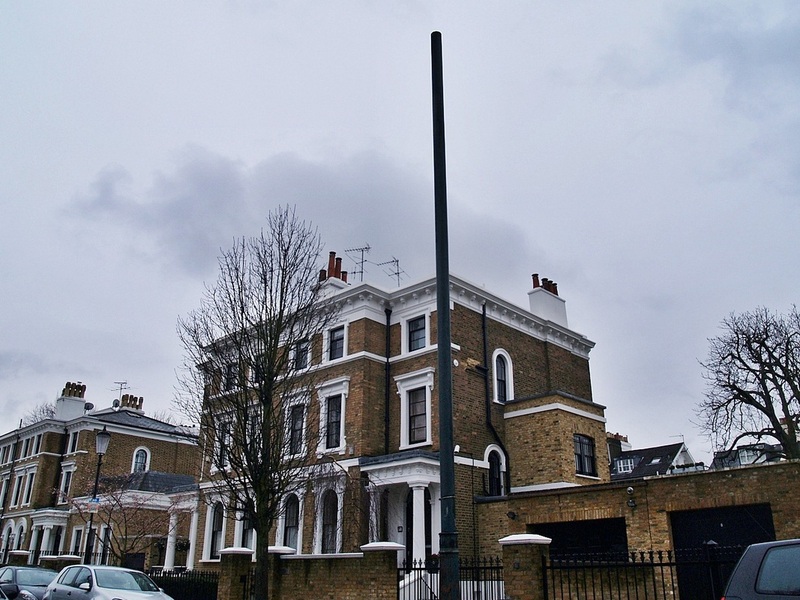 These early attempts at floodlighting were set up using Thames Iron Works engineers and equipment, and caused an amount of notoriety. They were also used for "The Irons" next game, in their first ever meeting with West Bromwich Albion, which they lost 2-4. 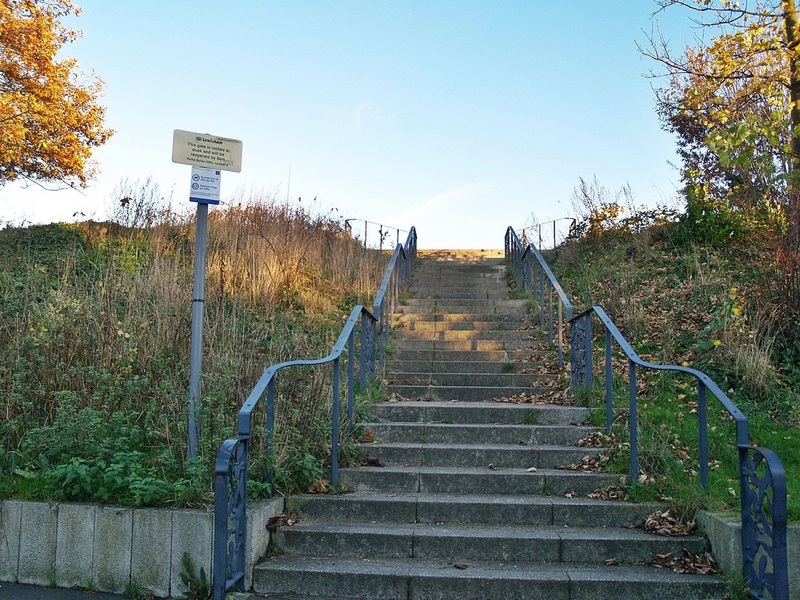 The last game at Hermit Road was in October 1896, when they beat 1st Scots Guards 1-0. Later that month they were handed an eviction notice from Hermit Road by their landlords. 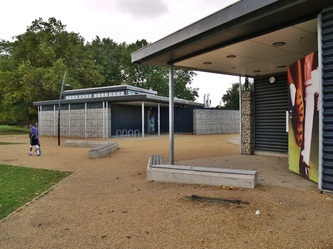 The club had violated their tenancy agreement by charging admission fees and building a perimeter fence and pavilion. 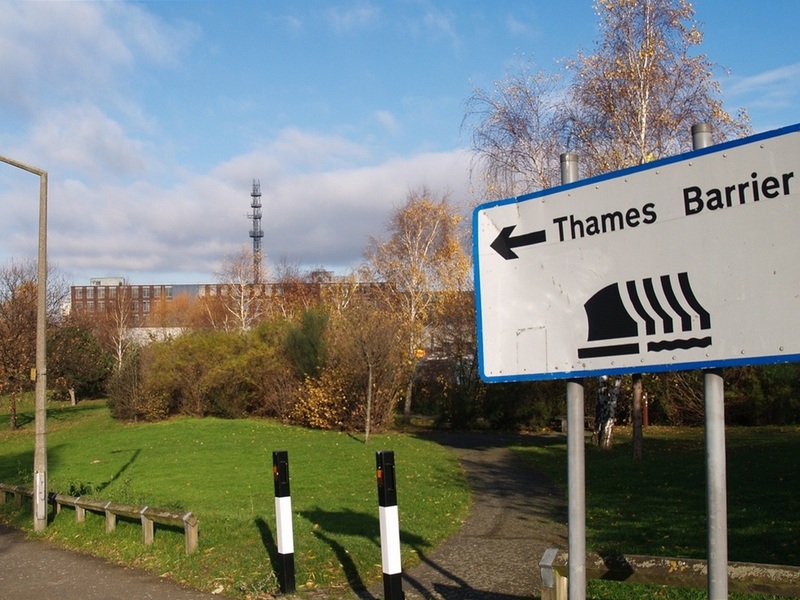 Thames Ironworks had to play their next four fixtures at the grounds of their opponents, until a new home could be found. 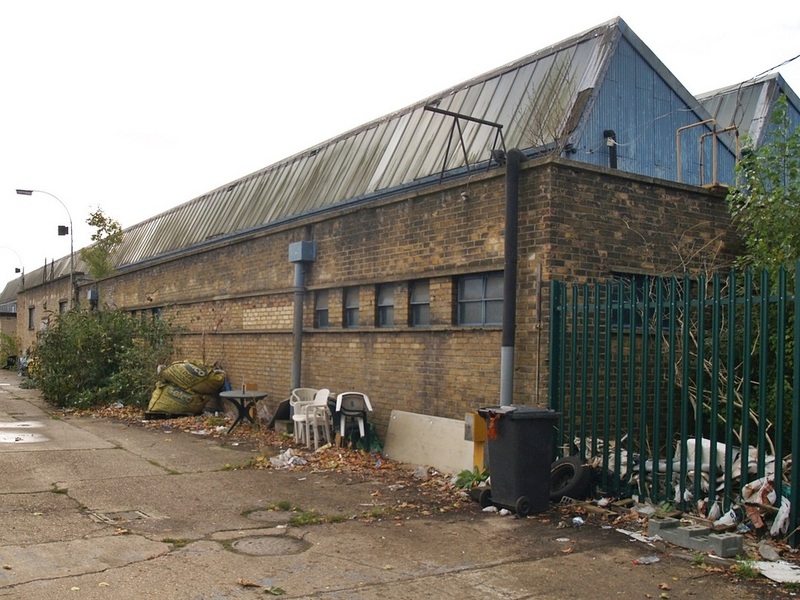 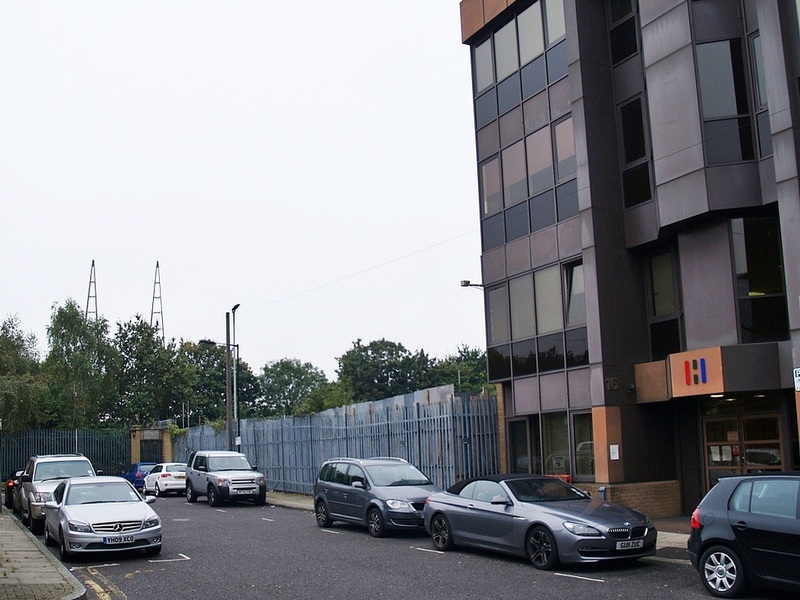 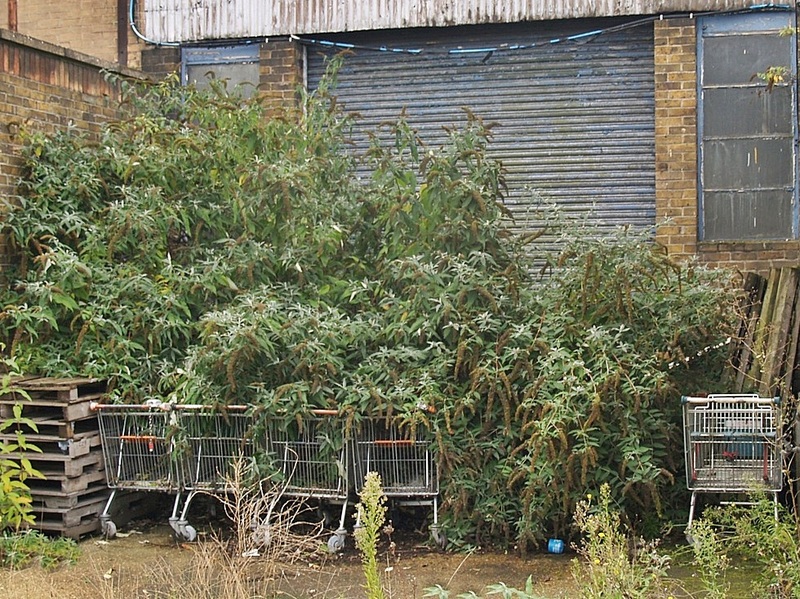 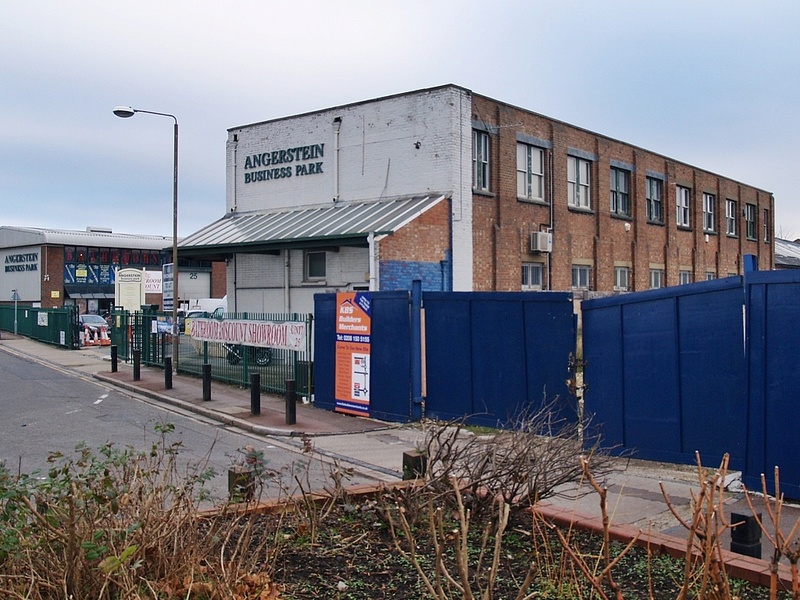 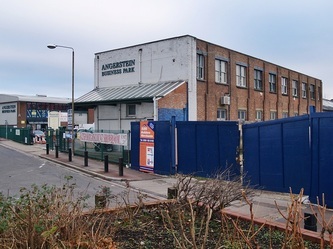 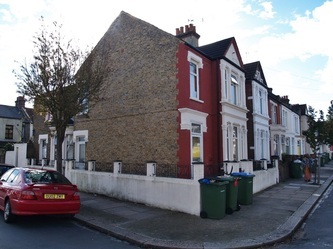 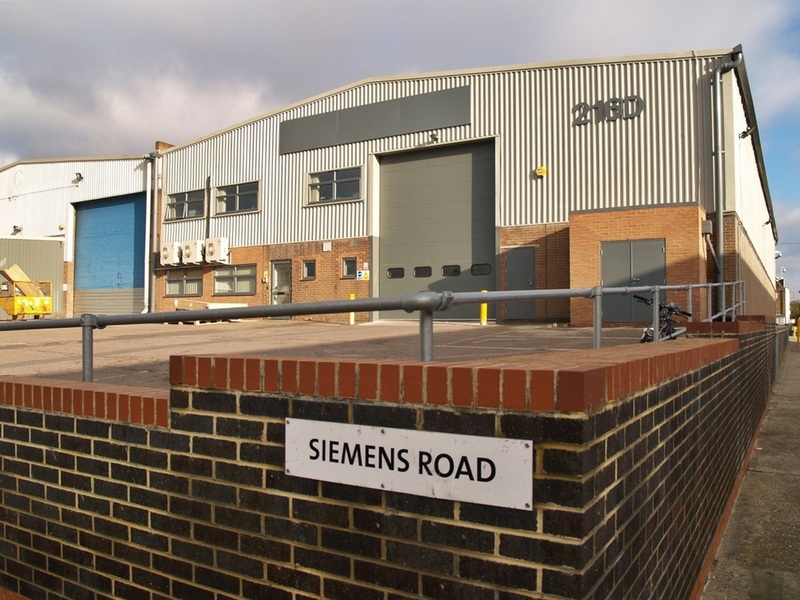 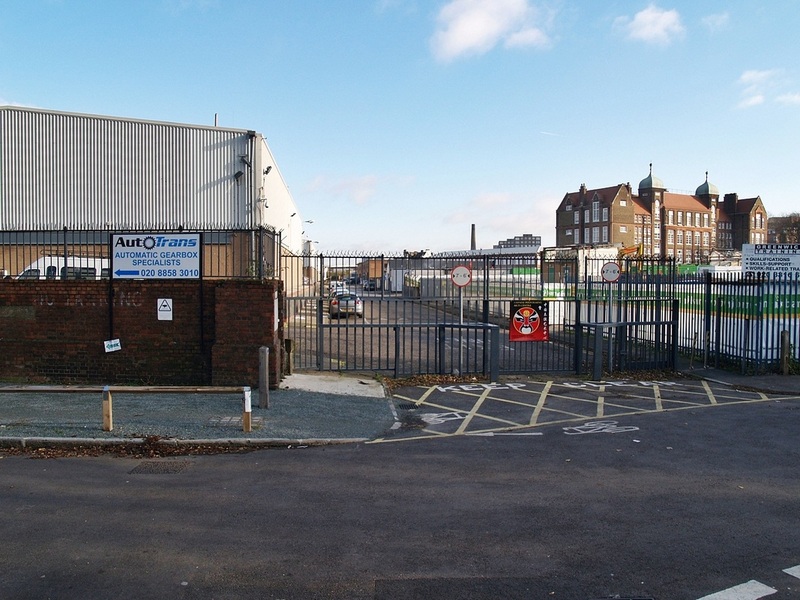 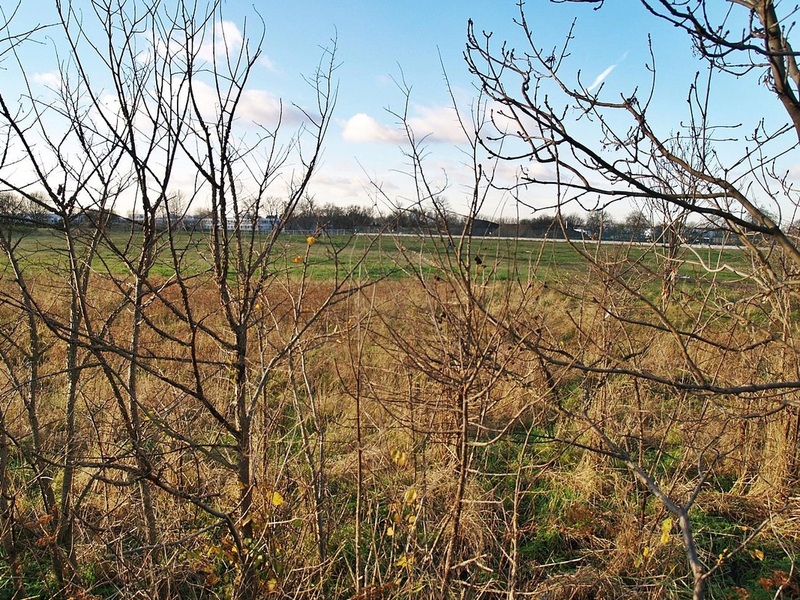 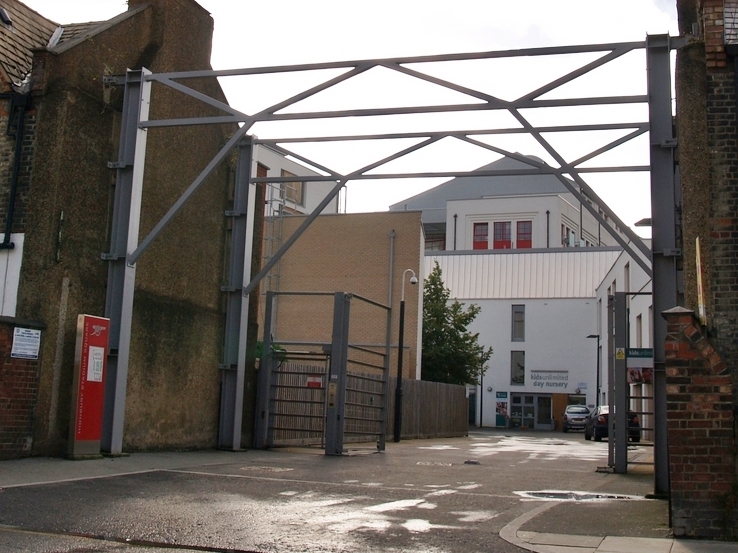 At the turn of 1897, managed to lease a temporary piece of land for the team, located in Browning Road, East Ham but this was only for a couple of months. The Memorial Grounds in Manor Road, Canning Town were opened on Queen Victoria's Diamond Jubilee Day in June 1897. 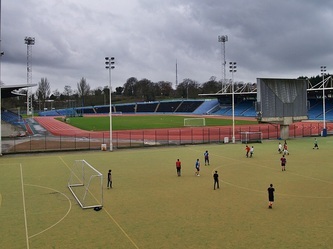 Aside from a football pitch, the stadium contained a cycle track, a running track, tennis courts and one of the largest outdoor swimming pools in England. 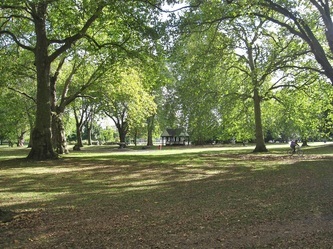 It was said at the time that the grounds were "good enough to stage an English Cup Final." 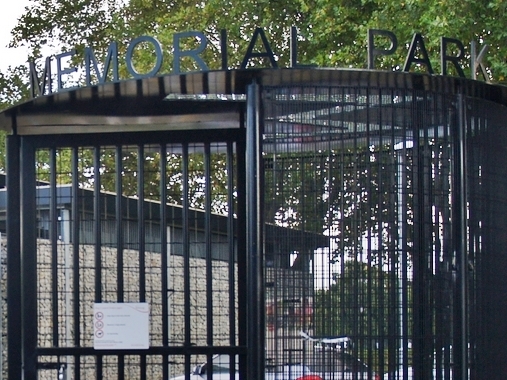 In their first game at the Memorial Ground, Thames Ironworks beat Brentford 1-0. 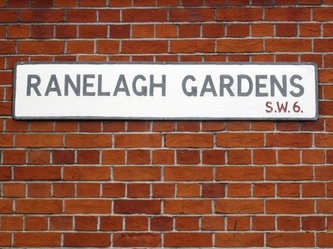 The team were relaunched and renamed west Ham in 1900. 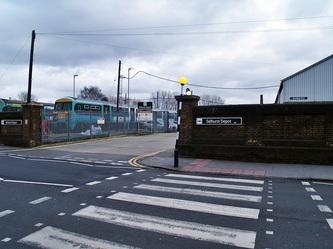 The club secured an agreement with the railways to build a station at Manor Road which opened in 1901 as West Ham. 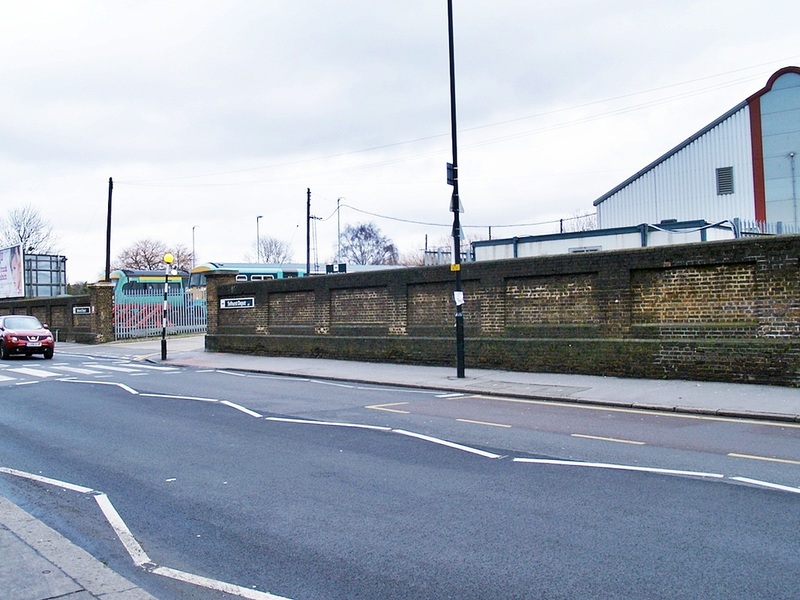 The team moved to the Boleyn Ground (initially known as The Castle Ground) in 1904 where they remain to this day. 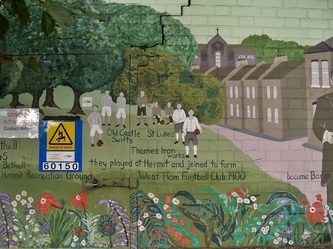 Despite the shift in team name the club (and its fans) are to this day referred to as "The Irons" and "The Hammers" due to the original connection. 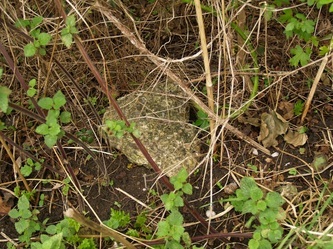 One of the decaying stands was still in situ in the early 1980s. 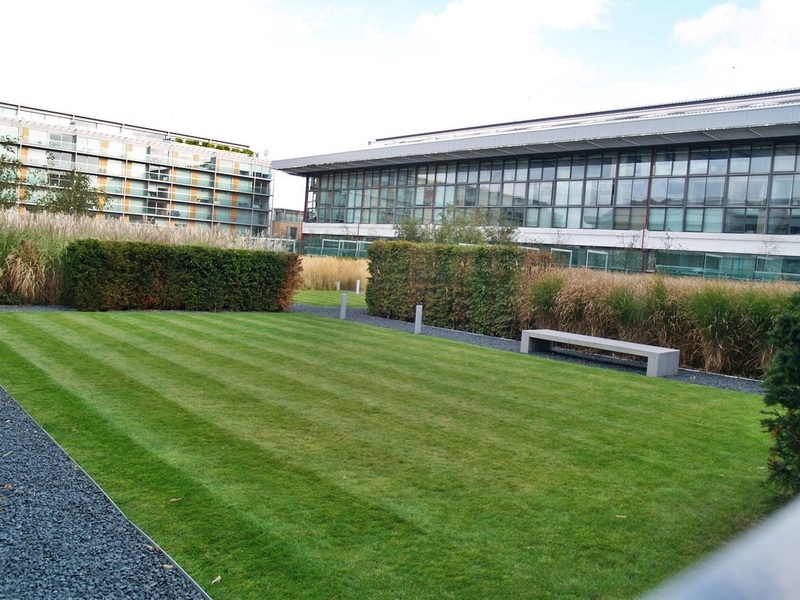 These days the grounds remain laid out as playing fields with community facilities & changing rooms in new buildings. 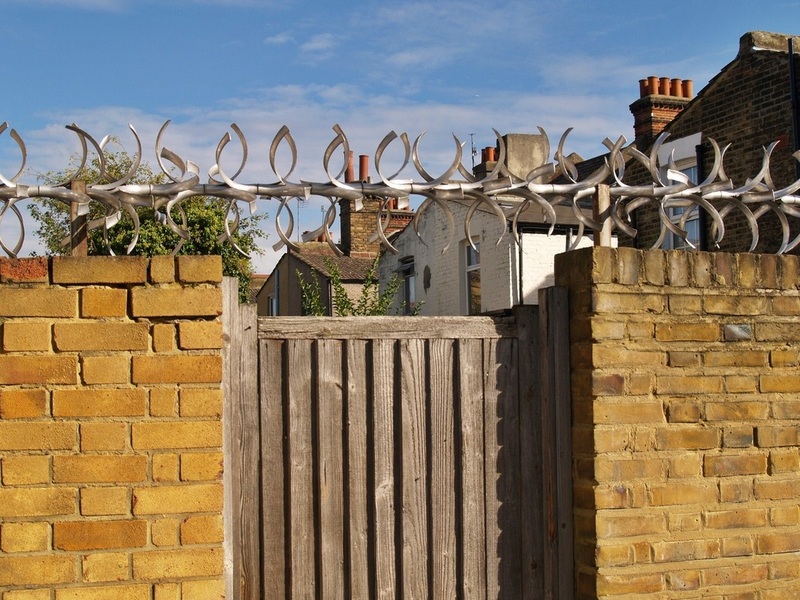 In Grange Road close to an entrance to the Memorial Ground are some old gates. 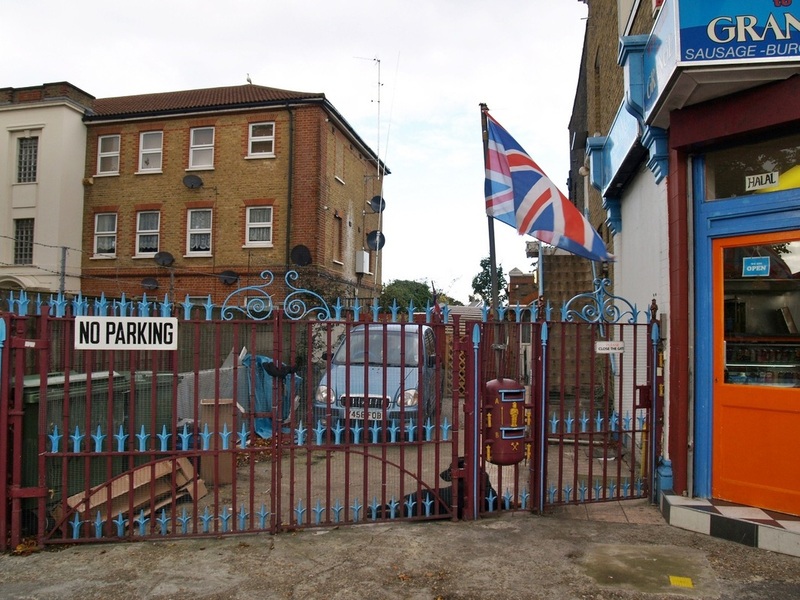 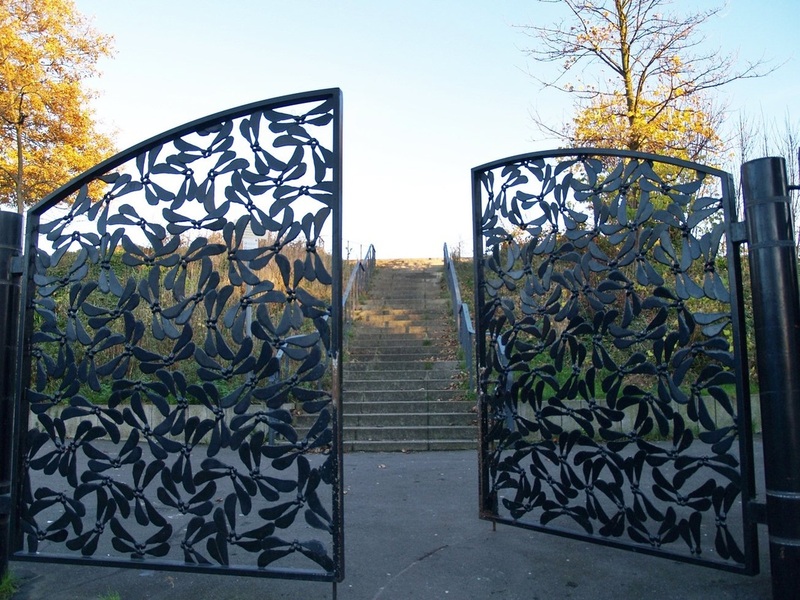 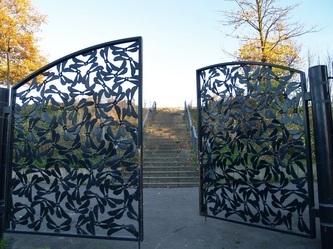 These are actually the original entrance gates of the Boleyn ground rather than of the Memorial Ground. 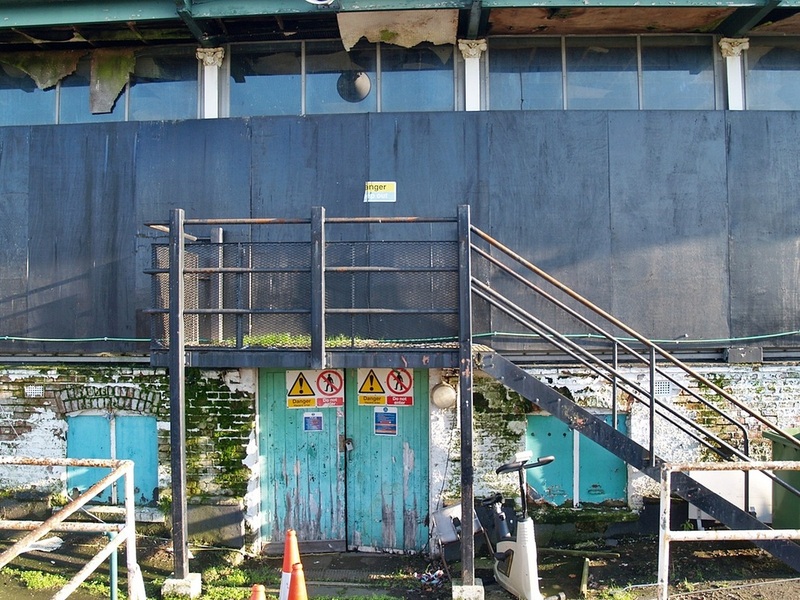 Though there is some confusion over this and some sources say that this was the original entrance to the changing rooms of The Memorial Ground. 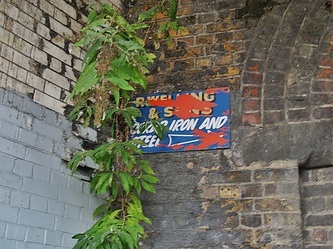 Whatever ground they were used for, there is a good chance that they were forged in the Thames Ironworks. 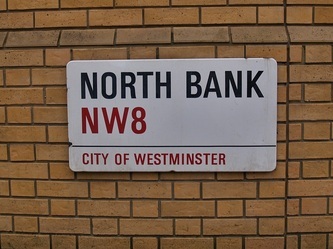 It was the home of the London Knights ice hockey team, the London Towers basketball team and later the Greater London Leopards basketball team. 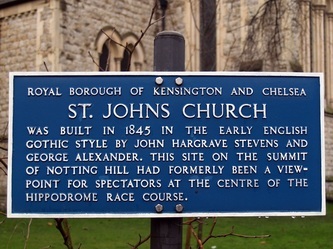 It also hosted boxing matches and wrestling events. This was also used as a live music venue - first band to ever play here were Duran Duran. 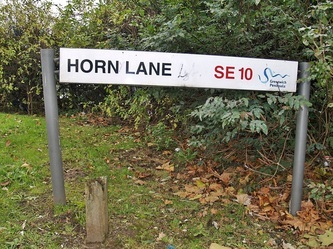 Slipknot and S Club 7 recorded live DVDs here (though not at the same time...). 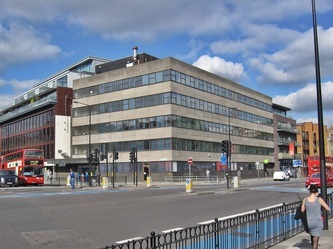 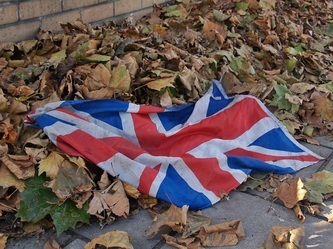 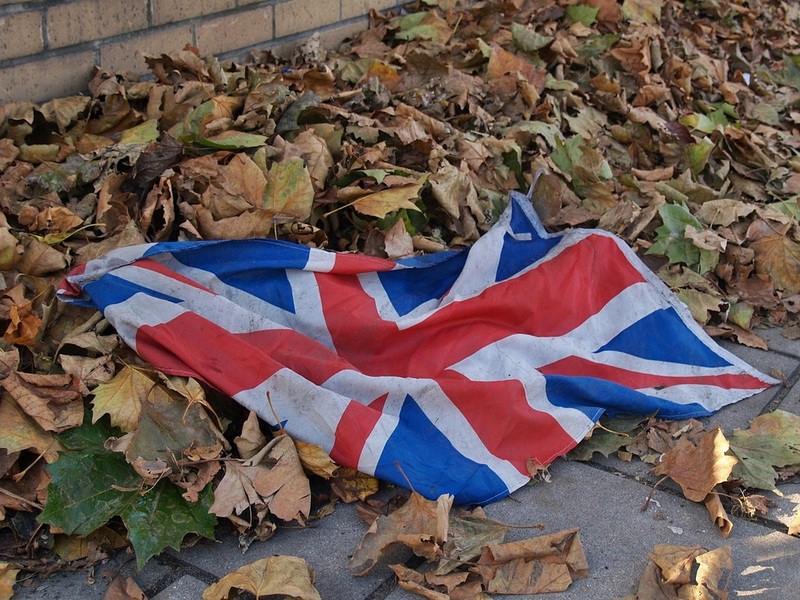 The event was notorious for an incident in 1991 at the Smash Hits Poll Winners Party involving Phillip Schofield and Carter USM, when the band's performance was cut short, causing them to "trash up" the stage. 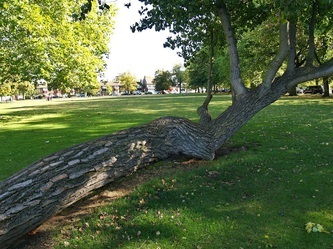 Following this, when Schofield made a remark about the band's behaviour, their guitarist Les "Fruitbat" Carter rugby tackled Schofield. London Arena was immediately adjacent to Crossharbour and London Arena DLR station, which has since been renamed to simply Crossharbour. 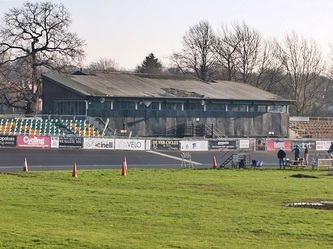 The venue was used for greyhound racing and speedway on weekdays and was the only greyhound/speedway stadium designed by the famous Archibald Leitch (he who designed numerous football stadia such as Arsenal, Stamford Bridge, Craven Cottage, Selhurst Park & White Hart Lane plus many more all over the UK). 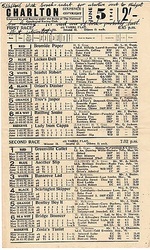 The West Ham Greyhound track was the largest in Britain at 562 yards long with 123 yard straights. 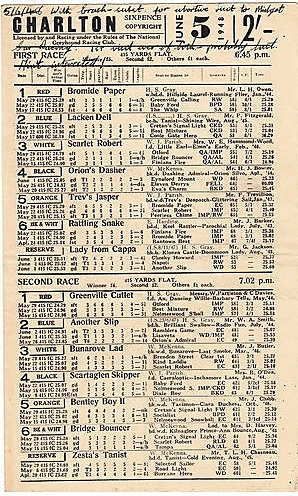 It was so big that, standard races over 550 yards meant that the dogs didn't even have to run a complete lap! 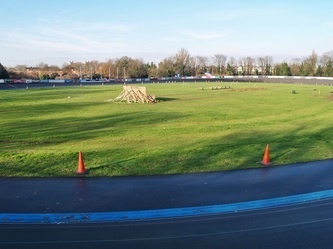 It was considered one of the fastest tracks in the country and at its peak held eight world records. 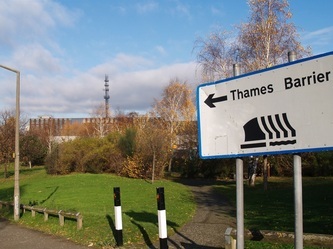 To fill the stadium on weekends, a football team, Thames Association FC, was founded in 1928 and after only 2 years they were promoted to the Football League Third Division South. Although the stadium could hold 120,000, Thames AFC had trouble attracting crowds and created the lowest recorded attendance in Football League history when just 469 people turned up to watch Thames take on Luton Town in 1930. 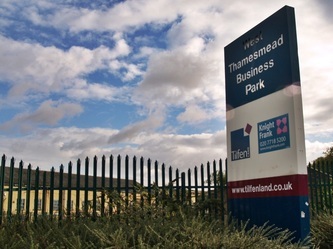 Thames resigned from the Football League in 1932 after finishing bottom and were dissolved soon afterwards & were replaced in the league by Aldershot in 1933. 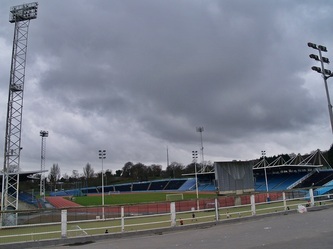 The stadium also hosted local baseball sides' home games in the 1930s and 1940 and stock car racing was held in the stadium in the 1950s and 1960s. 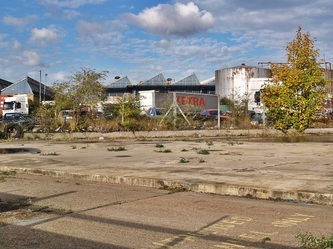 The 1961 the stock car World Championship was held at West Ham Stadium. 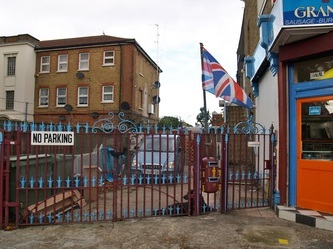 The Greyhounds and Speedway (The West Ham 'Hammers' and, subsequently, the short-lived Romford Bombers - who used the RAF roundel insignia as their emblem) lasted until 1972 when the stadium closed. 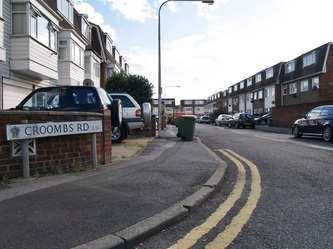 The Speedway Hammers team were often in the top flight leagues and The Lakeside Hammers speedway team, who these days race next to Lakeside Shopping Centre in Essex, are the closest team and took their name from the defunct West Ham Hammers outfit. 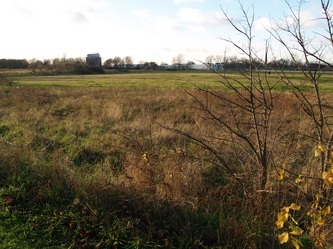 The stadium was sold to developers who evicted the speedway team and closed the stadium in 1972. 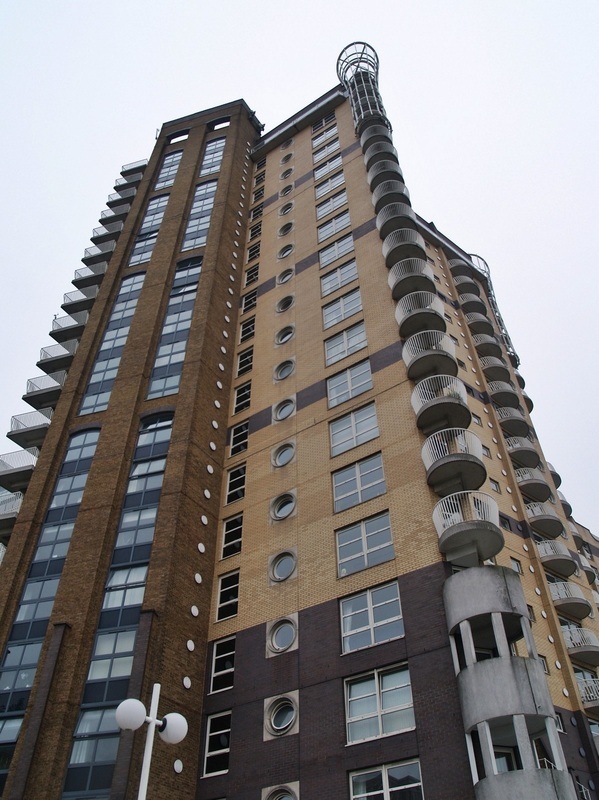 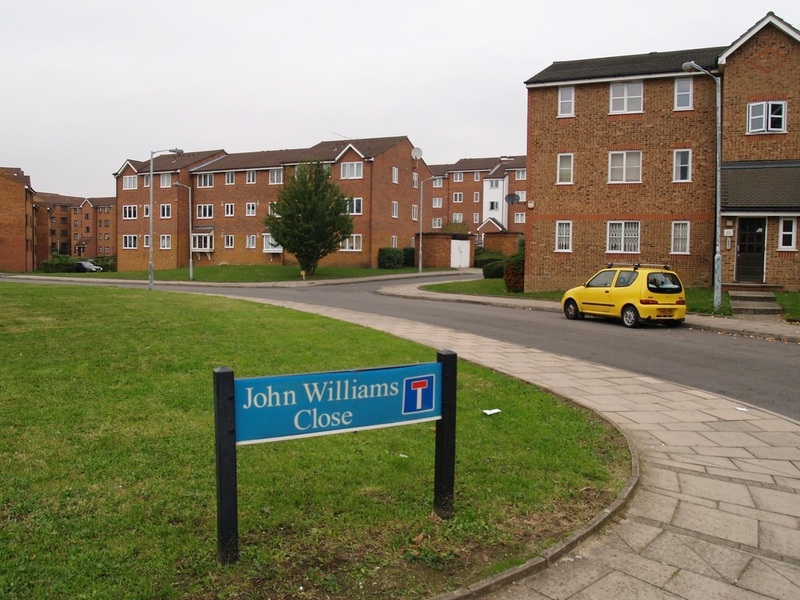 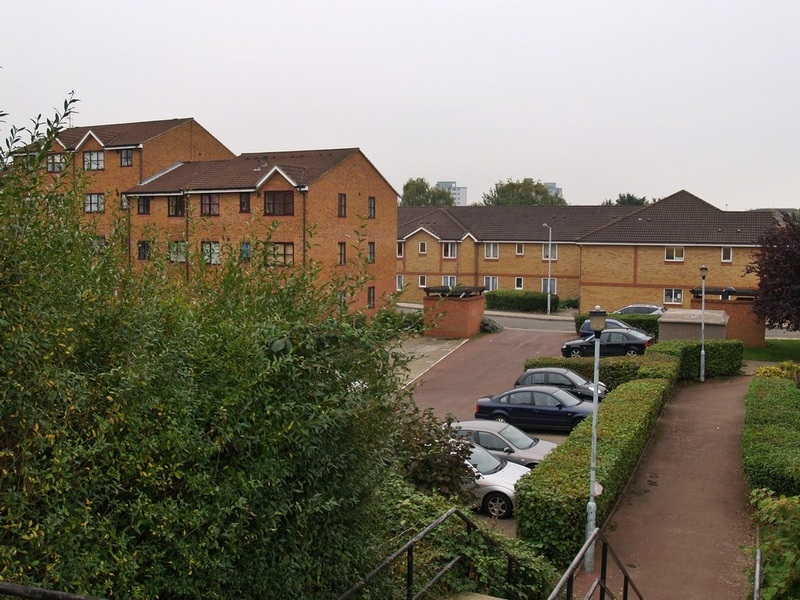 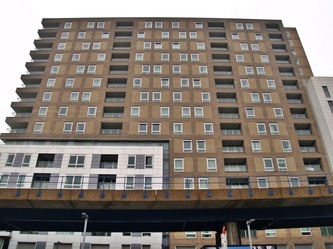 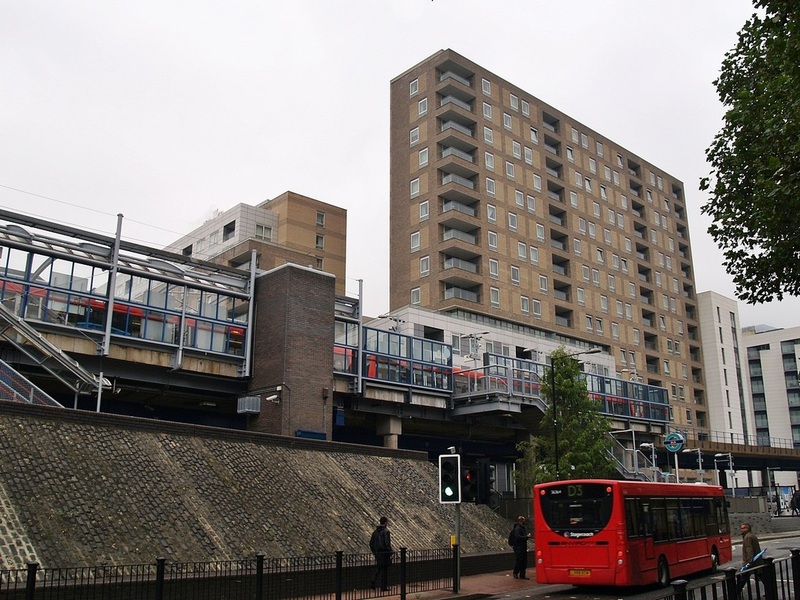 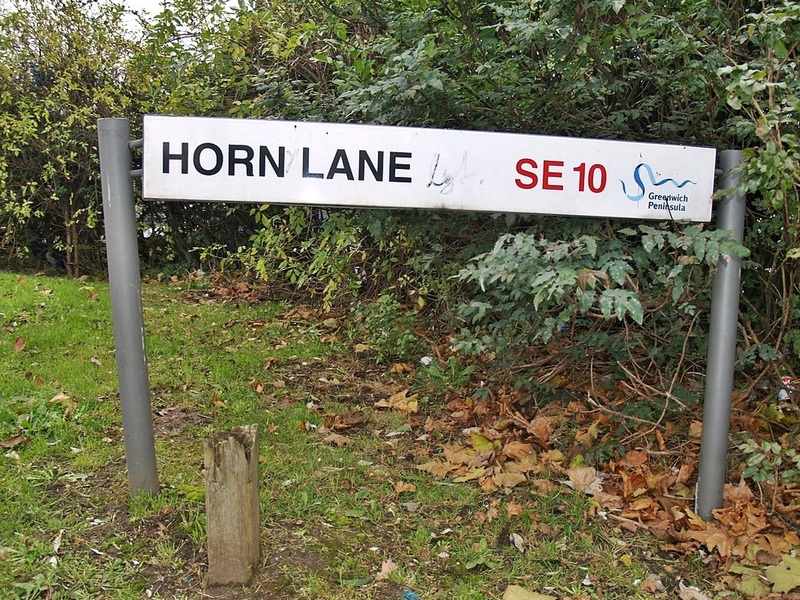 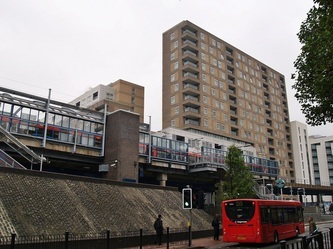 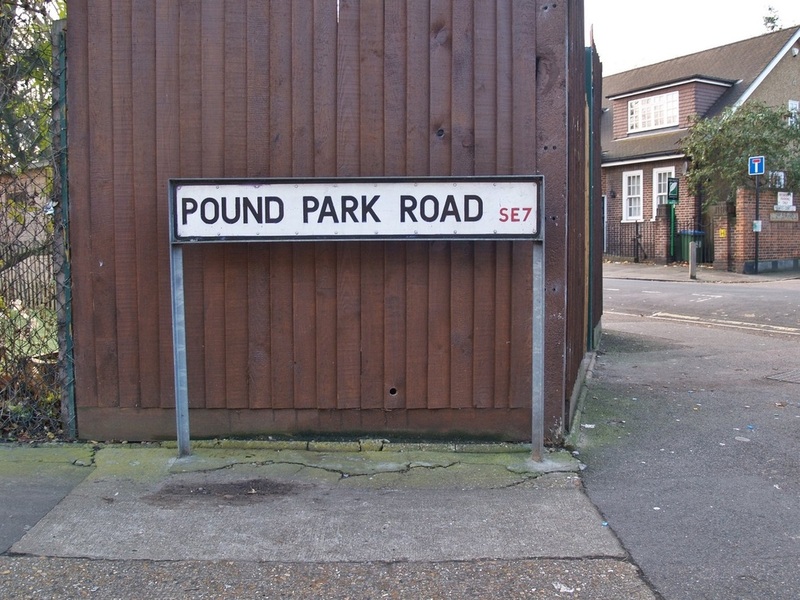 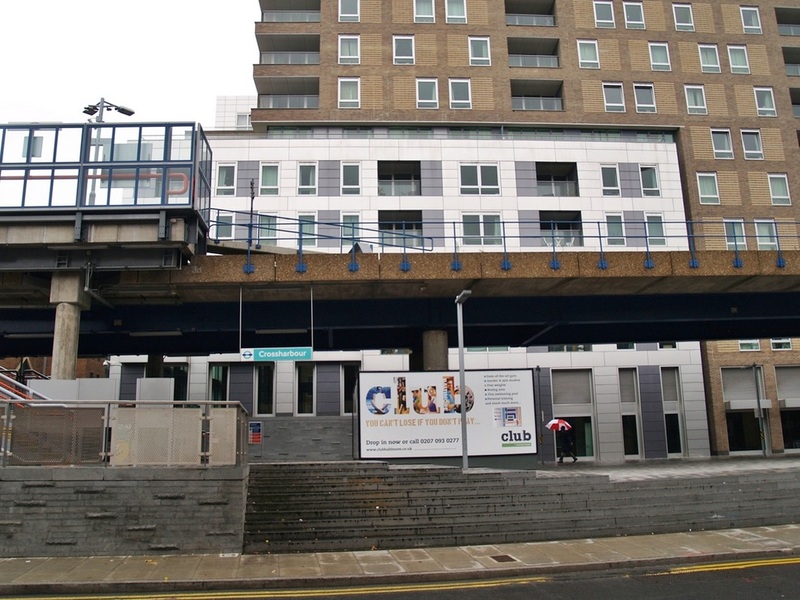 It was subsequently demolished and housing was built on the cleared site (near the site of the present-day Prince Regent DLR station) with some streets named after former speedway stars. 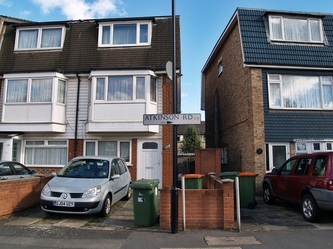 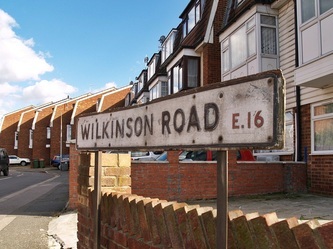 These are Atkinson Road (Arthur Atkinson), Croombs Road (Tommy Croombs), Young Road (Jack Young), Wilkinson Road (Arthur 'Bluey' Wilkinson), Lawson Close (Aub Lawson) and Hoskins Close (Johnnie Hoskins). 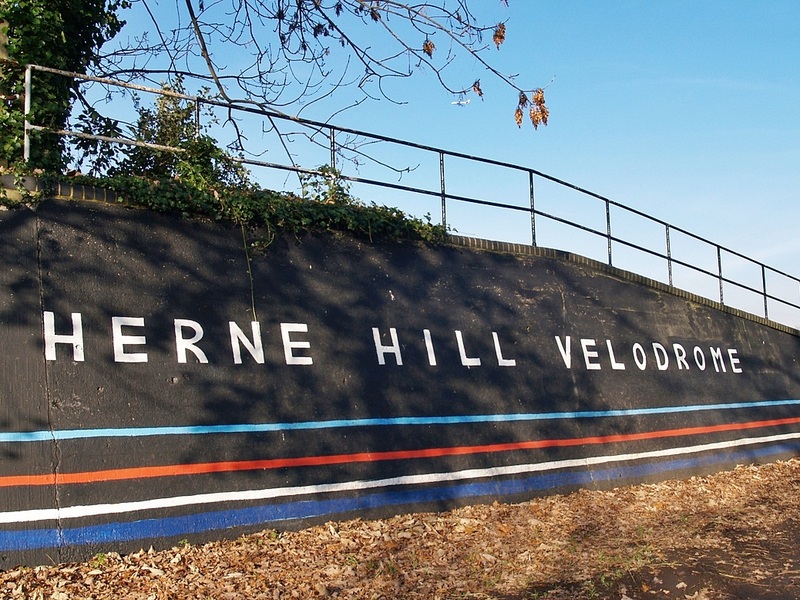 This SE London was opened in the early 1900s as an athletic stadium but was soon used for greyhound racing and also for speedway from 1934.The stadium was adjacent to The Den, the then home of Millwall F.C. 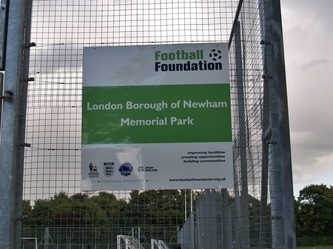 and was used as a training ground by the club when they did not have facilities of their own. This was the birthplace of oval track stock car racing in the UK and the first ever BriSCA Formula One Stock Car Racing took place at the New Cross Stadium, London on Good Friday 1954. 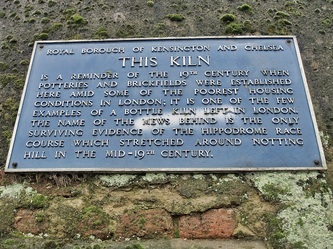 Racing continued here until 1956. Three meetings also took place in 1968 whilst Harringay Stadium was being revamped. 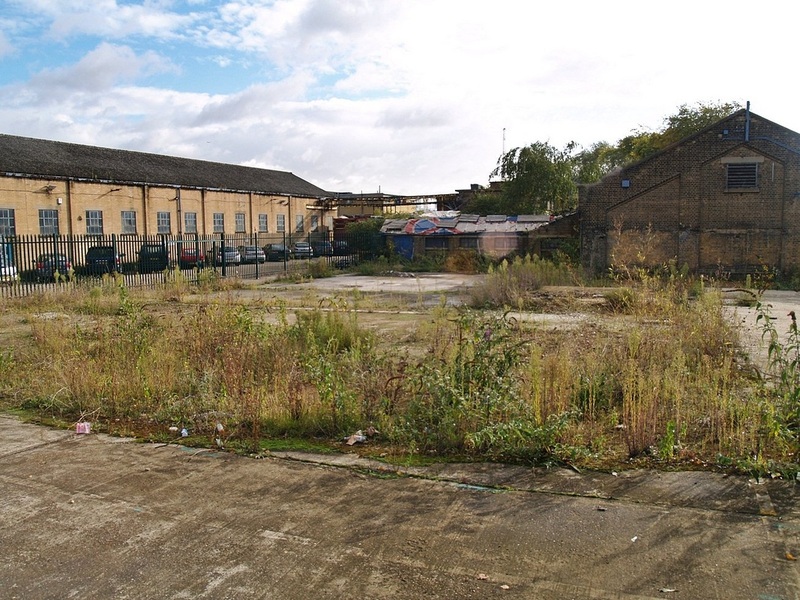 The stadium continued with Greyhound racing until it closed in 1969 & was left derelict for several years until it was demolished in 1975 as part of a plan to redevelop the football ground, although those plans fell through.Millwall F.C. 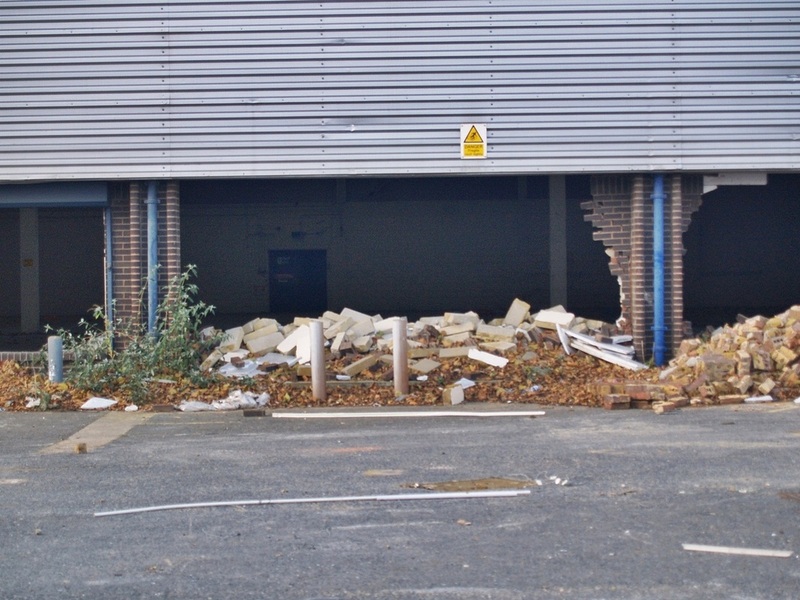 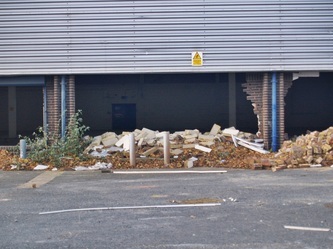 have since moved to a new site north of the stadium, with houses now occupying the location of their old ground (see pics of Millwall FC further up page) The stadium at time of demolition had a capacity of 26,000. 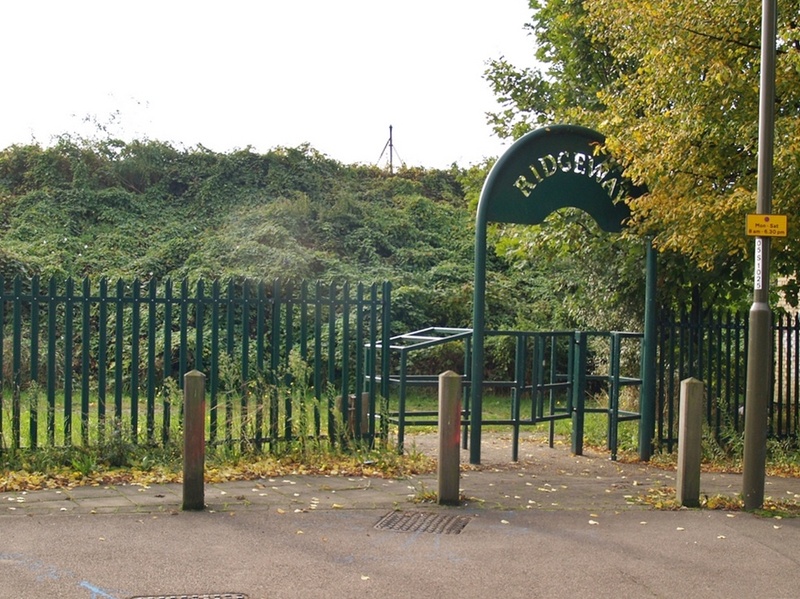 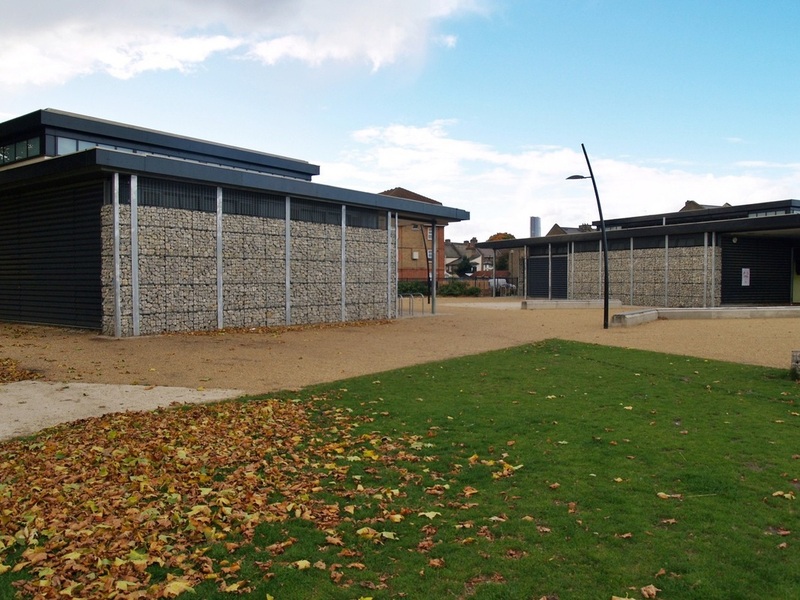 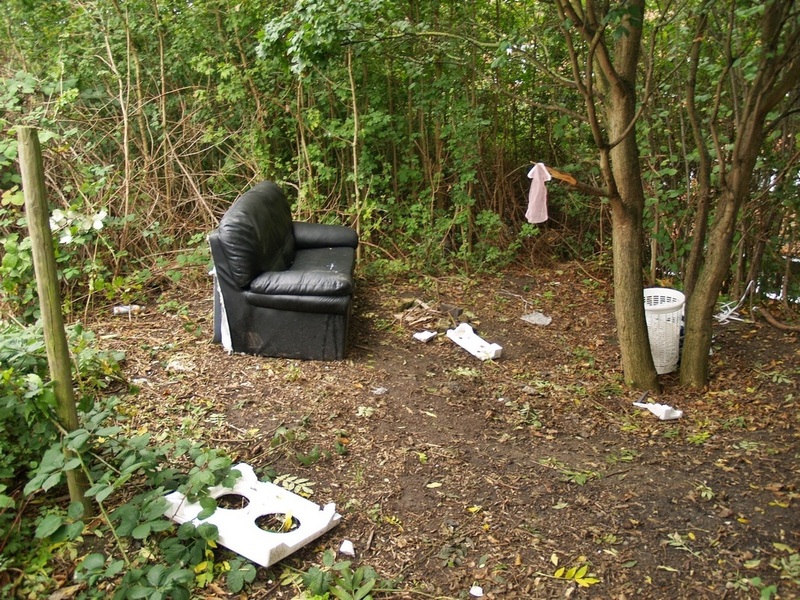 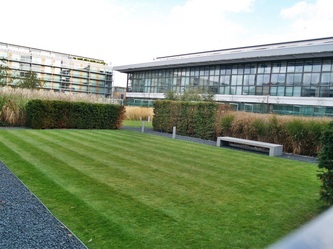 The site is now an open space called Bridge House Meadows although parts have recently been fenced off to the public. 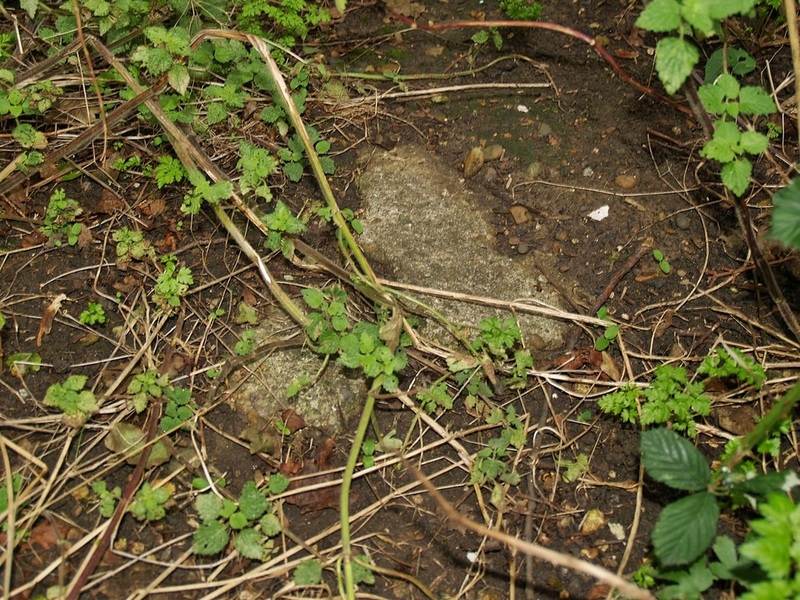 The bowl of the stadium is vaguely visible and lumps of concrete in the undergrowth are probably fragments of the old stands. 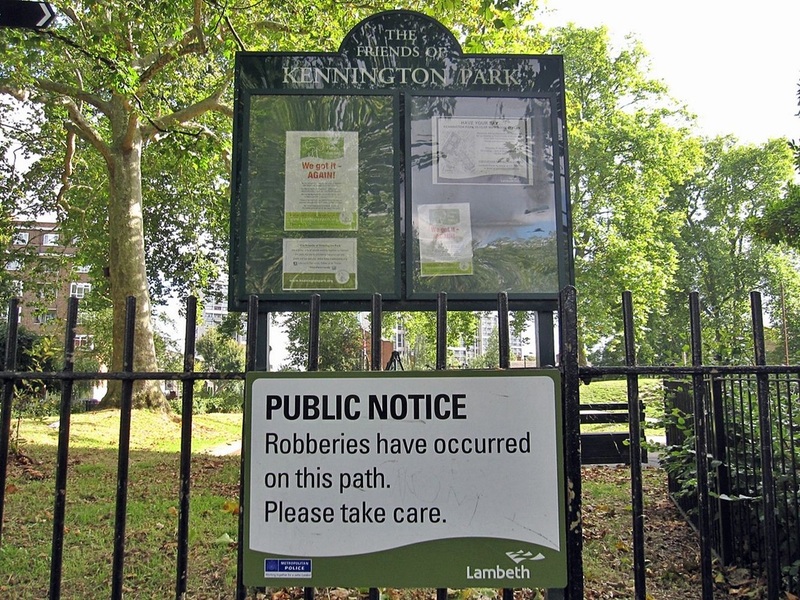 Kennington Common was a site of public executions until 1800 as well as being an area for public speaking - John Wesley was reputed to have attracted a crowd of 30,000 here). 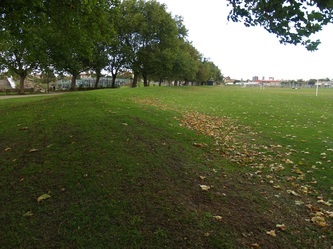 The River Effra ran above ground beside the common. In 1767, the common was flooded by a high tide coming up the river. 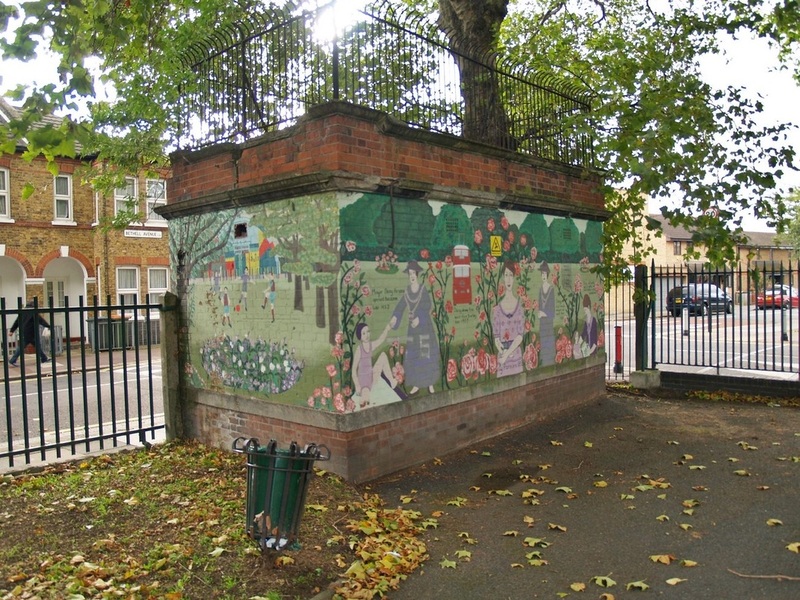 The common was also a popular sports venue hosting early football matches, cricket, bowling, boxing, a Victorian gym and a lido. 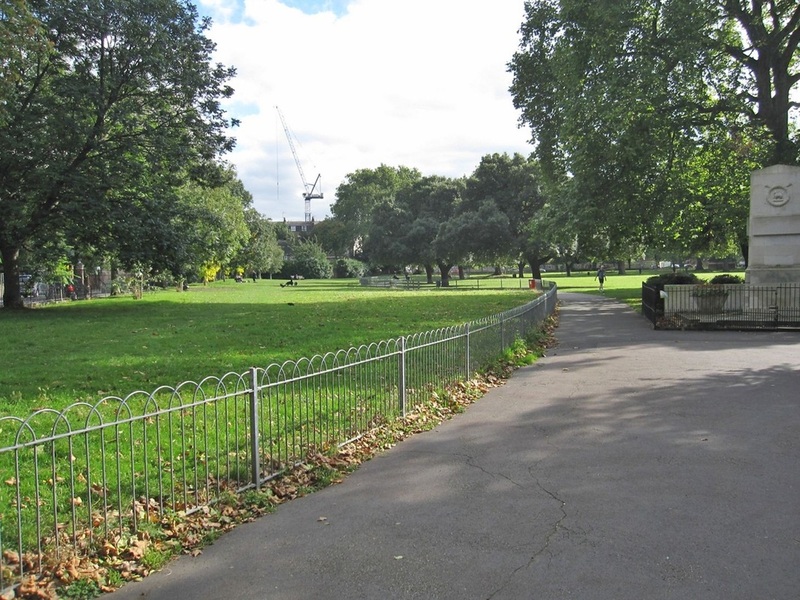 There is some history of boxing events on the common and it is recorded in 1792 that Mungo,a fighter breaks the jaw of his opponent, a carpenter, in a boxing match on the common. 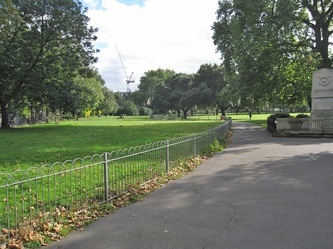 In 1854 the common was reopened as Kennington Park and unlike many of the other grounds in this section, at least some sport still carries on with tennis courts and cricket. 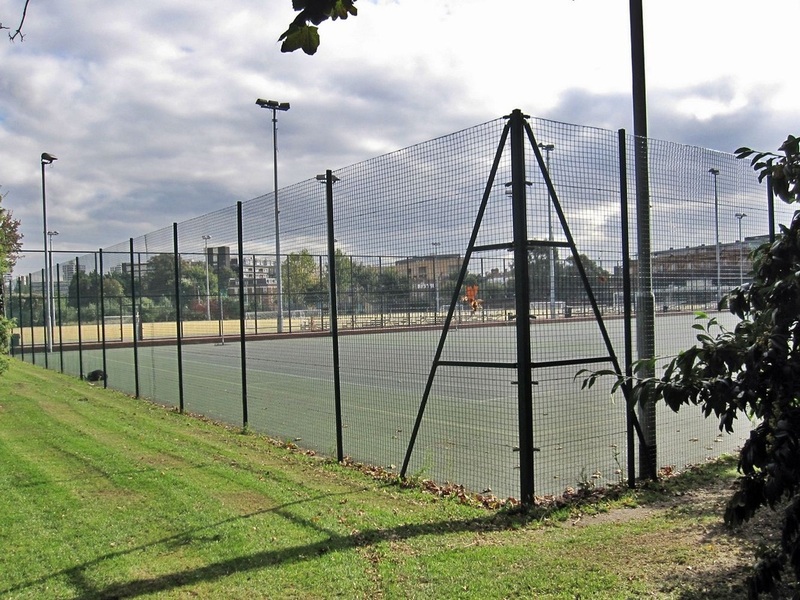 Kennington United CC is financially supported by Surrey CCC & receives coaching from professional players. In 1931 a lido opened in the park but this eventually closed in 1987, filled in and covered with tennis courts. 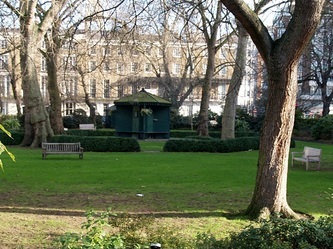 The park suffered a great wartime tragedy when in 1940 a public bomb shelter suffered a direct hit. 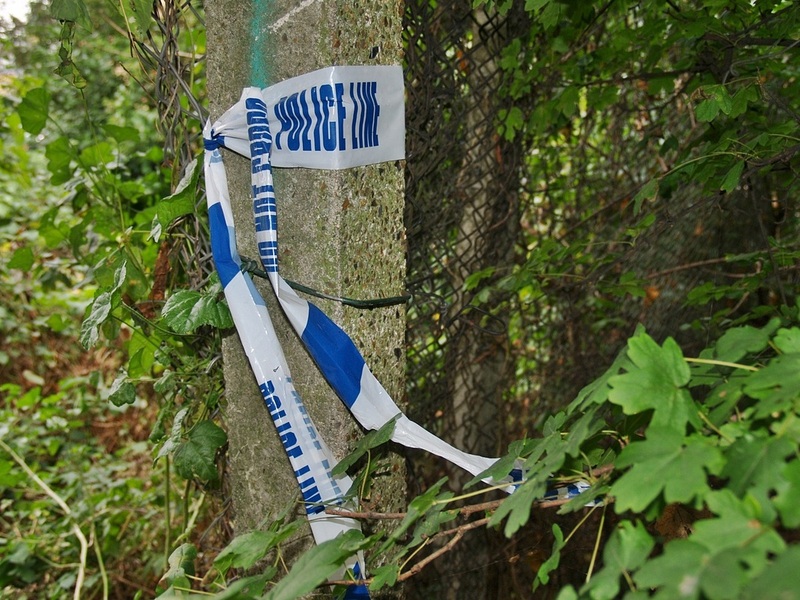 An estimated 104 people were killed but only 50 bodies could be identified by name. 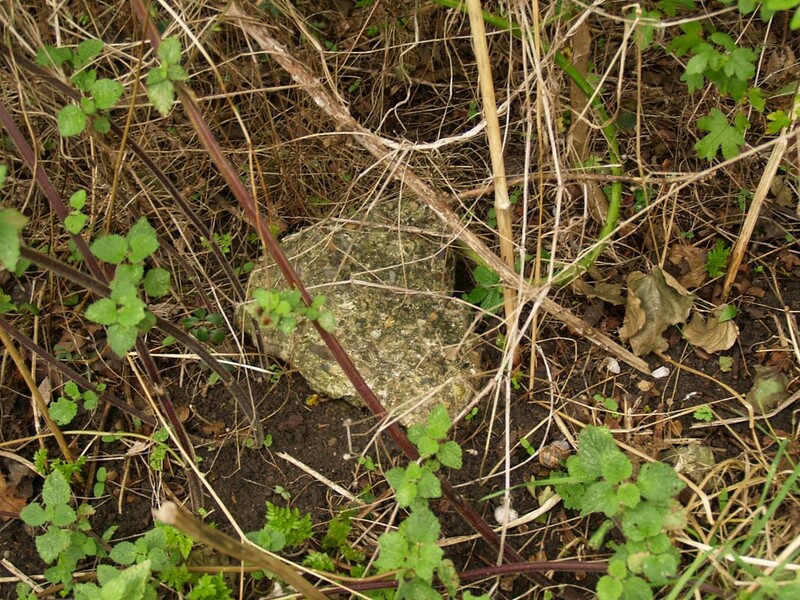 Due to treacherous wet ground conditions, with the shelter walls collapsing on rescuers, the remains of up to another 54 people were left in the ground, covered in lime, and the trenches were filled in. There is not much documentation to be found about the Charlton Stadium. 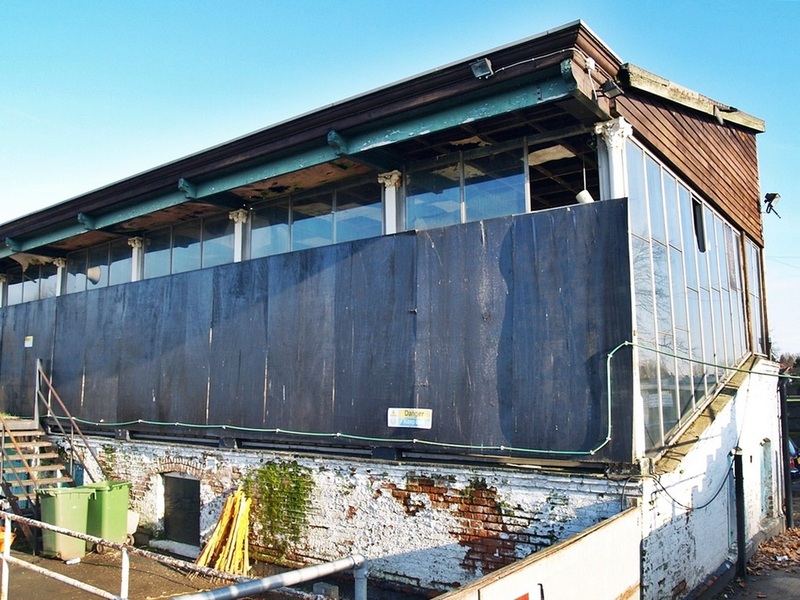 It was primarily used for greyhound racing although there are records of a boxing match also taking place there in 1934. 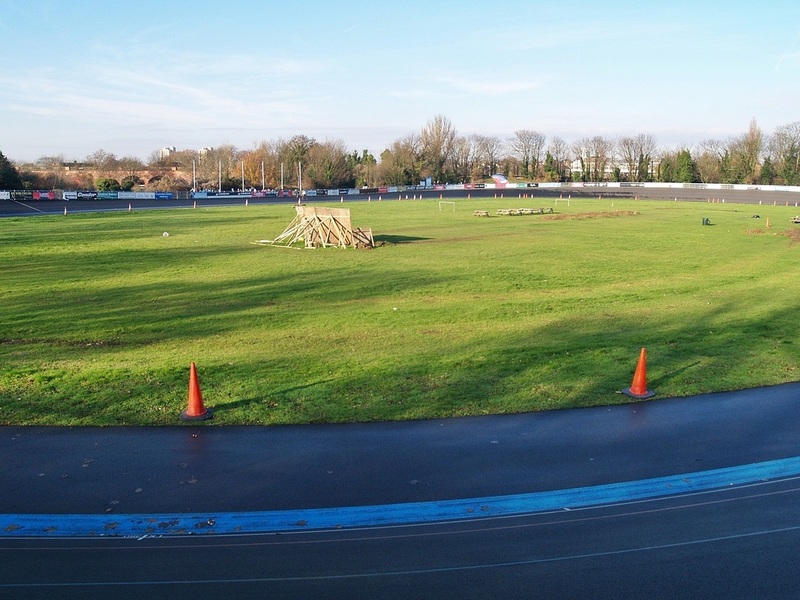 An application to host speedway was made in 1965 but nothing became of it. The stadium is believed to have closed around 1970. 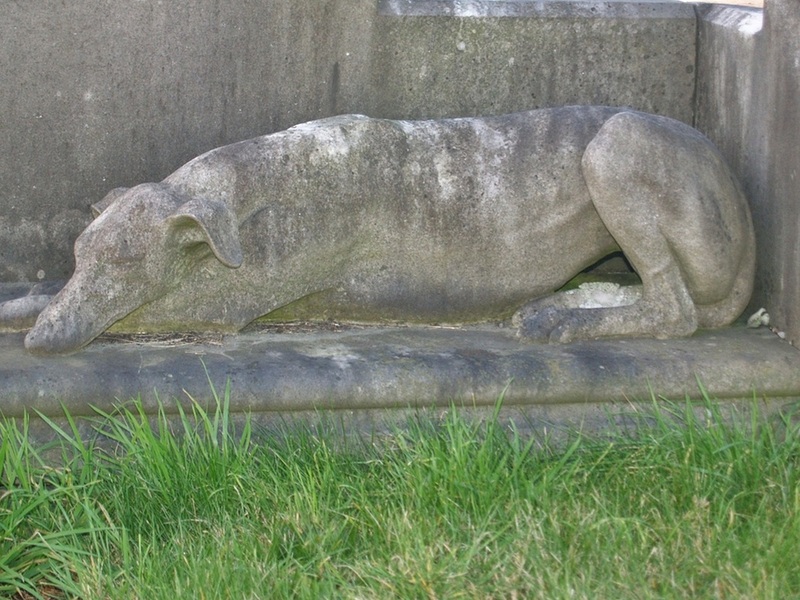 The founder of the greyhound track, Thomas Murphy, is buried in Charlton Cemetery - he's got a big memorial with two life-sized greyhounds. 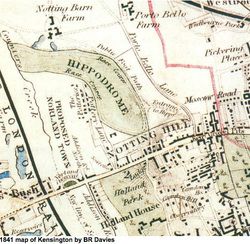 The Bartholomew 1957 Atlas of Greater London shows the stadium on Woolwich Road almost opposite Rathmore Rd roughly where a defunct retail park now stands to the west of Gallions Rd. 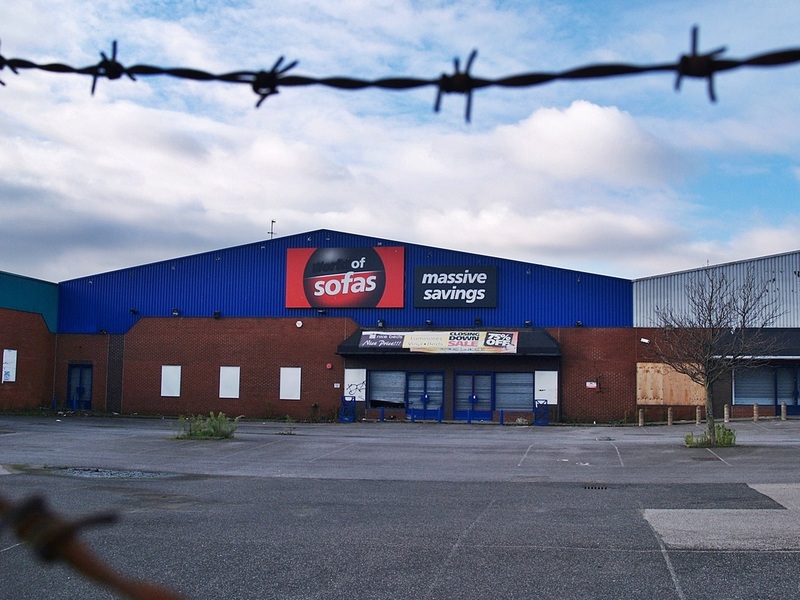 Some people say that the Mackro Cash & Carry is now on the site of the stadium but that would have been "next door" as Mackro is adjacent to Anchor & Hope Lane. 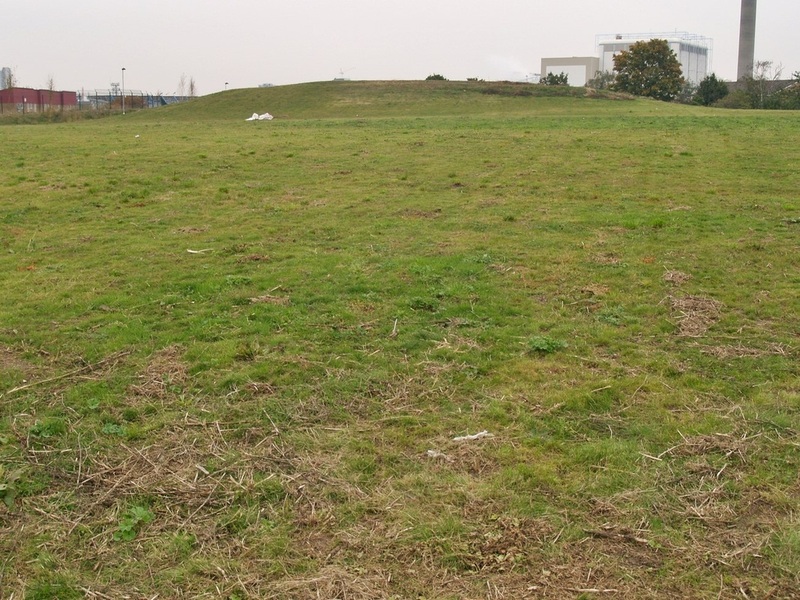 Unfortunately after a wander around the site there are no clues of the stadium's existence. Lord's Cricket Ground, generally known as Lord's, is a cricket venue in St John's Wood named after its founder, Thomas Lord an English professional cricketer who played first-class cricket from 1787 to 1802. 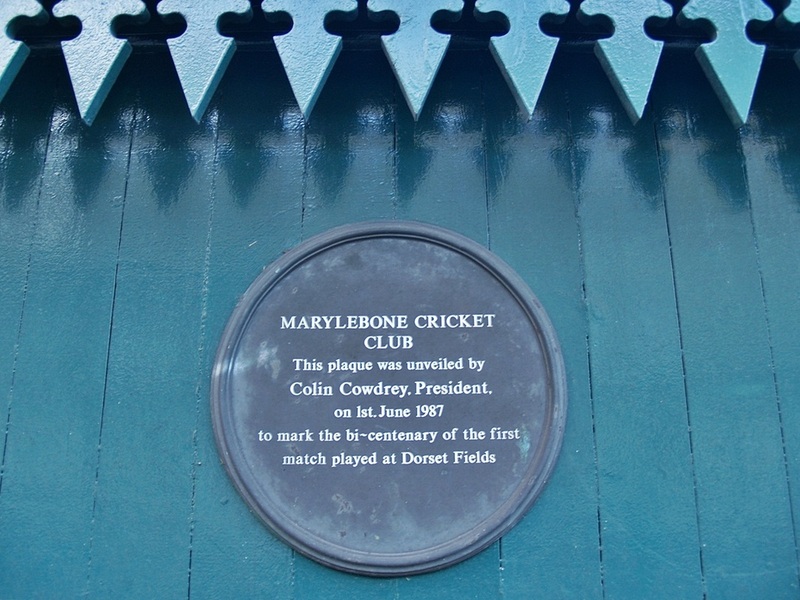 It is owned by Marylebone Cricket Club (MCC) and is the home of Middlesex County Cricket Club, the England and Wales Cricket Board (ECB) & the European Cricket Council (ECC). Lord's is widely referred to as the "home of cricket" and is home to the world's oldest sporting museum. 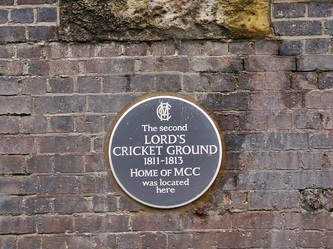 But the Lord's that we all know today is not on its original site - its currently the third of three grounds that Lord established between 1787 and 1814. 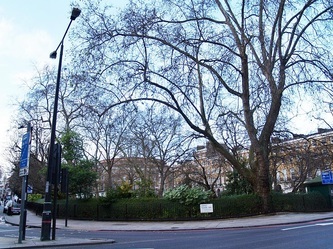 Lord's Old Ground, was where Dorset Square now stands. 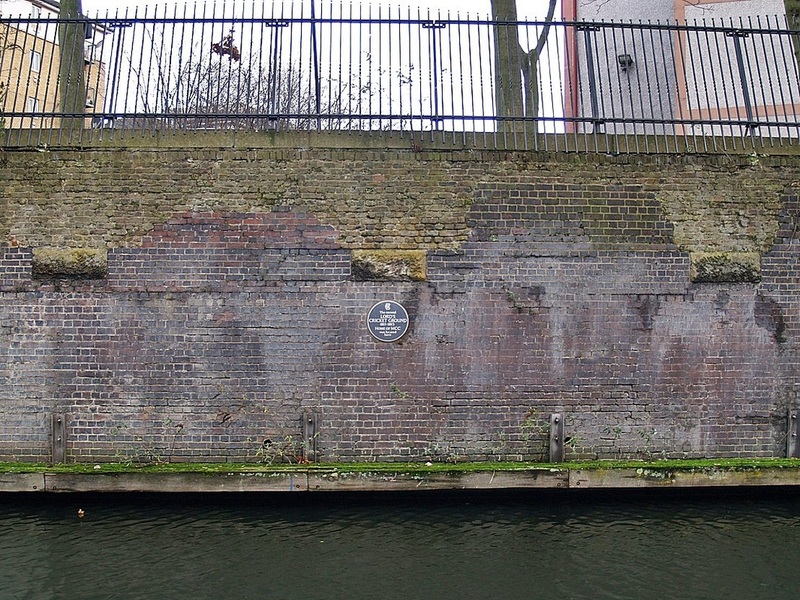 In 1786 Lord was approached the leading members of the White Conduit Club in Islington (more on this club to follow on Derelict London later). They wanted Lord to find a more private venue for their club and offered him a guarantee against any losses he might suffer. 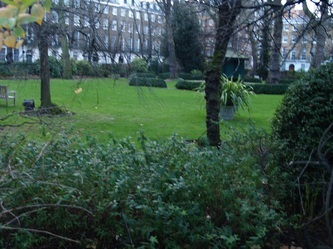 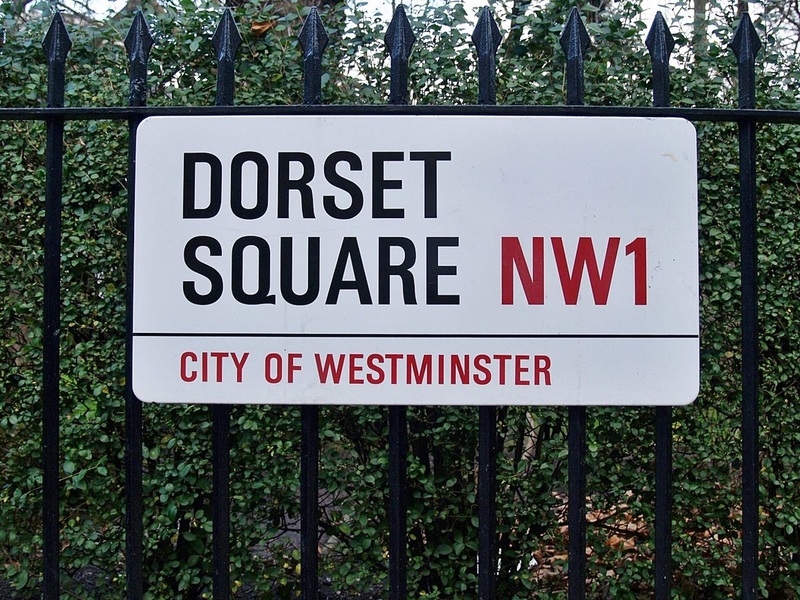 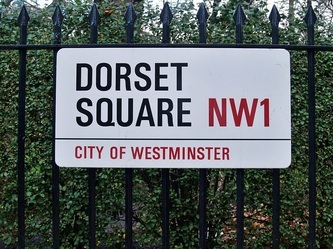 In May 1787, Lord acquired seven acres of land (around where Dorset Square now stands) and started his first ground. 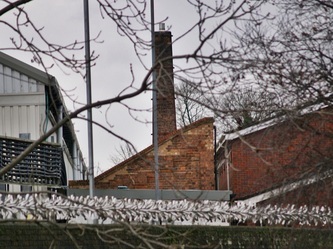 White Conduit relocated there and soon afterwards formed, or merged into, the new Marylebone Cricket Club. 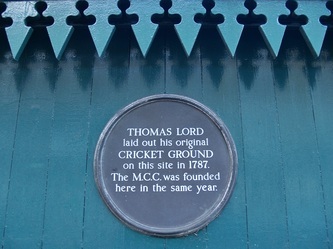 The first match known to have been played at Lord's Old Ground was White Conduit Club v Middlesex on Monday 21 May 1787. 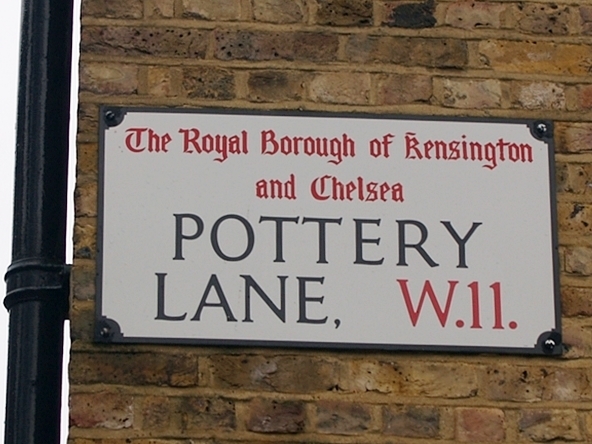 The lease on the ground ended in 1810 and a dispute about renewal of the lease caused Lord to relocate. 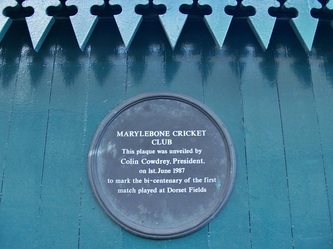 A commemorative plaque was unveiled in Dorset Square by Andrew Strauss on 9 May 2006. The ground at the Brick and Great Fields at North Bank, St John's Wood were built by 1809 when the first games were played there by St John's Wood Cricket Club. 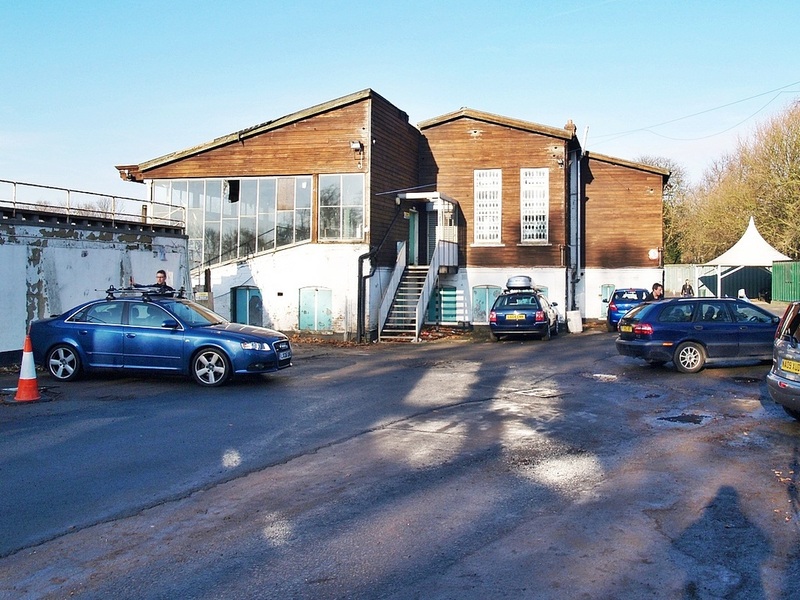 This was later merged into MCC who relocated to the Middle Ground in 1811 after leaving the Old Ground. 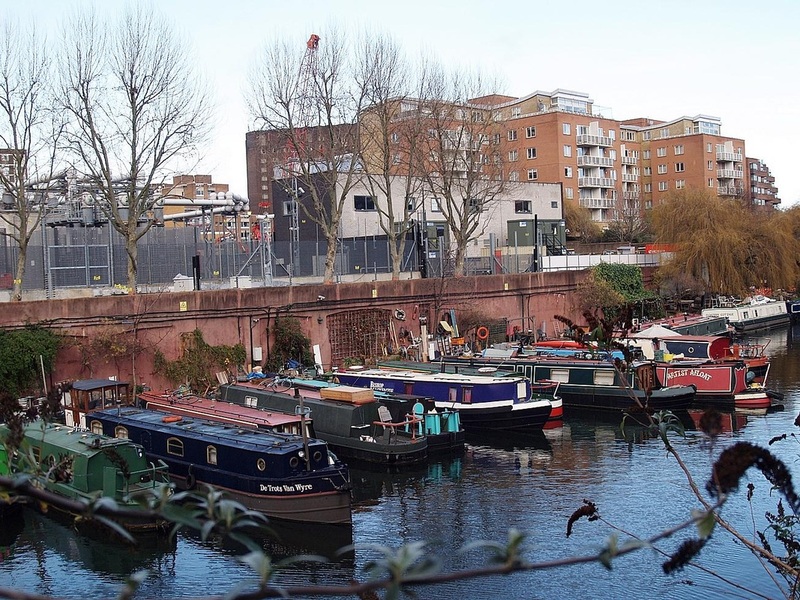 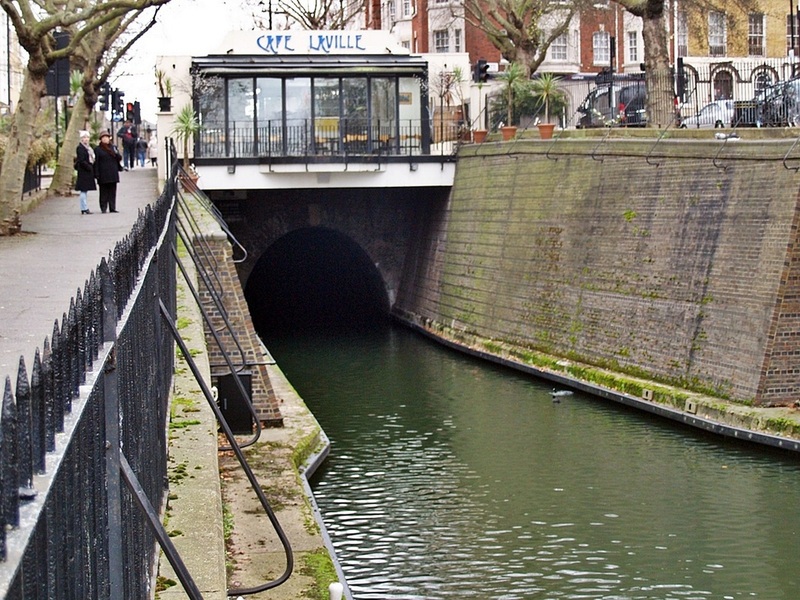 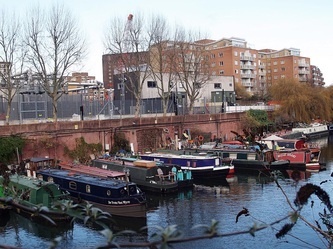 However, this was a short lived move as in 1813 Parliament requisitioned the land for the Regent's Canal, which was cut through the site. 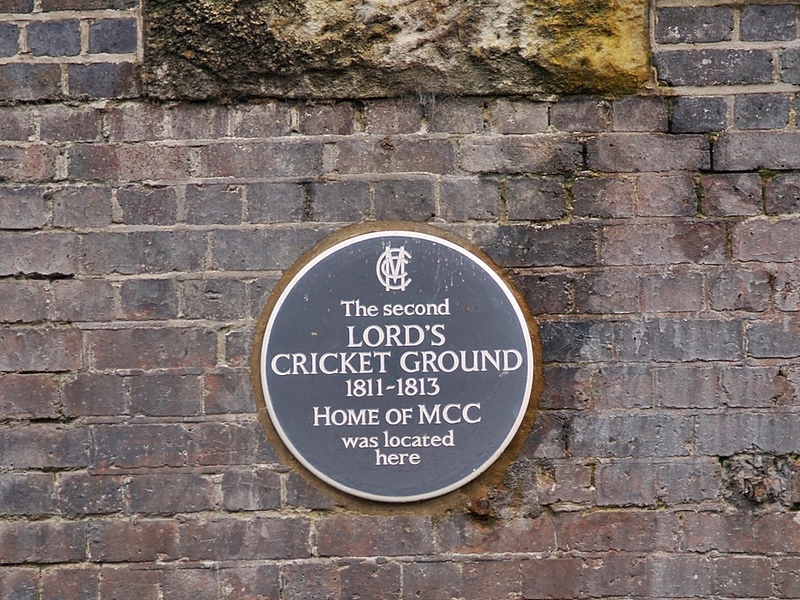 The present Lord's ground is about 230m north-west of the site of the Middle Ground. 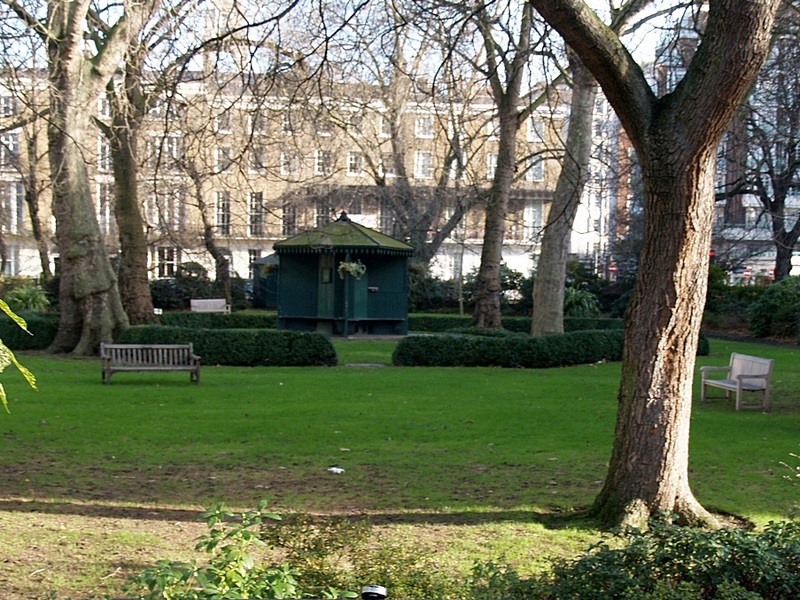 In 1814, the present Lord's Cricket Ground opened on the site of a former duckpond in St John's Wood. 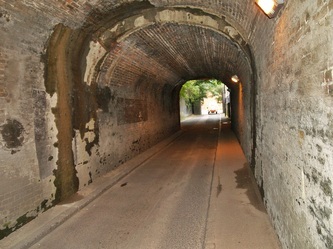 Earth excavated during the construction of the Maida Vale Tunnel was used in the building of the present ground. 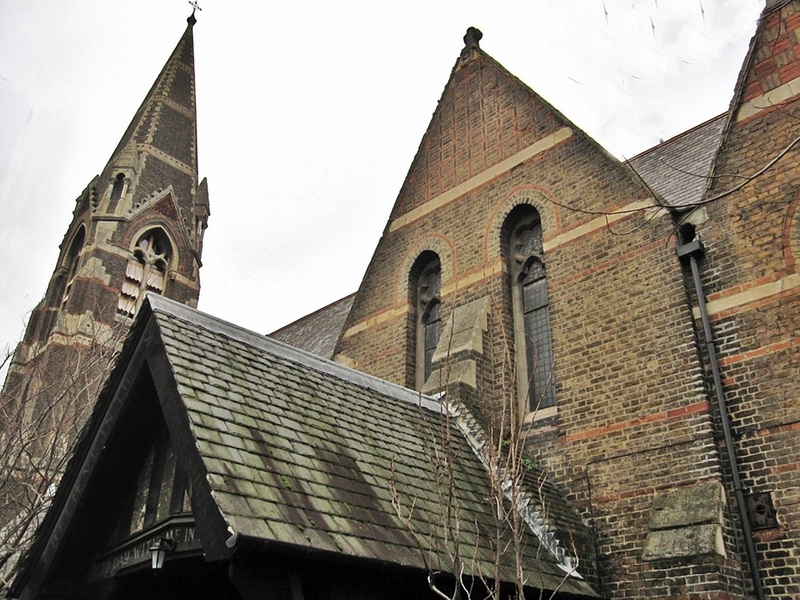 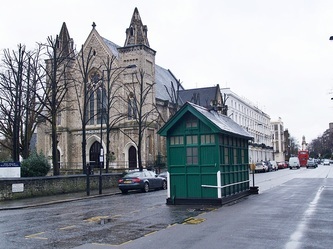 Fulham were founded in 1879 as Fulham St Andrew's Church Sunday School by the Reverend James Cardwell of St Andrews Church, Star Road in West Kensington. 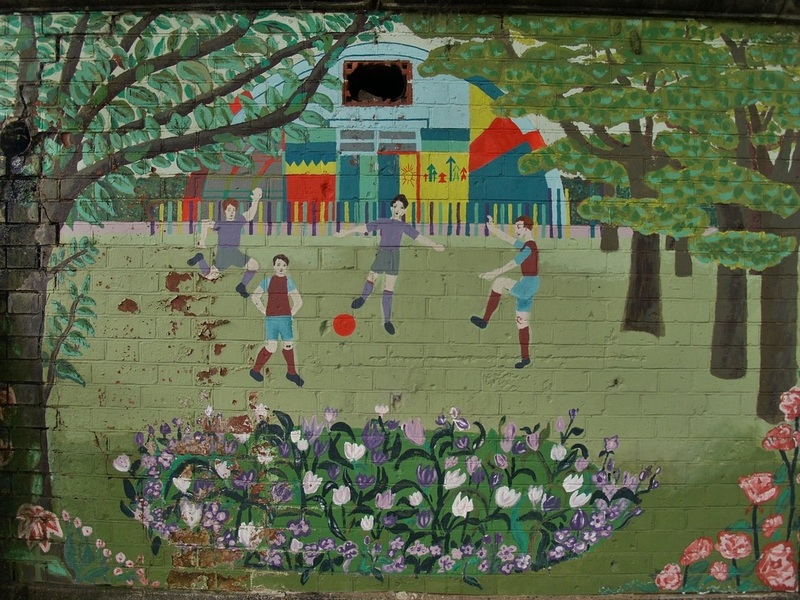 There was a cricket team and a football team. 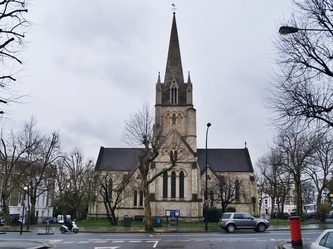 Cardwell never claimed any credit because, in his view, the success of the many parochial organisations was "mainly due to the ability & devotion of those that manage them". 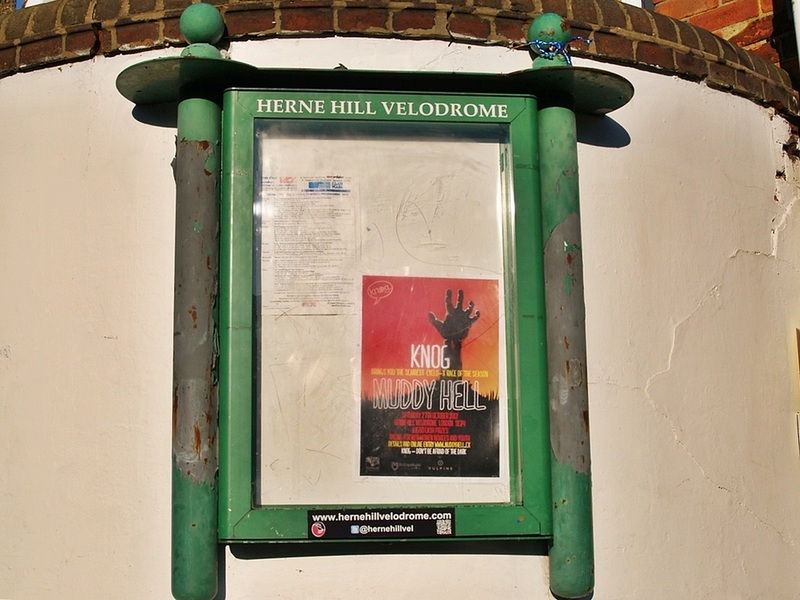 A window in the church records the tragic death of his 12 year old son. 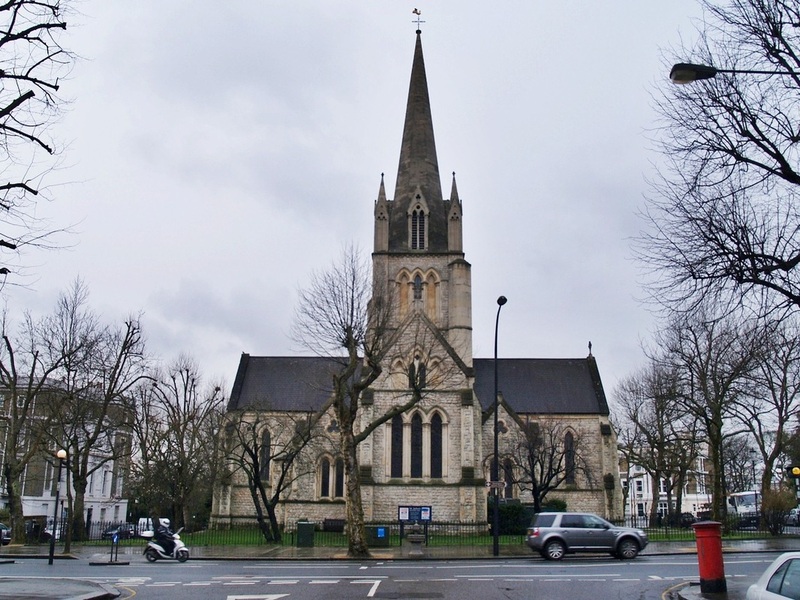 Wikipedia incorrectly states that there is a plaque at the Church commemorating the team's formation. However the present day vicar informs me that there are plans for a plaque to be erected in the future. Adjacent to Star Road School (now the prep school) and according to "Foundation History of the Fulham Football Club" by HD Shrimpton "one goal backed on to Star Road School". 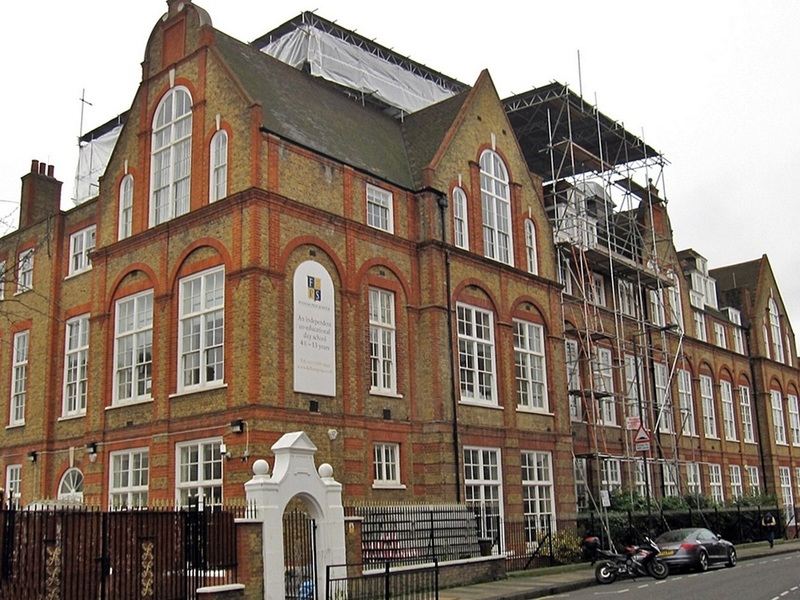 The school didn't actually open until 1880 but the building site became an unofficial (and presumably muddy) playground. 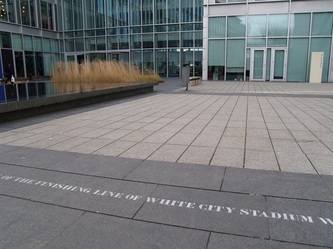 The boundary of the pitch was marked only by the lines of spectators. 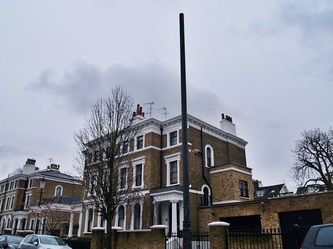 An old residence called Ranelagh House (adjacent to the present Putney Bridge Tube Station) had been bought for redevelopment and the tenants (The Ranelagh Club) had moved out so St Andrew's acquired a short term let on the land giving the club their first private ground. 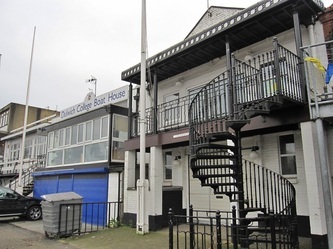 The dressing rooms were at the Eight Bells pub in Fulham High St whose landlord was a patron of the football club which was officially named Fulham St Andrew's after joining the West London Football Association. 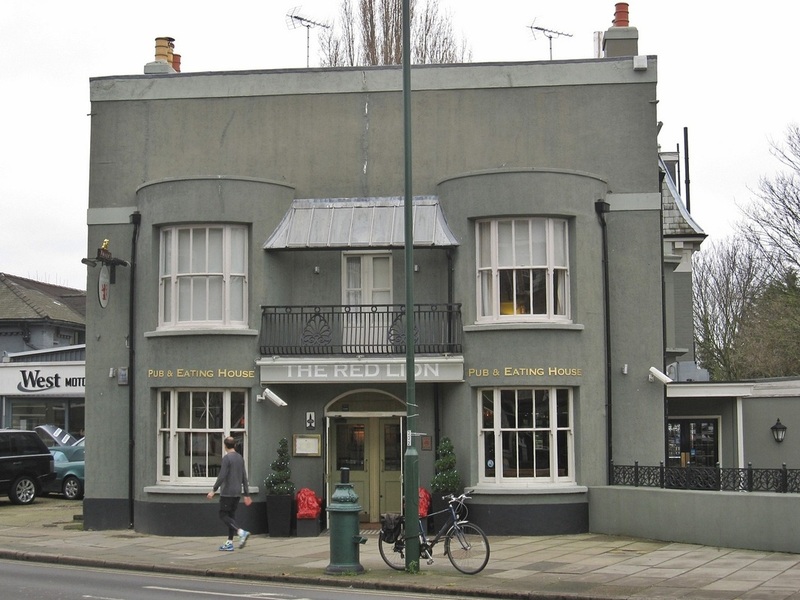 The pub became the team's headquarters & provided refreshments after each home match. 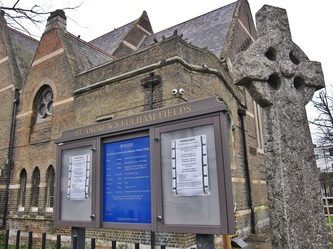 In Morgan Phillip's book "From St Andrew's to Craven Cottage" is says that Fulham St Andrew's FC unsettled opponents by their tactic of playing 6 forwards and 5 defenders. 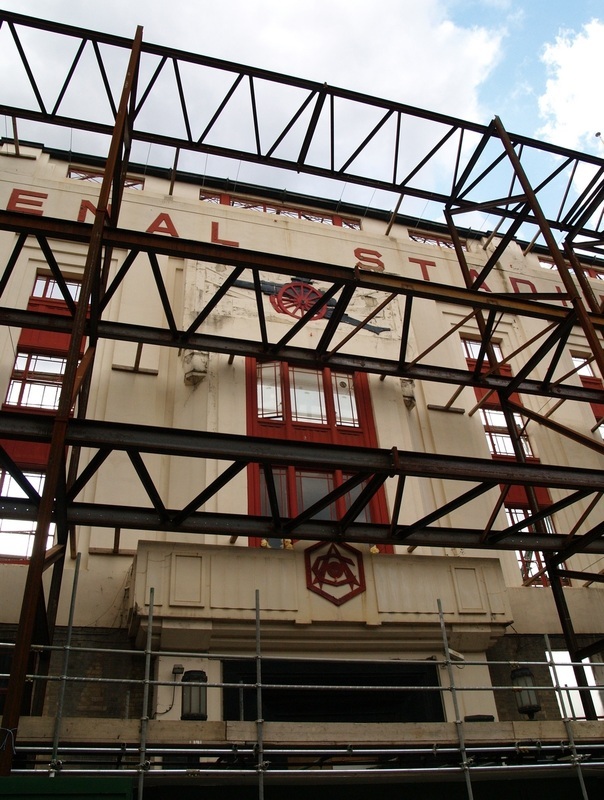 Big local rivals in those days were Stanley FC. 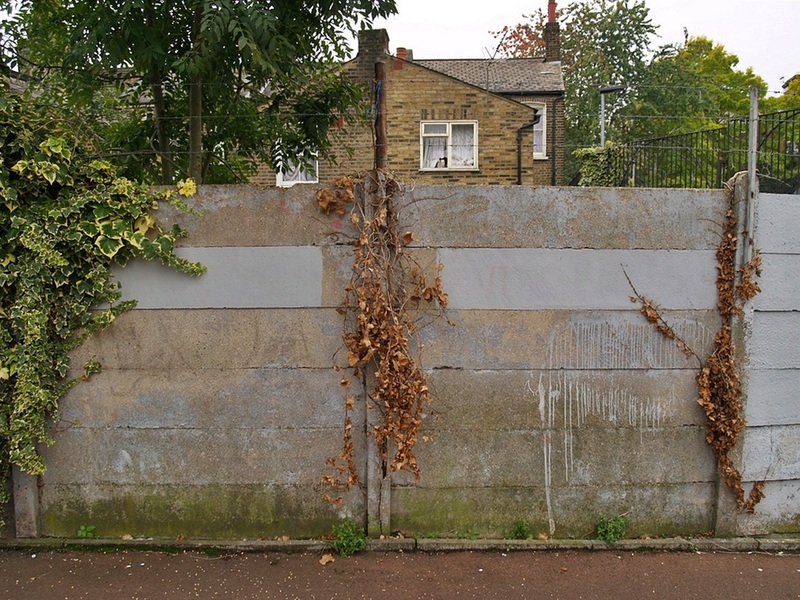 It is recorded that in 1887 there was a match against Millwall (then Millwall Athletic) who turned up a man short & the match was abandoned in the 2nd half after the match ball & 2 replacements all burst. 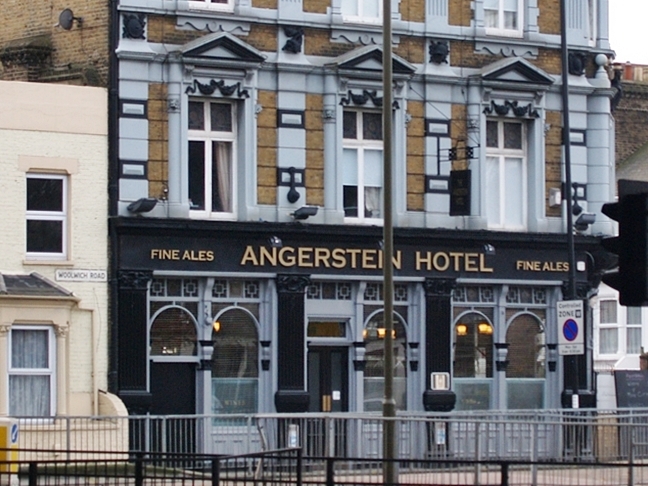 These days the pub is popular with "away" fans and the area where the ground was situated is now housing. 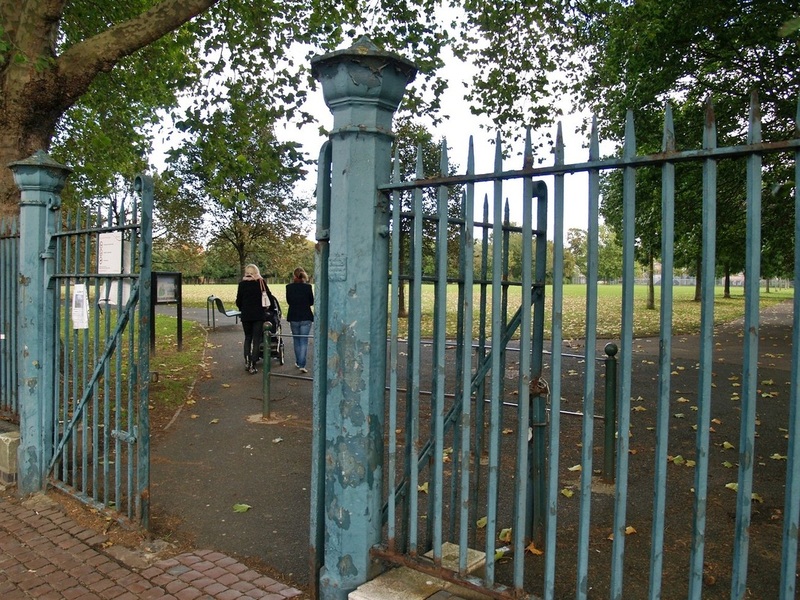 After the Ranelagh Ground became unavailable the club moved south of the river to Barnes.It was here that wooden crossbars were used for the goals for the first time by the club. 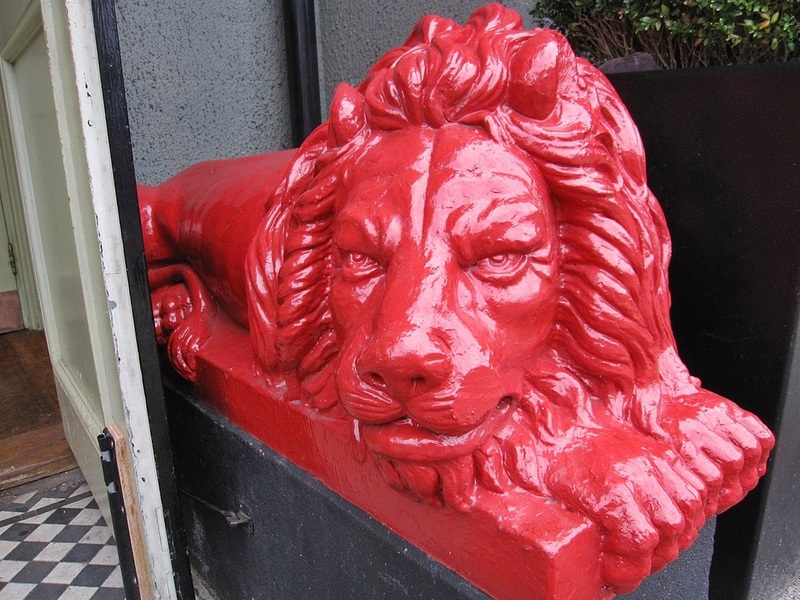 The Red Lion public house provided the dressing room facilities. 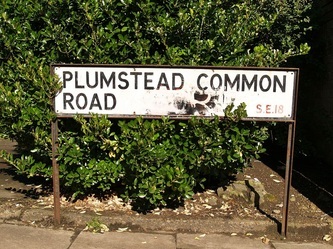 Fulham moved there in 1889 according to Shrimpton but Phillips suggested that it was later and the team played at Purser's Cross, Fulham (1889-90) and then Eelbrook Common for a while before the Half Moon Ground. 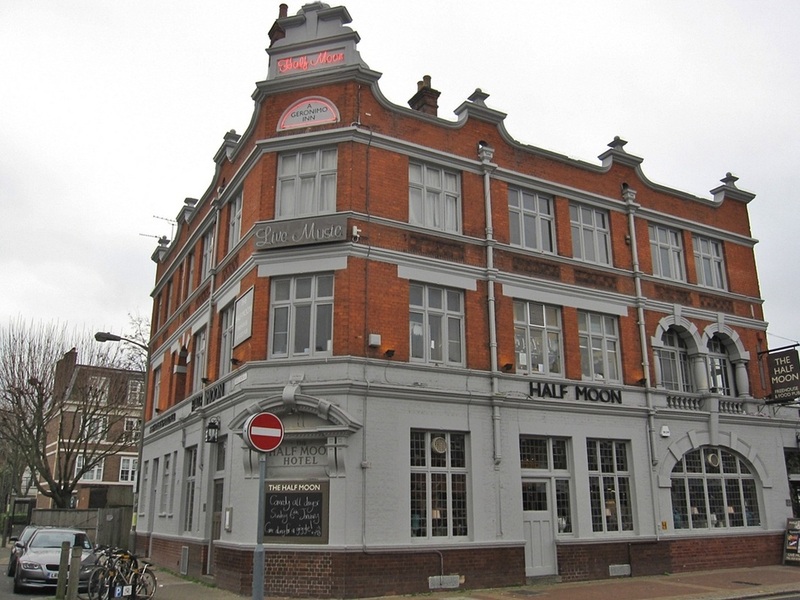 If so, then the Half Moon would have been the 7th ground. 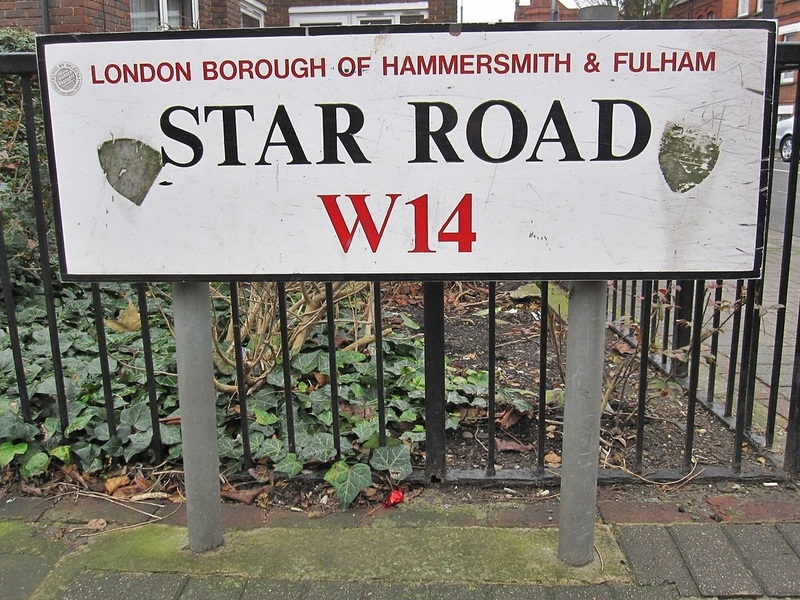 It was here that Fulham began charging admission fees for the first time. 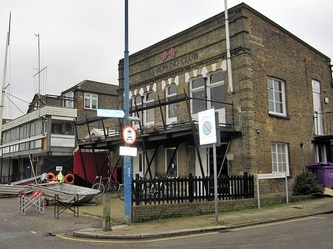 Teddy Fox, Fulham FC fan, local sportsman and landlord of the Half Moon pub in Putney was instrumental in the team's move to the Half Moon Ground almost opposite his pub and behind the boathouses on the bank of the Thames. 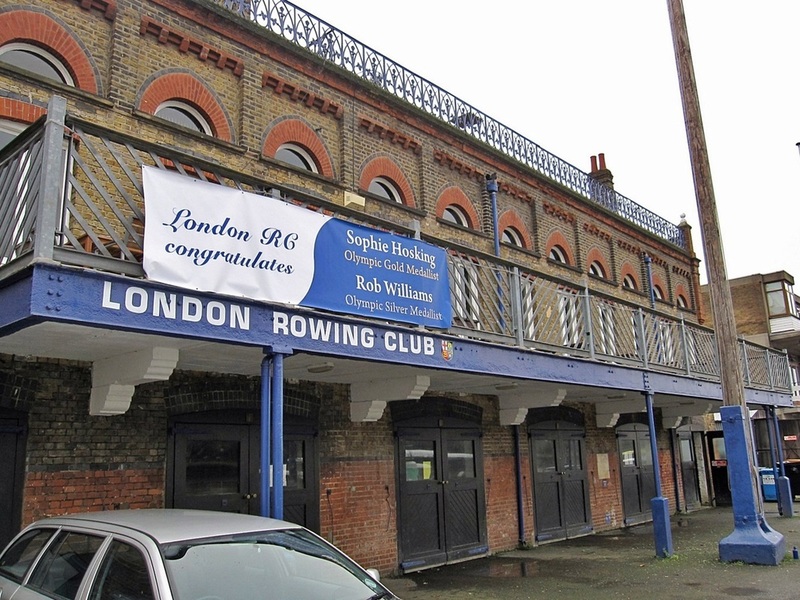 This was also home to Wasps Rugby Club at the same time. 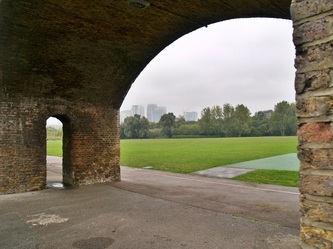 On Stanfords 1878 map of London it is called the Half Moon Cricket Ground. 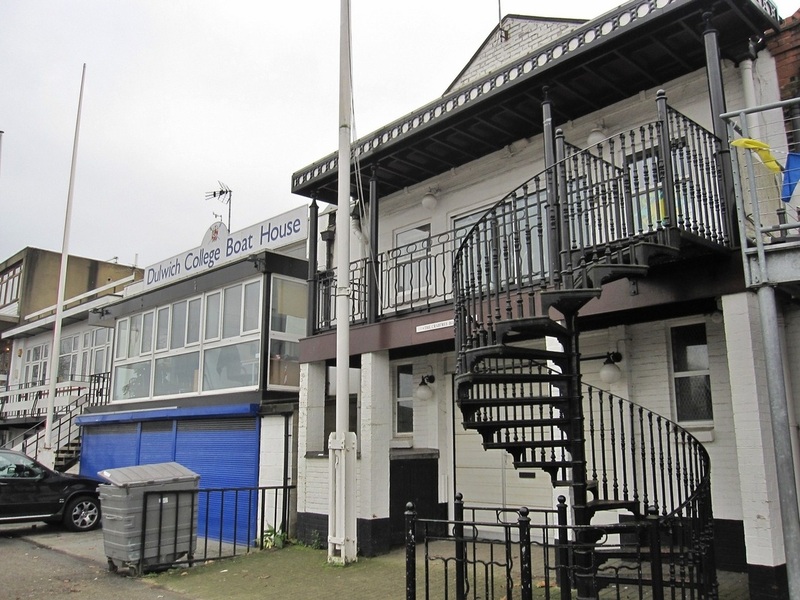 When the Half Moon Ground became unavailable the club moved back across the Thames to Craven Cottage in 1896. 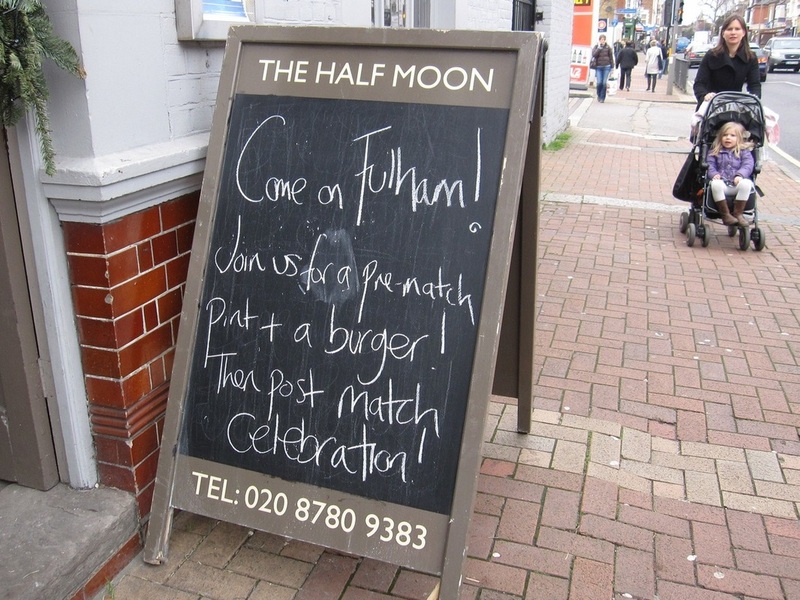 Between playing at the Half Moon & the Cottage, Fulham may have played for a couple of months at a ground in West Brompton. 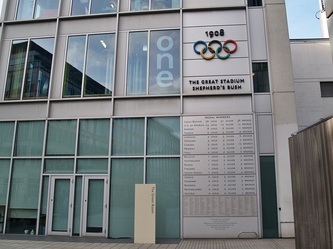 White City Stadium was the first Olympic Stadium in the UK - built for the 1908 Summer Olympics and noted for hosting the finish of the first modern distance marathon. 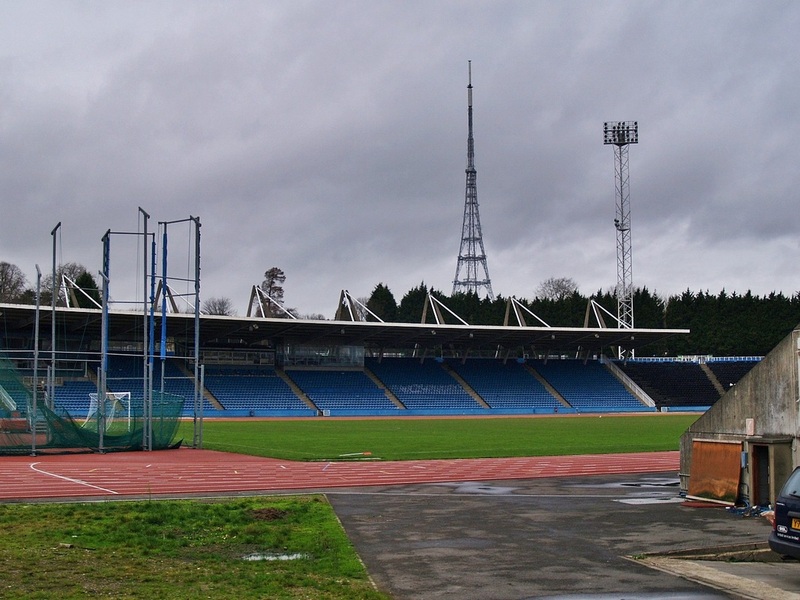 It also hosted greyhound racing, speedway and a match of the 1966 World Cup, before the stadium was demolished in 1985. Its hard to walk through the site these days and imagine the stadium that once graced this site. 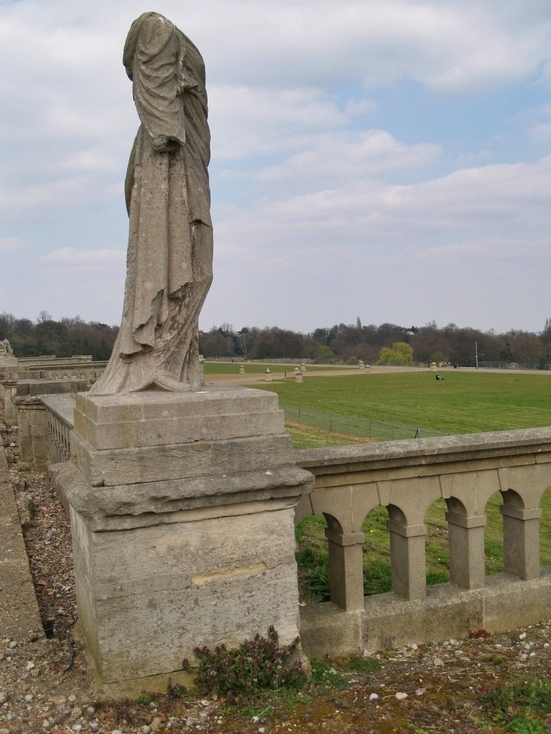 Completed in 10 months, at a cost of £60,000, by George Wimpey, this stadium with a seating capacity of 68,000 was opened by King Edward VII on 27 April 1908. 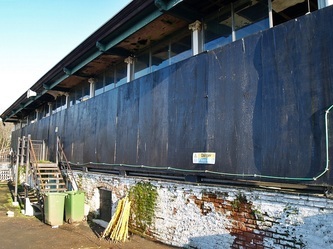 The Greyhound Racing Association took over the stadium and in 1927 and until its closure it hosted weekly greyhound meetings and was considered the top greyhound track in Britain. 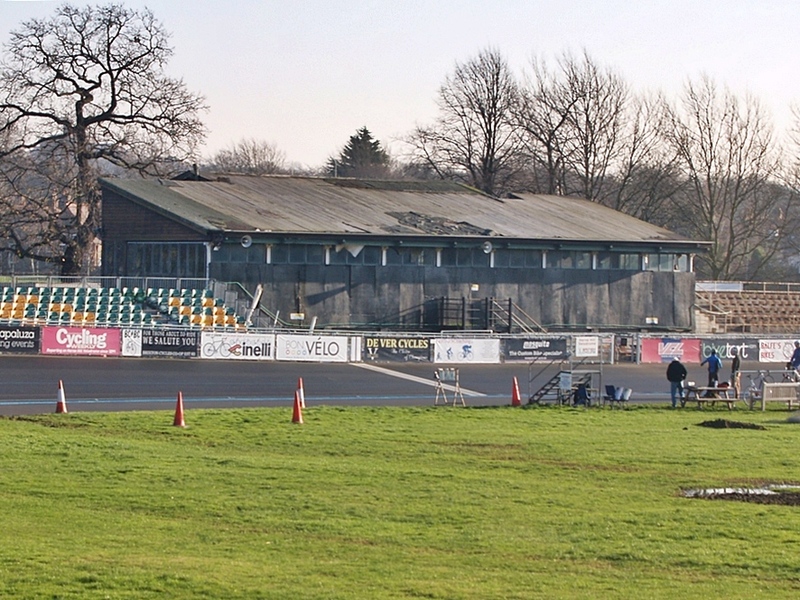 It hosted the sport's premier event, the English Greyhound Derby, until 1984. 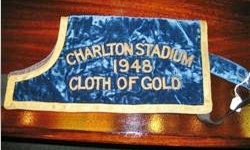 Just before and after the Second World War attendances were huge, a record 92,000 spectators attended the 1939 Derby final. The stadium also hosted regular speedway meetings, Amateur Athletic Association Championships & major boxing events. Also between 1931-1933 and 1962-1963, Queens Park Rangers F.C. 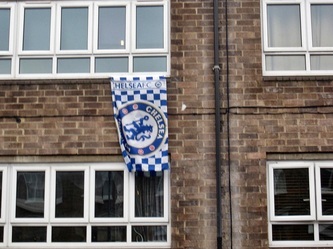 had two spells playing home games at the stadium. 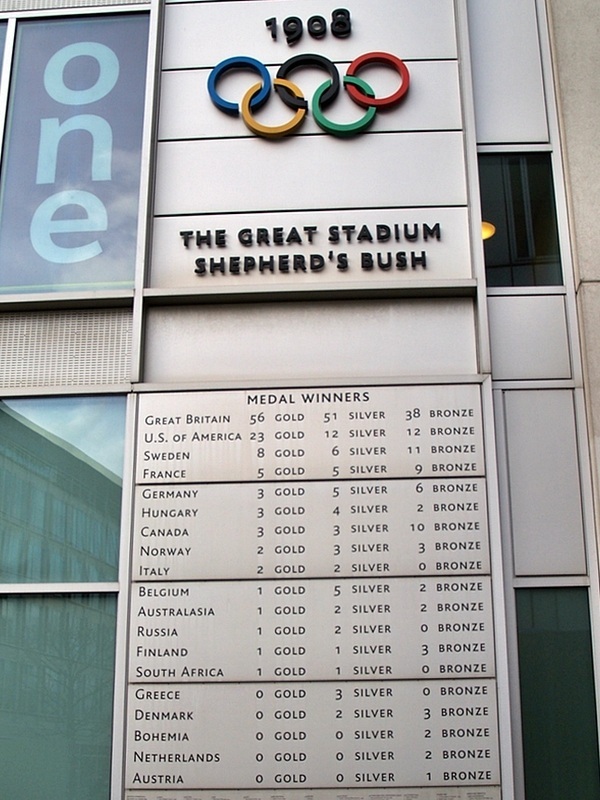 In 1966, the refusal of Wembley Stadium's owner to cancel regular greyhound racing meant the match between Uruguay and France in the 1966 FIFA World Cup was played at White City. The White City Stadium features in the 1950 film The Blue Lamp. 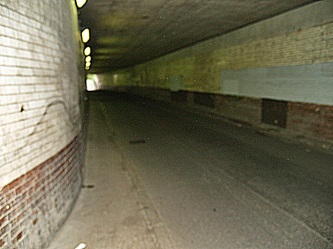 It also appears in an episode of 1960s television series Man in a Suitcase, and was used in the 1973 film Steptoe and Son Ride Again. A small section of the video for The Human League single "Life On Your Own" were shot in the stadium in 1984 just a few months before its demolition. 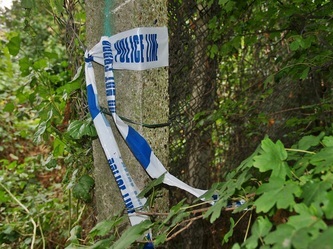 At a David Cassidy show in 1974, 650 were injured in a crush at the front of the stage.Thirty were taken to hospital, and a 14 year old girl died from injuries. 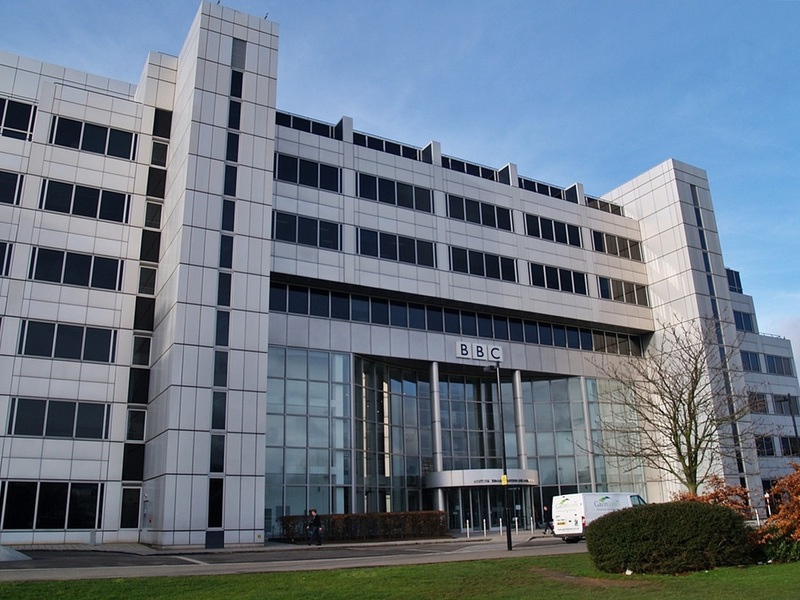 The stadium was demolished in 1985 and the site is now occupied by BBC White City. 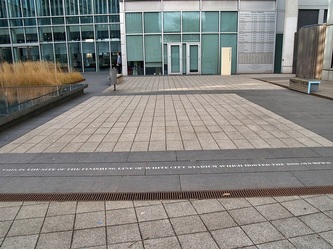 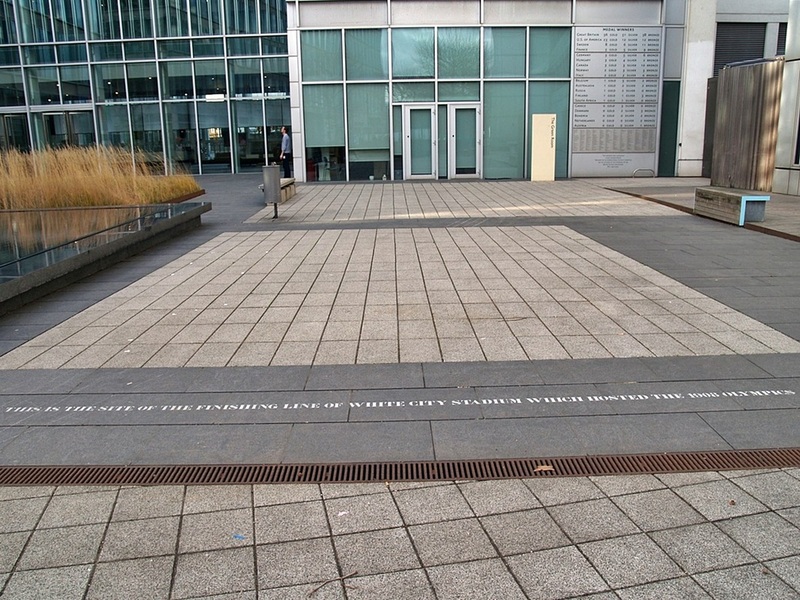 Parts of the original olympic swimming pool were discovered when the foundations were laid for this BBC "media village" he position of the finish line for the marathon in the 1908 Summer Olympics is commemorated by a marker in the plaza that now stands there. 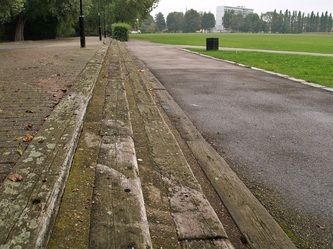 The distance of the modern marathon was fixed at these Games and calculated from the start of the race at Windsor Castle to a point in front of the royal box. 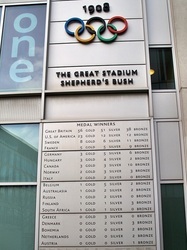 The medal table for the 1908 Summer Olympics is also listed on a nearby wall. 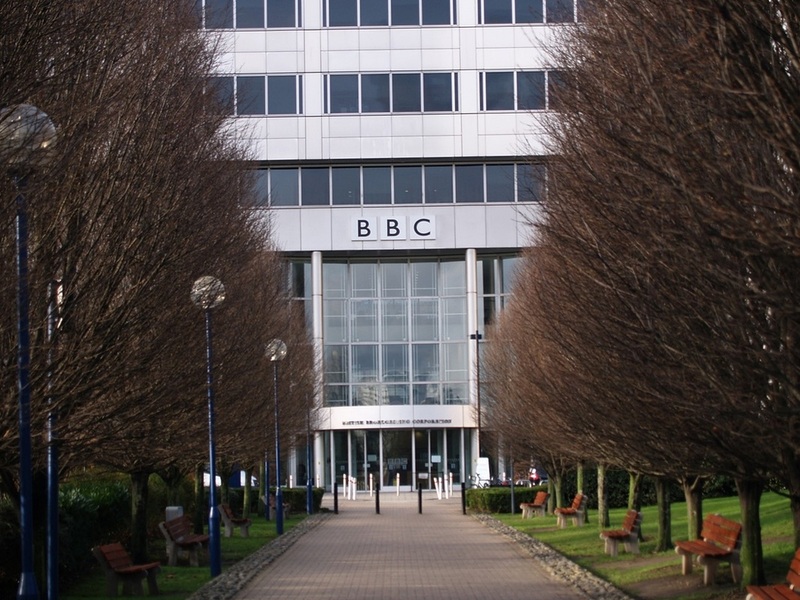 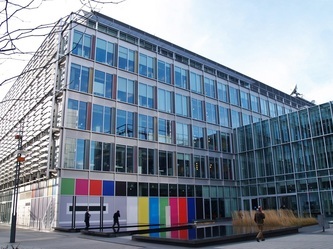 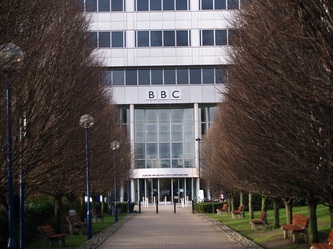 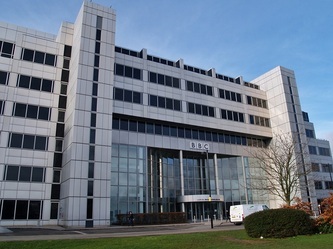 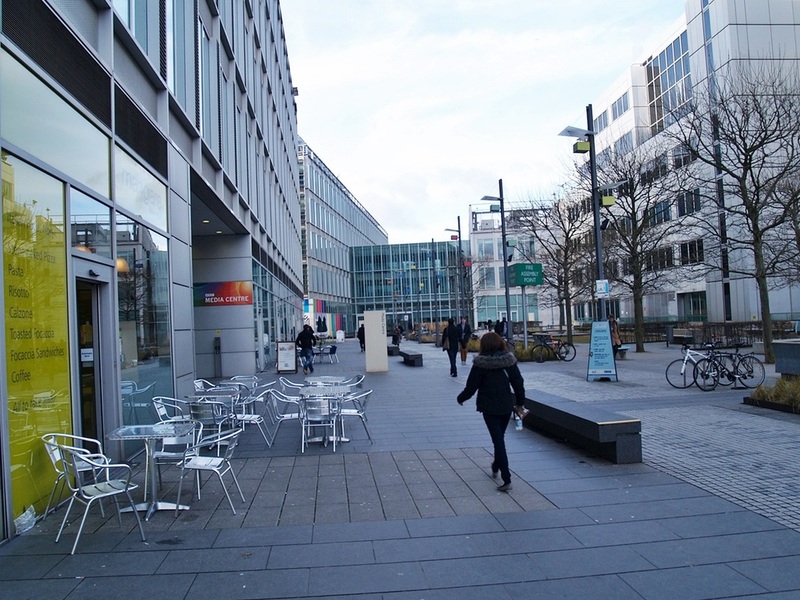 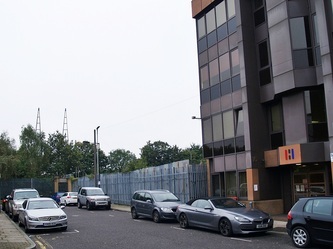 Just to avoid confusion - these BBC studios/offices/media centre are separate to the BBC Television Centre at White City (which is just down the road and closed early in 2013 amongst much publicity). 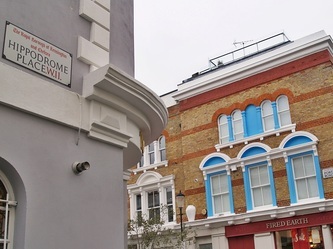 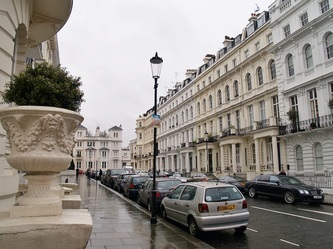 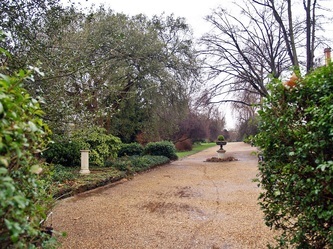 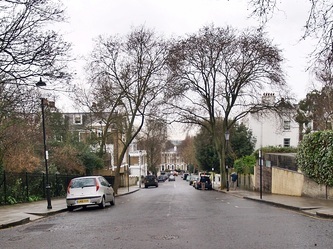 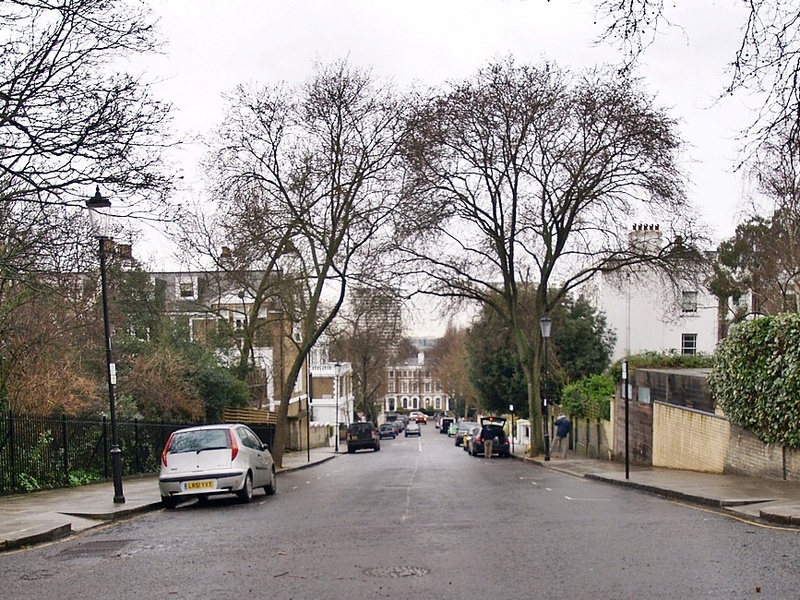 Whyte leased nearly 200 acres from the owner of the Ladbroke Estate, and proceeded to enclose "the slopes of Notting Hill and the meadows west of Westbourne Grove" with a 7-foot high wooden paling. 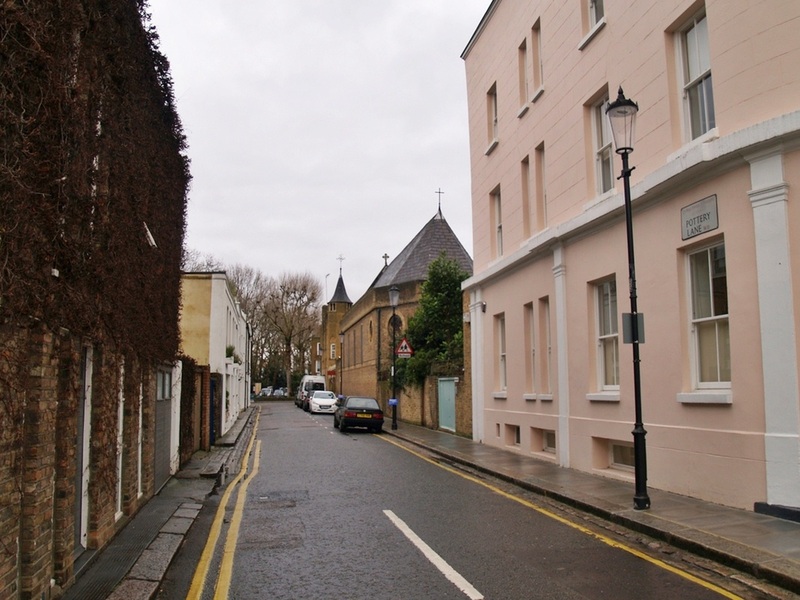 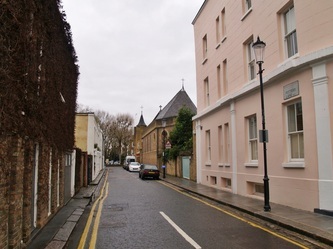 The Notting Hill grassy knoll (now surmounted by St John's church) was railed in as a "natural grandstand", from which spectators could watch the races.The main entrance to the course was off Portobello Lane (now Pembridge Rd) roughly where the green cab drivers cafe hut now stands. The stables and paddocks were situated alongside Pottery Lane locally known as "Cut-throat Lane" which was infamous for its "potteries and piggeries". The slums bordering the race course meant that the race meetings were easily accessed by some of the poorer inhabitants of the neighbourhood. 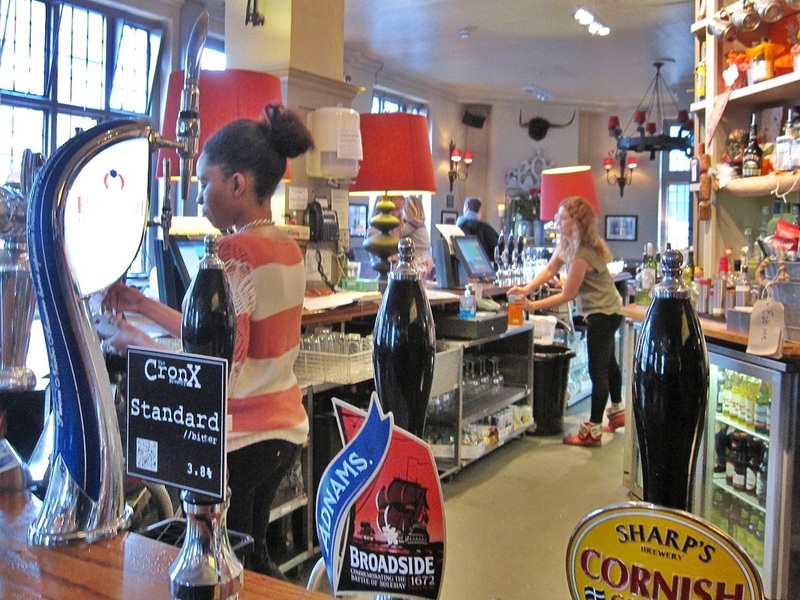 These were not the sort of customers that Whyte had in mind, and The Times newspaper complained of "the dirty and dissolute vagabonds of London, a more filthy and disgusting crew ...we have seldom had the misfortune to encounter." 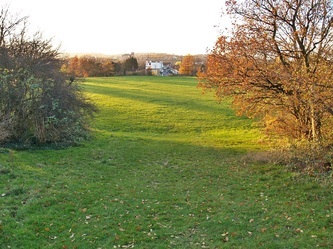 A public footpath traversing the land enclosed by Whyte's fences made it difficult to eject these less than appealing visitors, whose "villainous activities" were a continual source of trouble. 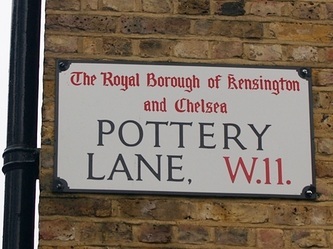 The Pottery Lane brick makers were living and working alongside pig-keepers who had been forced to move as Central London expanded westwards. 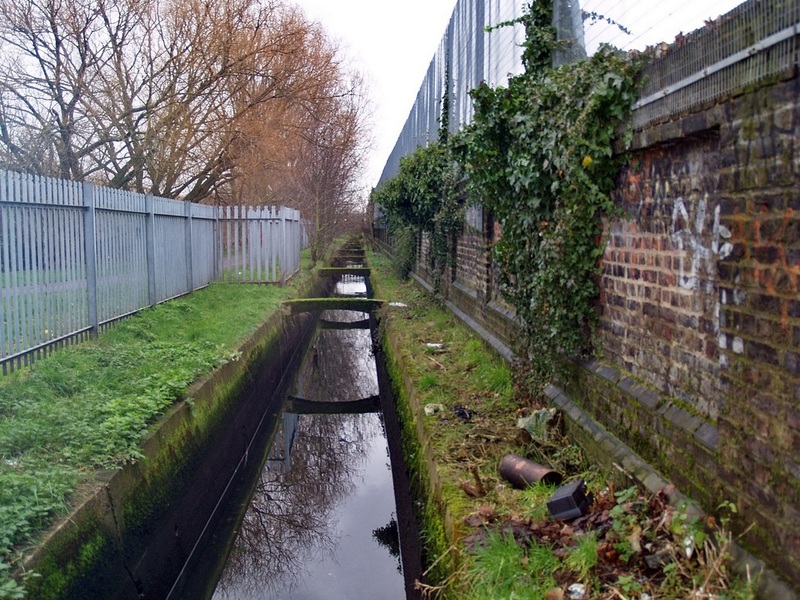 Sanitation was poor and fresh water scarce. Many families lived with the pigs in their hovels, which became slums. 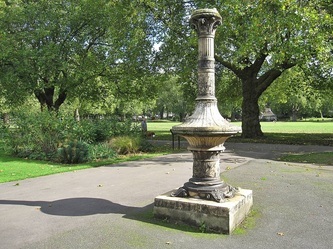 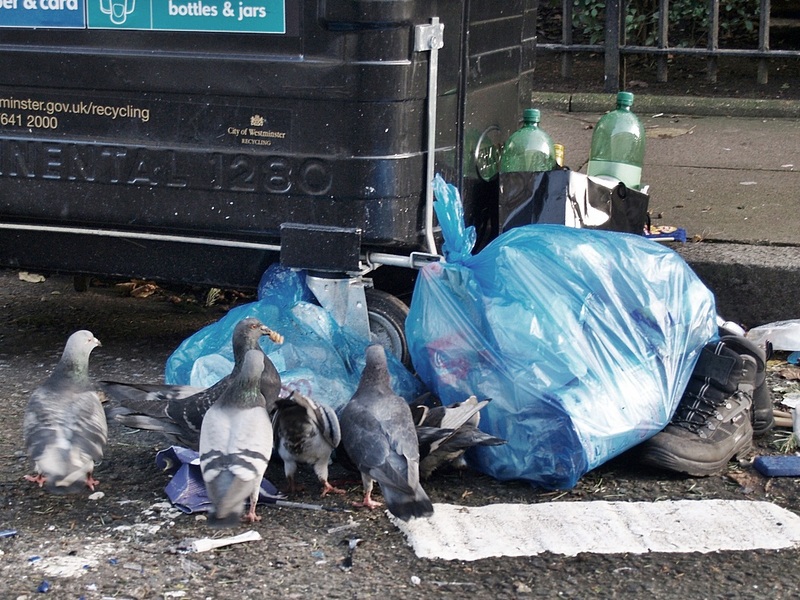 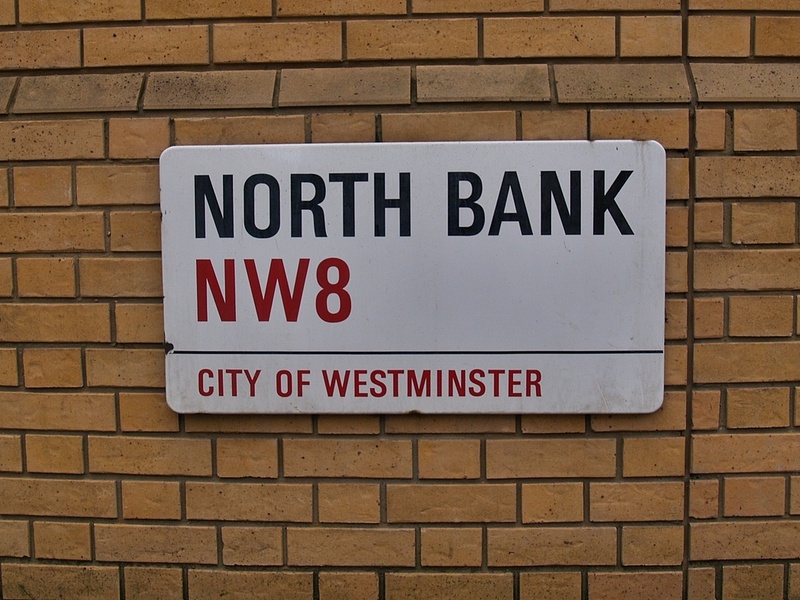 Charles Dickens described the area as "a plague spot scarcely equalled for its insalubrity by any other in London". A serious problem was the heavy clay soil characteristic of the neighbourhood (the clay was dug for the brick making), making for poor drainage, as a consequence of which the training ground became waterlogged and was unusable for long periods. 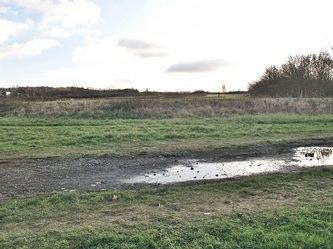 From 1837 to 1842 just 13 meetings were held, with many jockeys refusing to take part, claiming that the heavy clay ground made riding too dangerous. 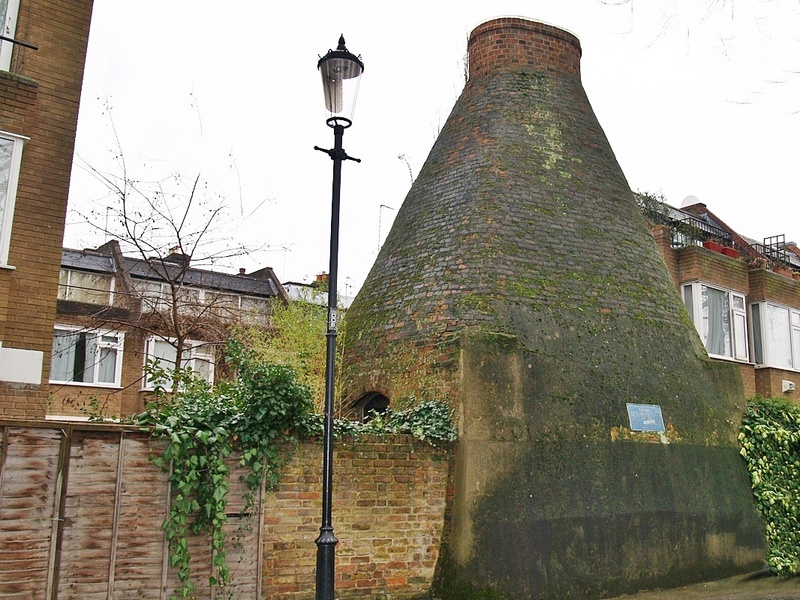 Bricks and tiles were stored in sheds lining Pottery Lane and were fired in large kilns - one of which remains to this day. 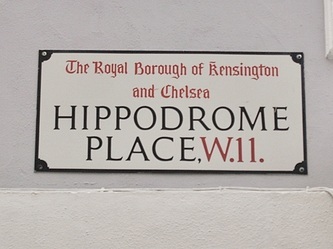 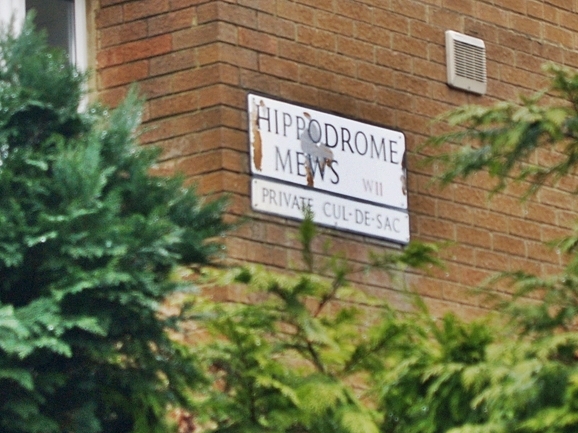 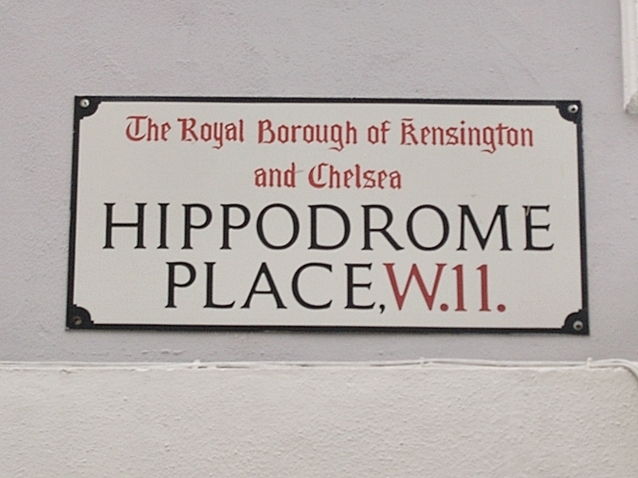 The financial position of Whyte and the Hippodrome (briefly renamed Victoria Park, Bayswater) continued to deteriorate and in 1842 he gave up the struggle, and relinquished his lease back to JW Ladbroke, who shortly thereafter resumed the development of the Ladbroke Estate, building crescents of houses on Whyte's circular race track giving the area the modern day name of Ladbroke Grove. This wasn’t the end of racecourses altogether in the area and there two more shortlived courses nearby - a course also called the Kensington Hippodrome built as part of Portobello Pleasure Gardens, featuring a track around the axis of Talbot Road & in the early 1850s there was a third Kensington Hippodrome an equestrian amphitheatre on the site of De Vere Gardens.